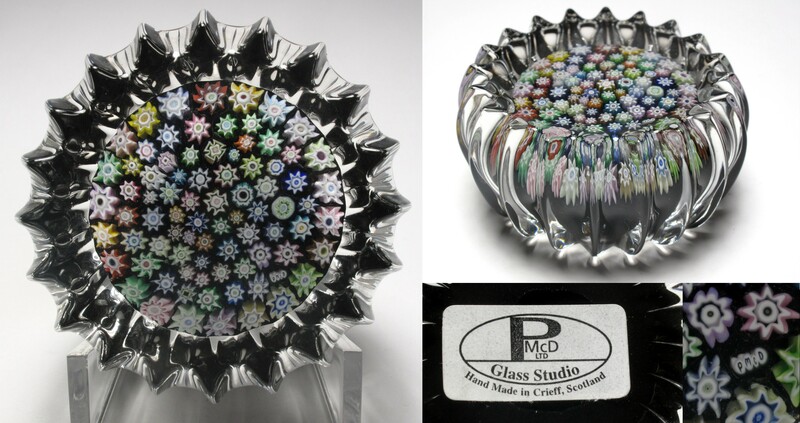 Peter McDougall started his glassmaking career as an apprentice at Strathearn Glass in Crieff, Scotland back in the 1960s. When Perthshire was formed in 1968, he left Strathearn to move to Perthshire and worked there in many positions, eventually becoming Manager and Chief Glassmaker. 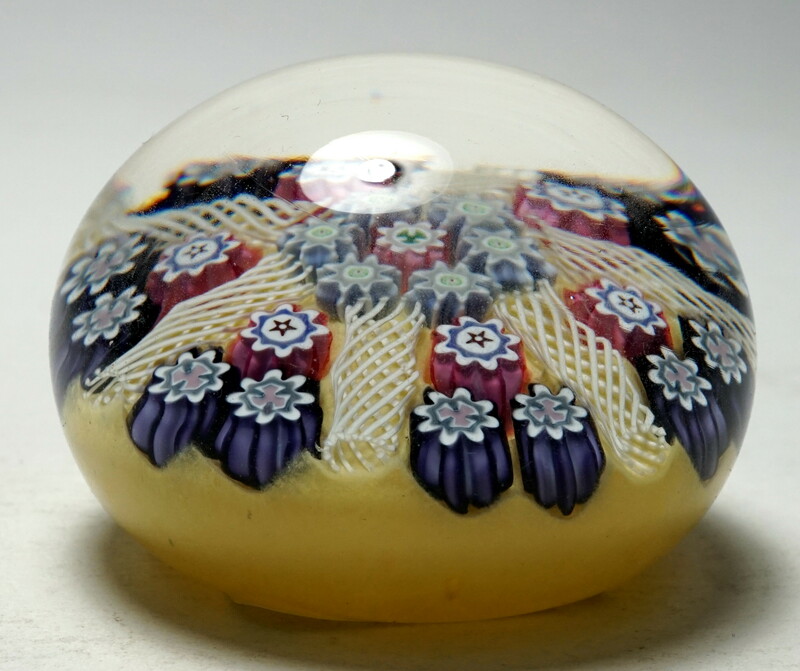 Perthshire Paperweights closed early in 2002. 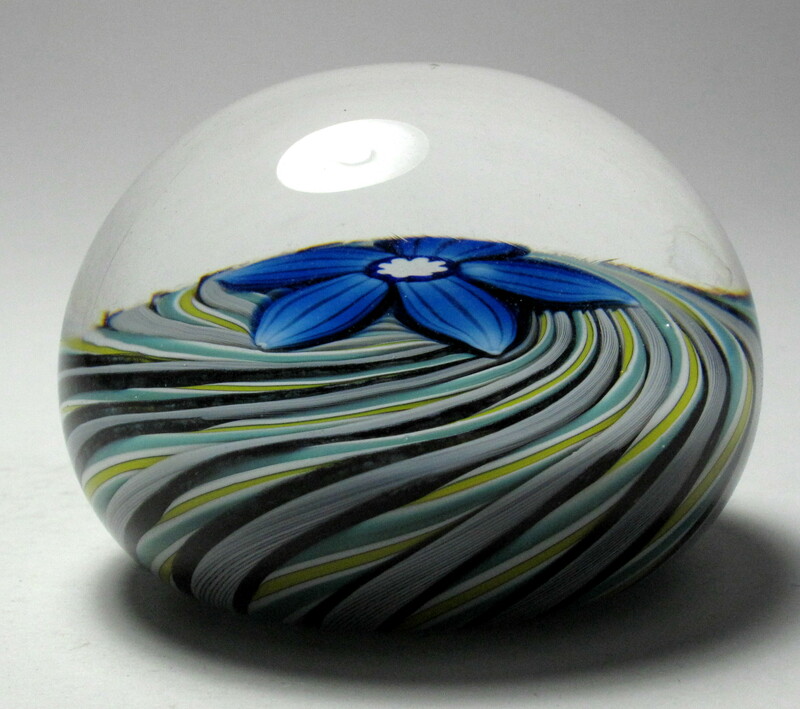 Peter continued making making high quality glass paperweights in his own glass studio PMcD Glass Studio Ltd. in Crieff, Scotland until early 2012. 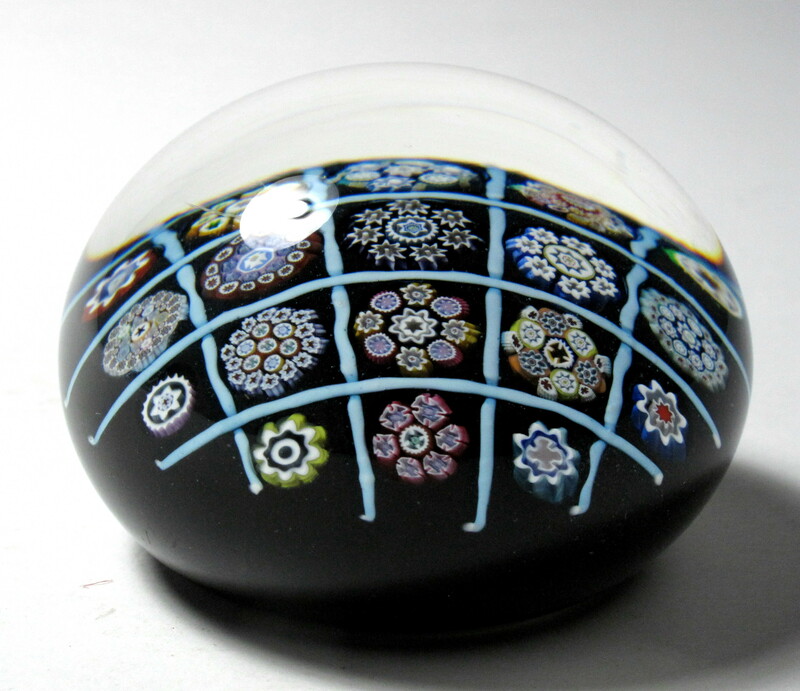 The studio is now closed but Peter plans to continue to make a limited number of paperweights in the future. 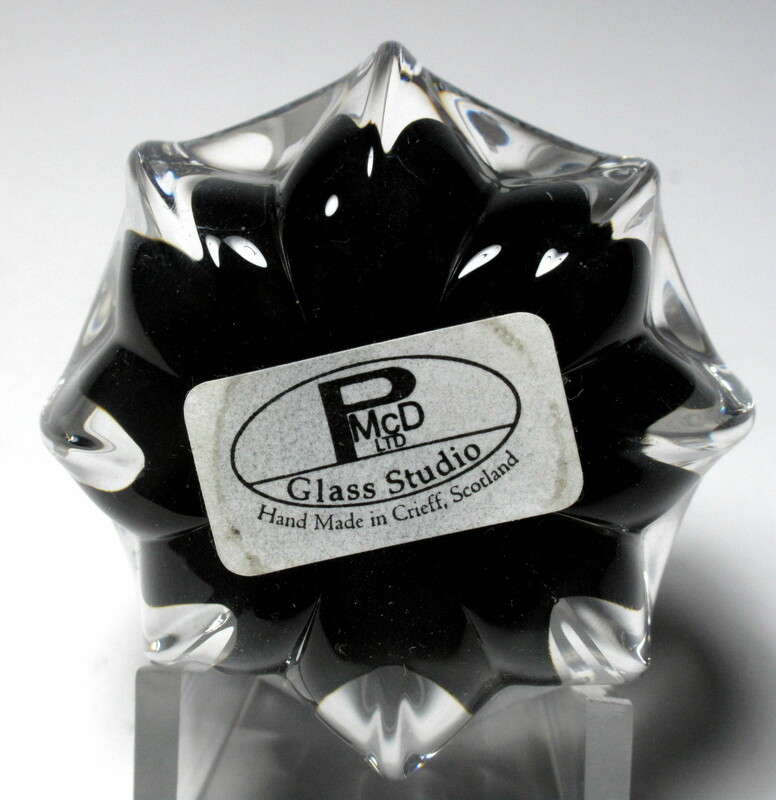 I am pleased to be able to offer this selection of PMcD paperweights. 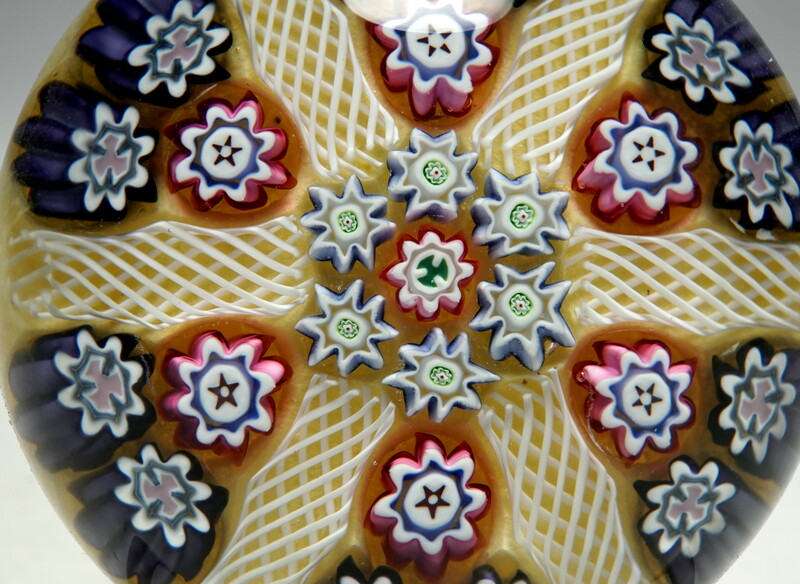 2448 Spectacular Peter McDougall 2007 Super Magnum Barber Pole Checquer Millefiori Paperweight with Complex Canes. circa 2007. 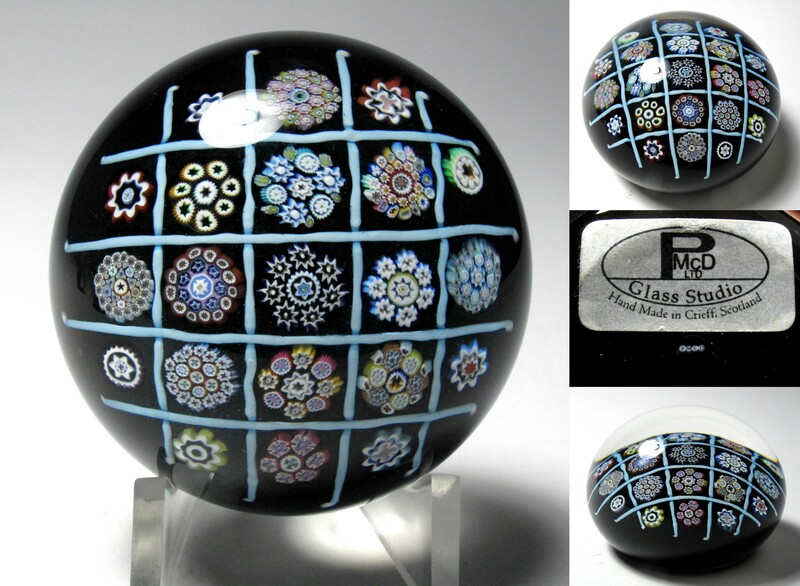 Spectacular huge paperweight with a Clichy barber pole checquer design. There are thirty three complex canes arranged in three concentric circles around a larger complex cane. The canes are separated by blue and white striped barber pole latticinio twists. Underneath is layer of white latticinio twists. 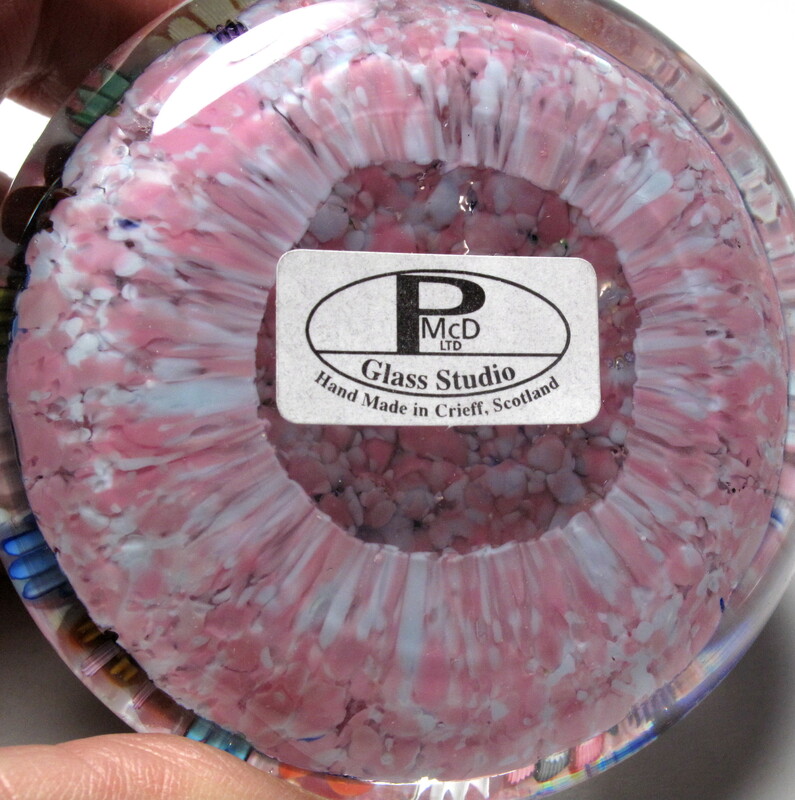 The paperweight is signed with a paper label "PMcD Glass Studio LTD, Handmade in Crieff Scotland." I could not find a signature cane in this design. 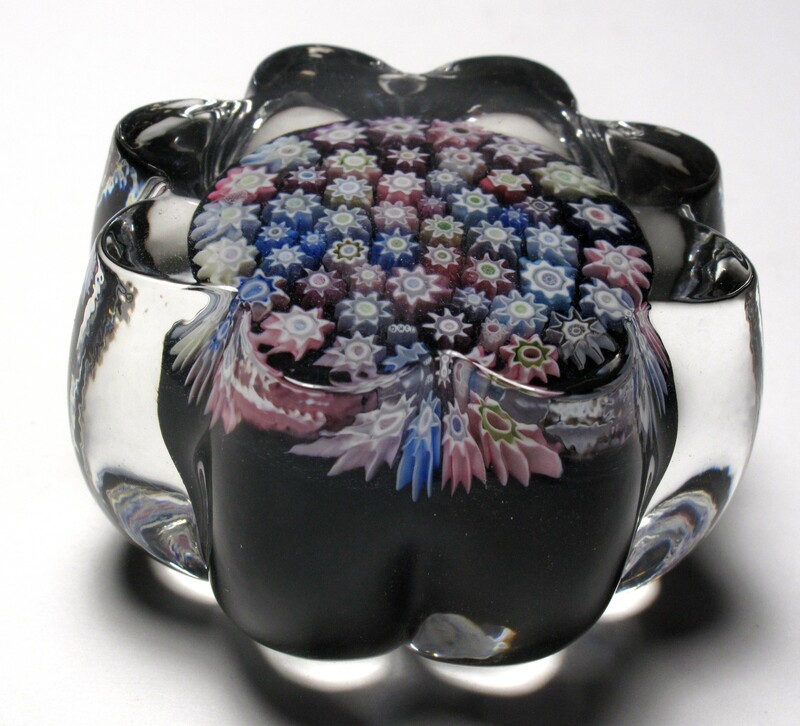 This paperweight was part of a special order placed in Spring 2007 and received by me later in 2007. 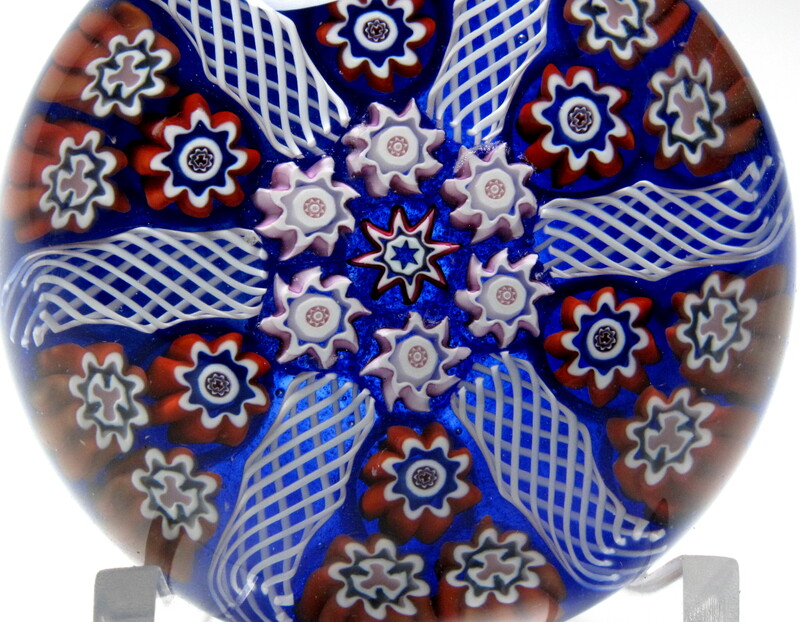 The design later showed up in Peter's offering described as Special Pieces for 2008. 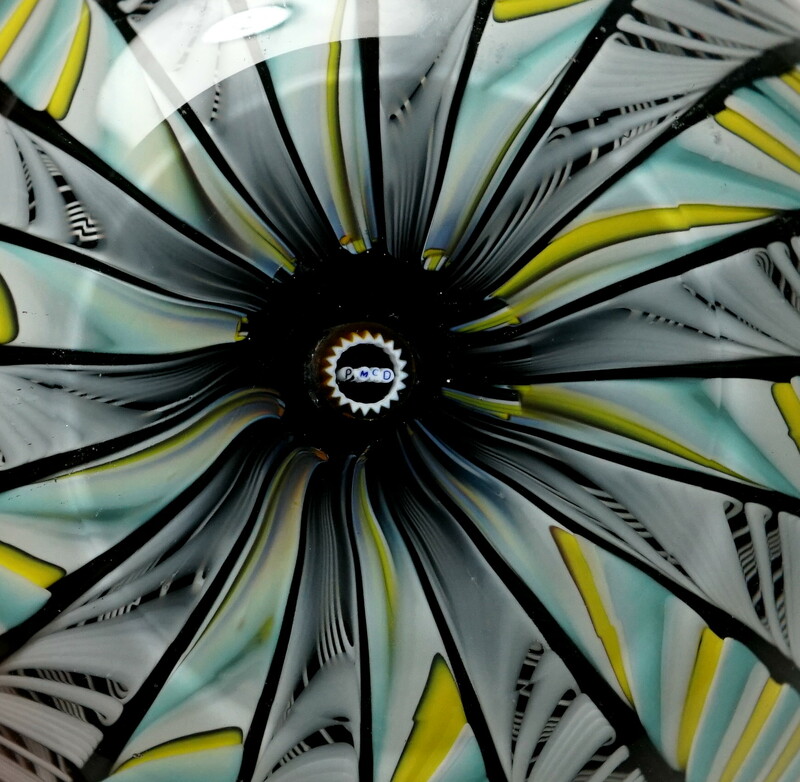 Peter McDougall started his glassmaking career as an apprentice at Strathearn Glass in Crieff, Scotland back in the 1960s. When Perthshire was formed in 1968, he left Strathearn to move to Perthshire and worked there in many positions, eventually becoming Manager and Chief Glassmaker. 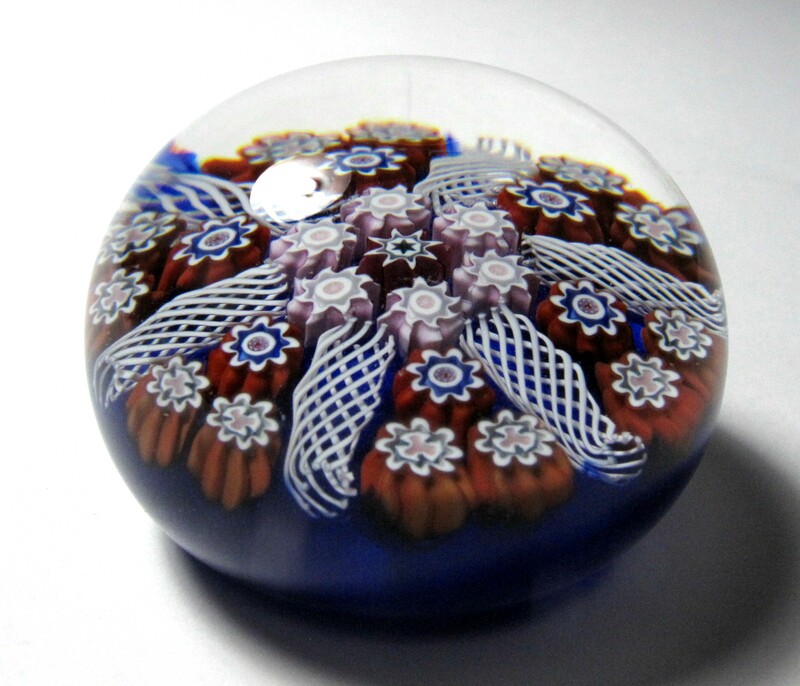 Perthshire Paperweights closed early in 2002 after the death of the owner Neil Drysdale. 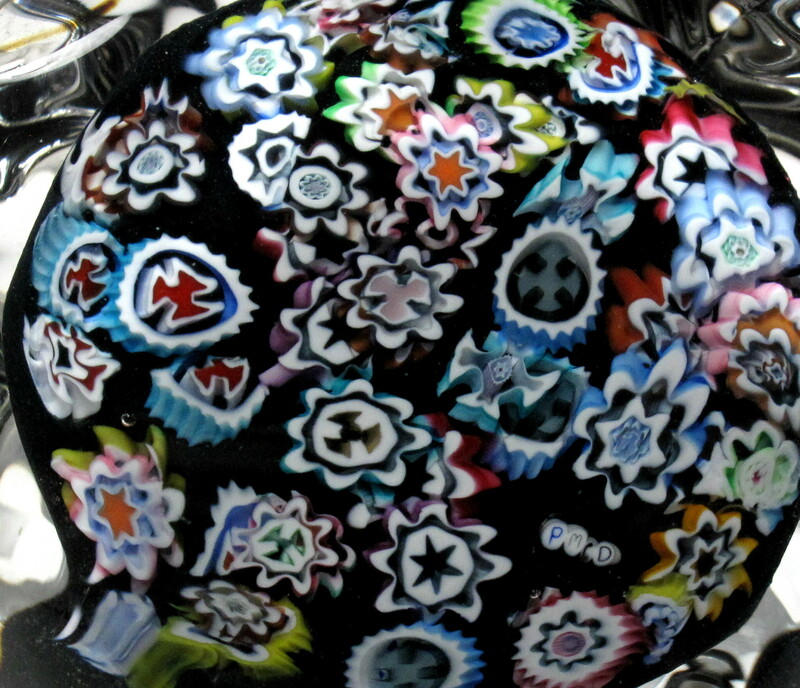 Peter McDougall then made high quality glass paperweights at his own glass studio, PMcD Glass Studio Ltd. in Crieff, Scotland from 2002 until early 2012. 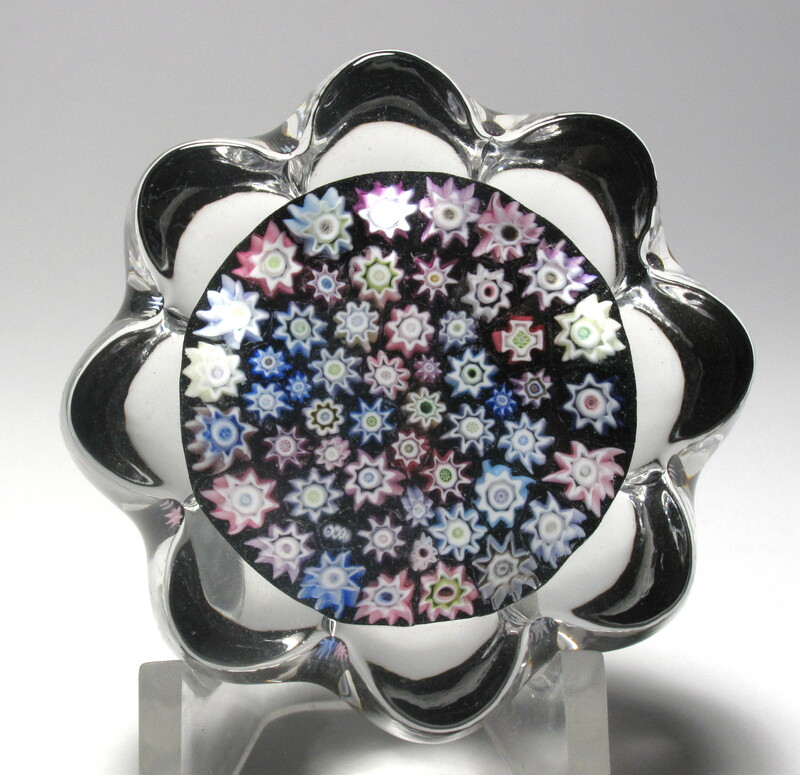 The studio is now closed but Peter plans to continue to make a limited number of paperweights in the future. Extra Large Size: 4 5/16" diameter by 2 13/16" high. The base is ground concave. 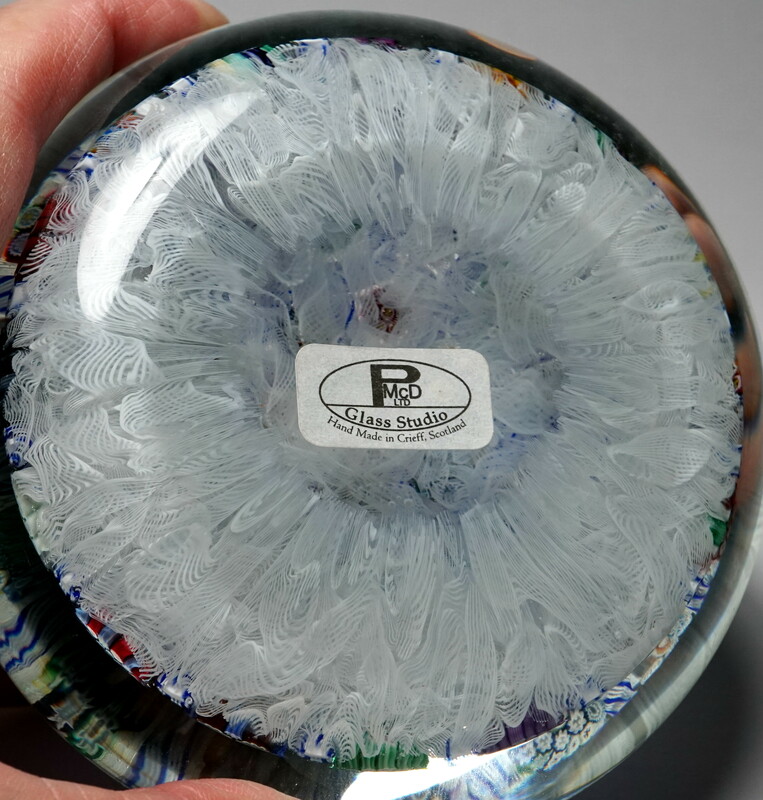 This paperweight is huge and weighs almost three pounds ( 44 ounces or 2 pounds 12 ounces). Condition: Outstanding original condition with no scratches, chips or cracks. 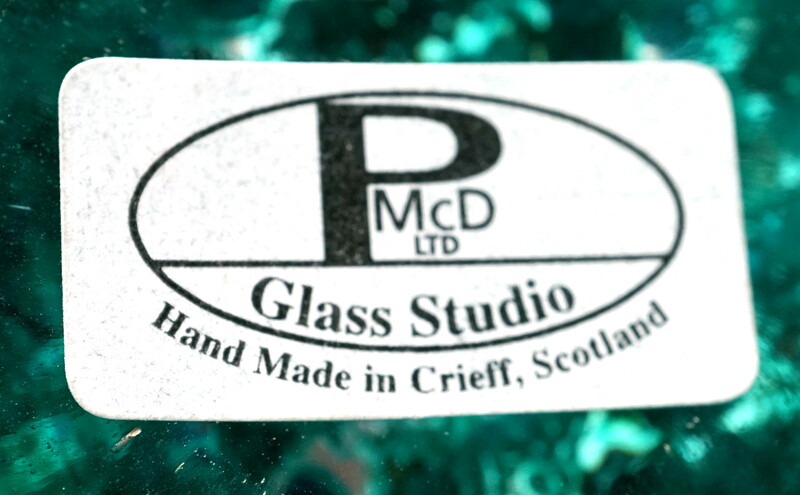 Signature: Signed with a paper label "PMcD Glass Studio LTD, Handmade in Crieff Scotland." I could not find a signature cane in this design. $1,395 postage paid in the US. 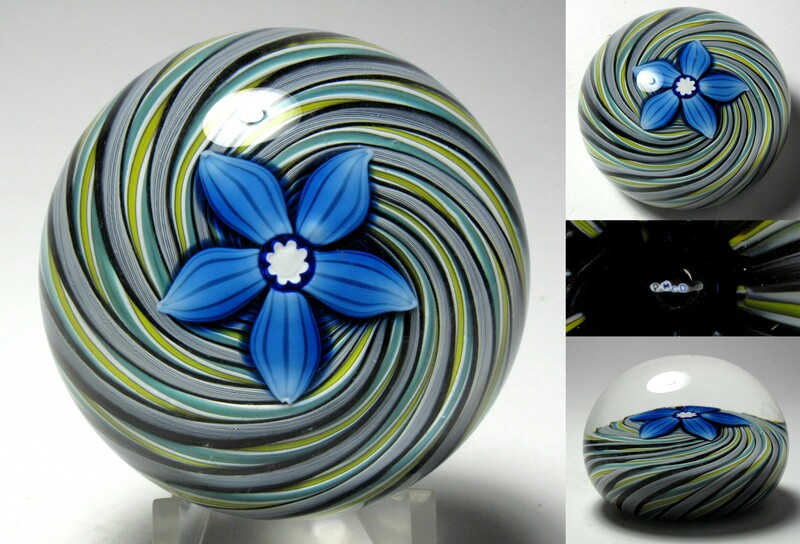 1822 Peter McDougall (PMcD) Medium Clichy Style Swirl with Flower Paperweight. circa 2003-2006. 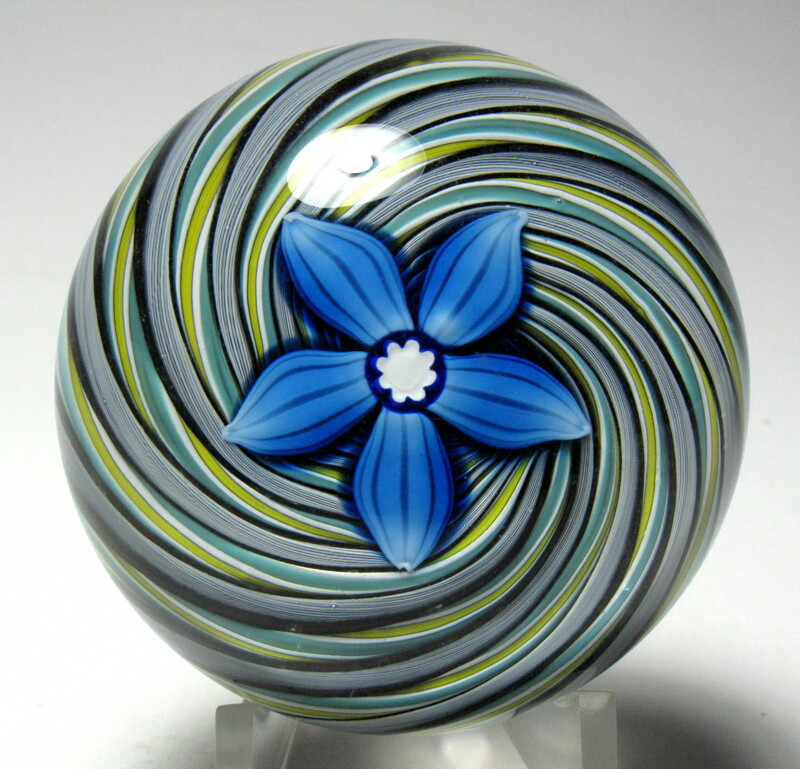 This paperweight features a large blue flower in the center of a Clichy style swirl paperweight. 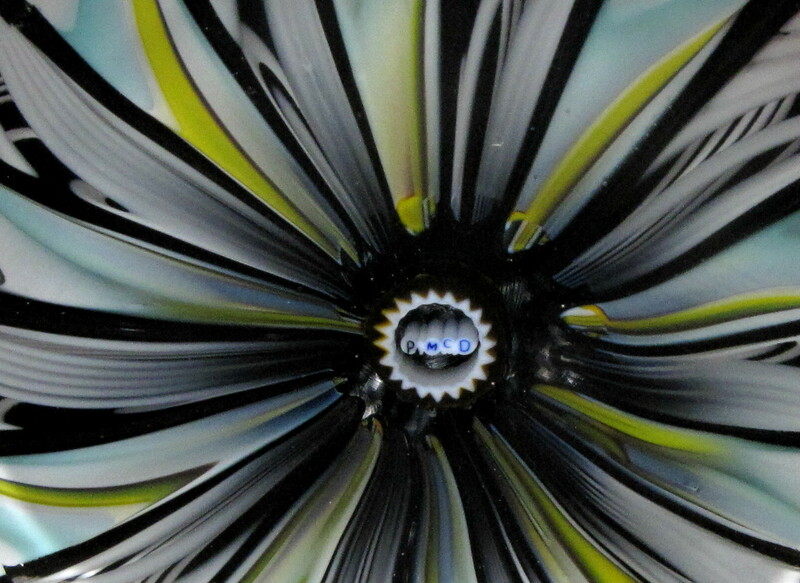 The flower has five striped petals with a nice white millefiori center. 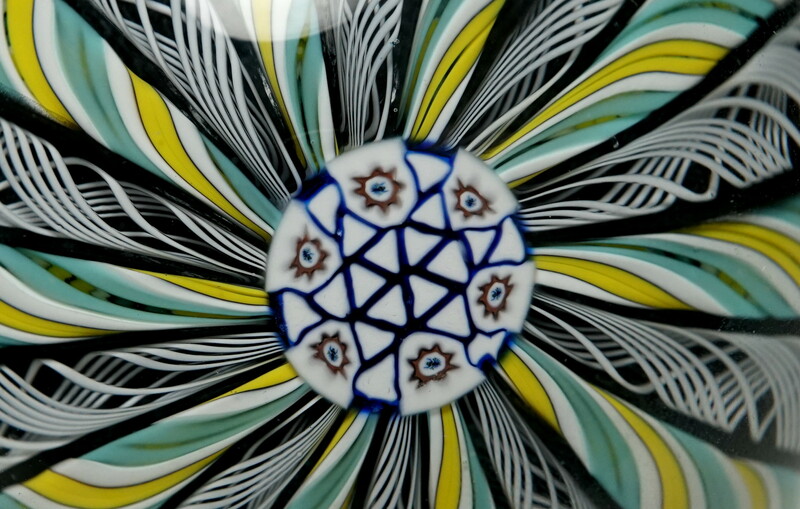 The swirls wrap around to the bottom of the paperweight. It is signed on the bottom with a complex cane made from four separate letter canes forming the signature PMcD. This paperweight does not have a paper label. This is a hard to find design. Peter offered this design only from 2003-2006. Size: 2 7/16" diameter by 1 3/4' high. The bottom ground concave.. Condition: Outstanding condition with no scratches, chips or cracks. Signature: Signed on the bottom with a PMcD cane. The signature is small and some people may have difficulty reading the signature on these weights. This paperweight does not have a paper label. 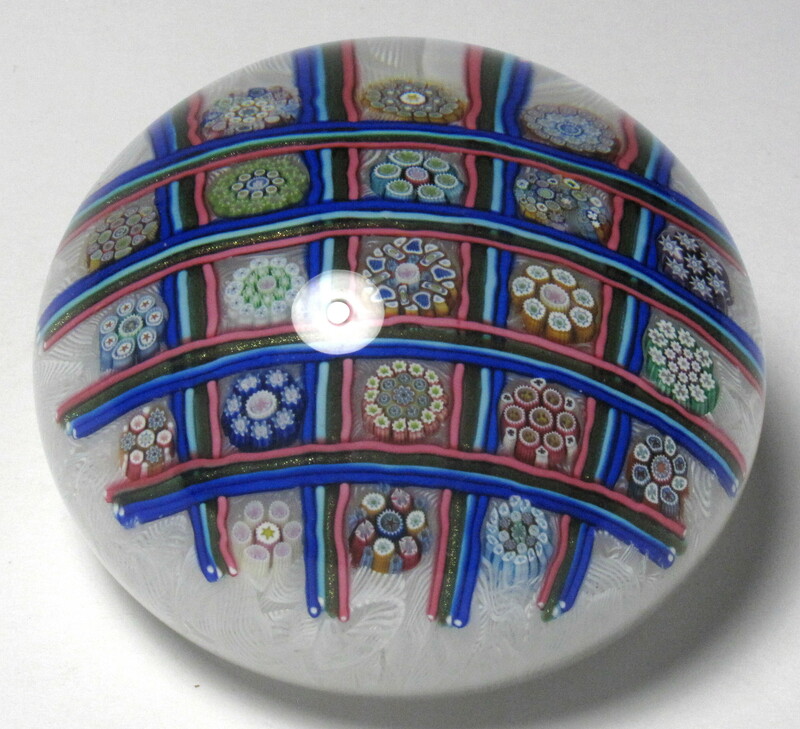 2520 Peter McDougall (PMcD) Miniature Paneled Millefiori Paperweight with White Twists. 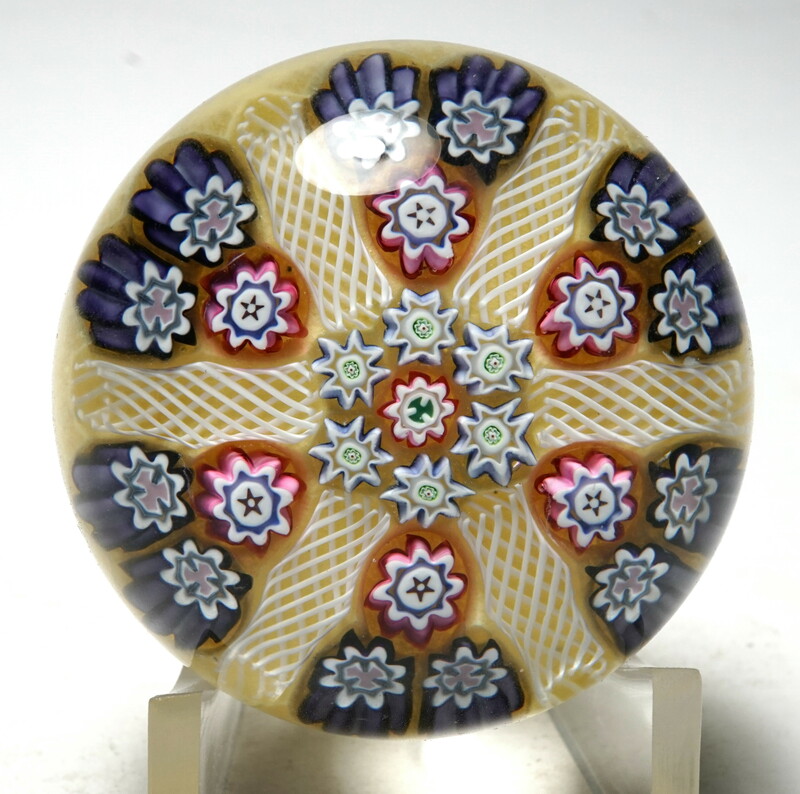 Attractive miniature paperweight with six panels each containing a 1-2 millefiori pattern. Each panel is separated by a white twist cane. There is a nice center cane. 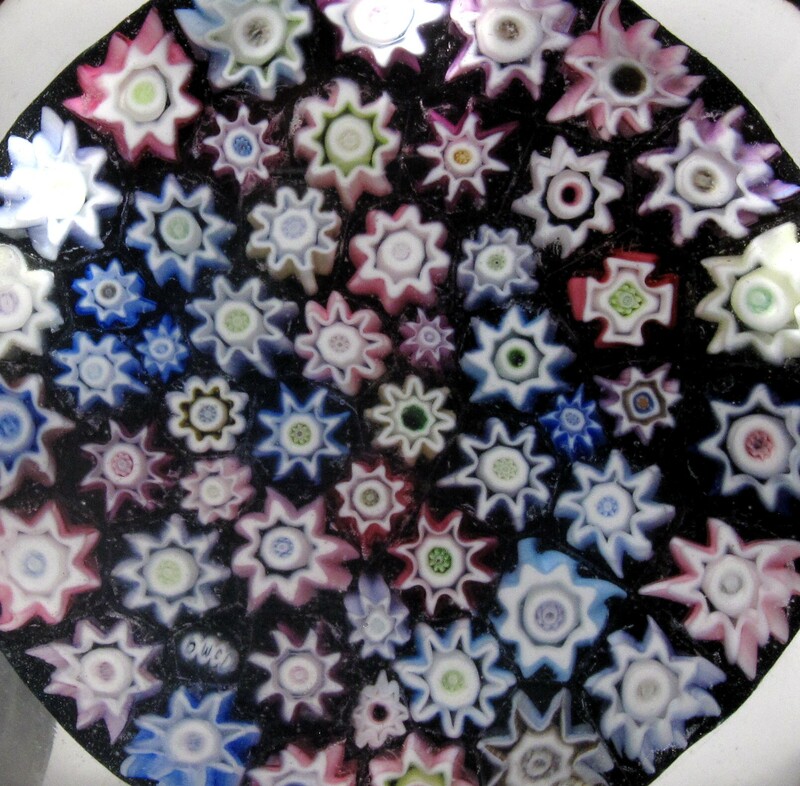 The millefiori canes are red, purple, and blue. The design is set over an opaque yellow ground. 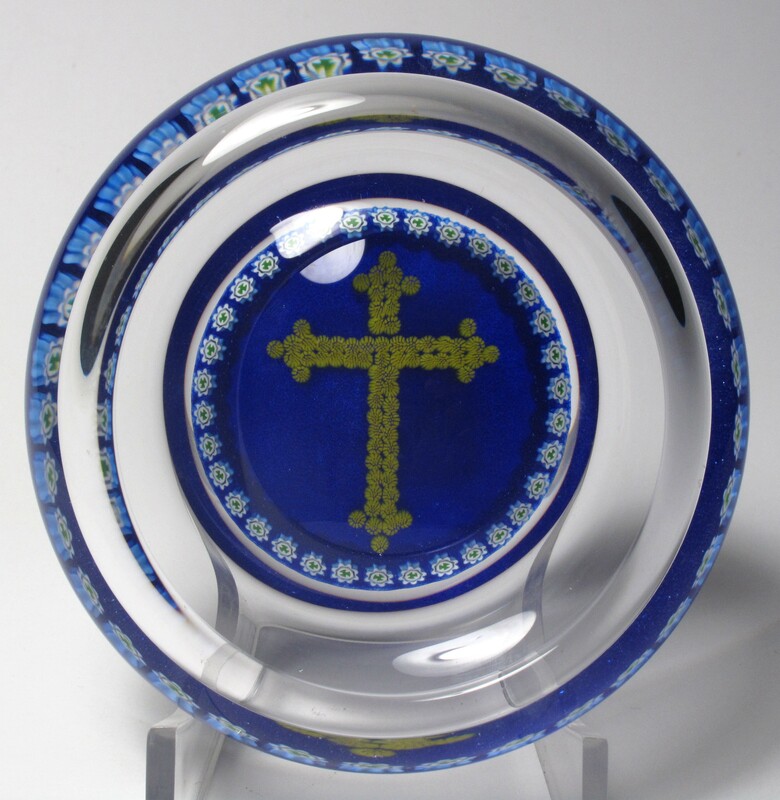 It is signed on the base with a complex cane made from four separate letter canes forming the signature PMcD. 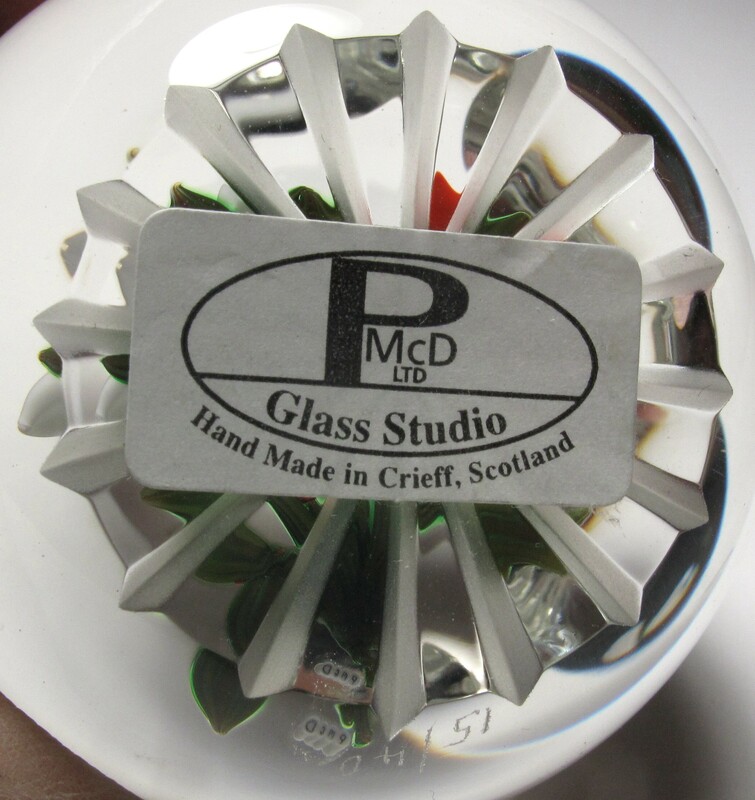 It also has a paper label "PMcD Glass Studio LTD, Handmade in Crieff Scotland." Note: This is an especially small miniature paperweight. It is 1 13/16" diameter. Ignore the white areas, they are glare from the lights. 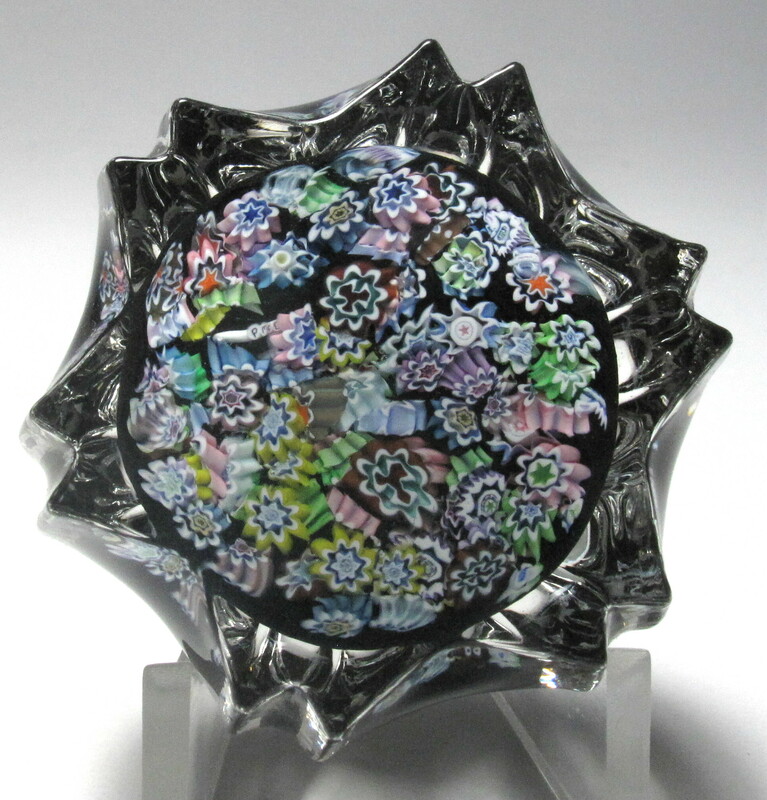 Miniature Size: 1 13/16" diameter by 1 5/16” high. Signature: Signed with a complex "PMcD" cane on the base. The signature is tiny and can be hard to see without magnification. 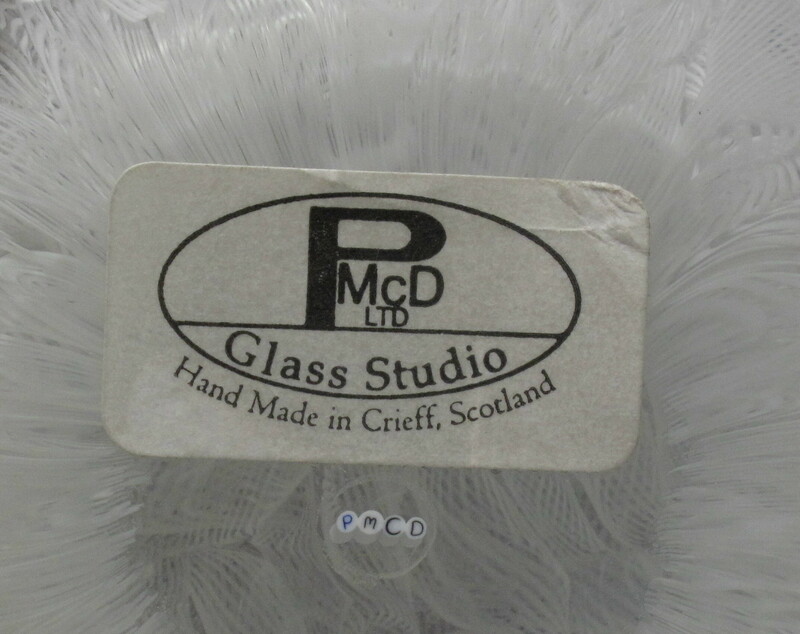 It also has a paper label "PMcD Glass Studio LTD, Handmade in Crieff Scotland." 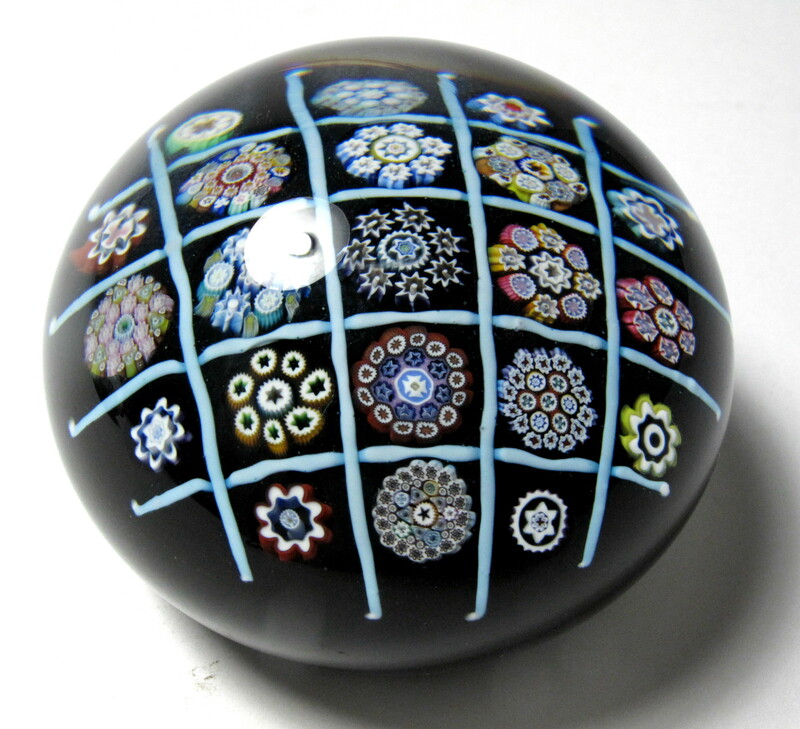 3186 Peter McDougall Medium Ribbed Millefiori Paperweight. 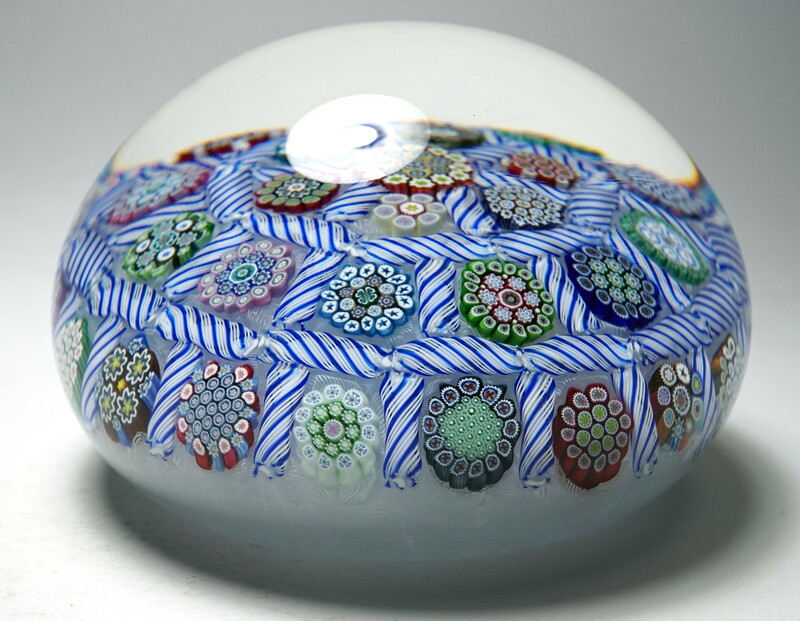 This paperweight consists four concentric circles of millefiori around a central millefiori cane. Although it is not a true concentric, it gives the appearance of a concentric because the pattern is so regular. The ground is black. It is signed in the design with a complex cane made from four separate letter canes forming the signature PMcD (as shown in the close-up). This is often called a pressed weight because a mold is used to form the outside ribbing. The top is flattened. The ribbing gives the glass a real glittery appearance as you can see in the picture. The picture does not do justice to this paperweight. Ignore the white areas, they are glare from the lights. Medium Size: Just over 2 1/2" diameter by just over 1 1/4" high. 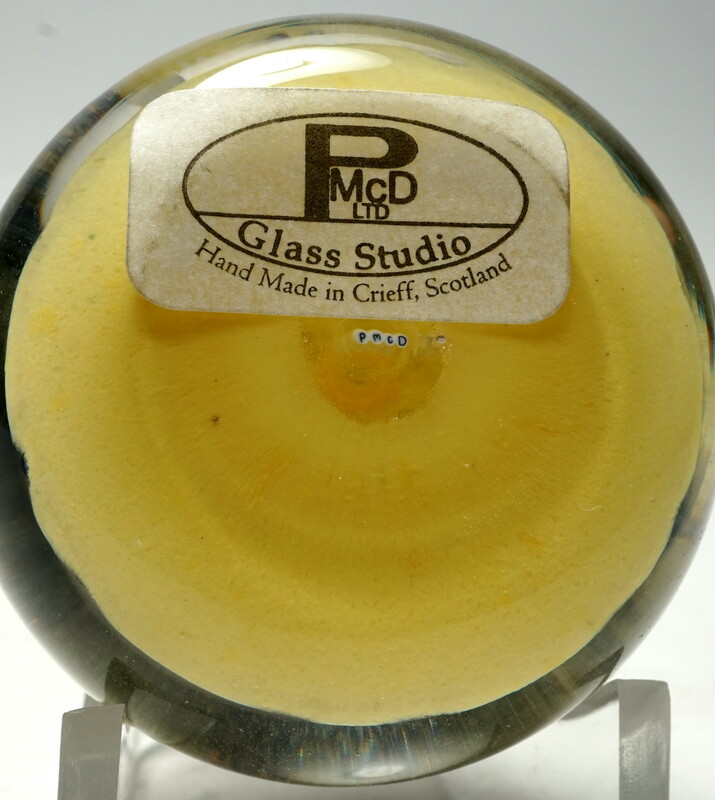 Signature: Signed with a complex cane in the design and it also has a paper label "PMcD Glass Studio LTD, Handmade in Crieff Scotland." 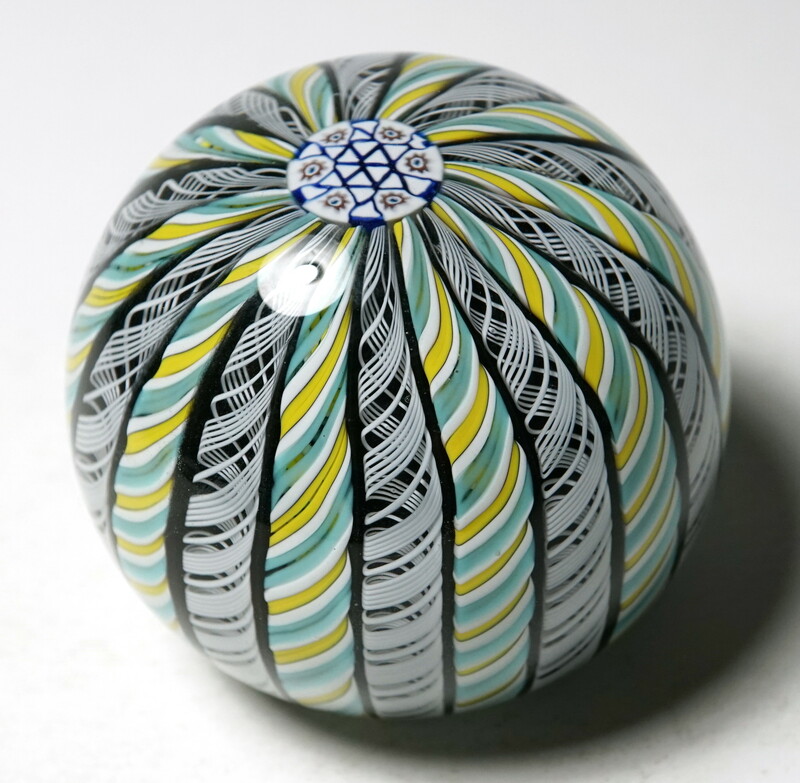 2357 Peter McDougall Small Checkerboard Paperweight with Complex Canes. 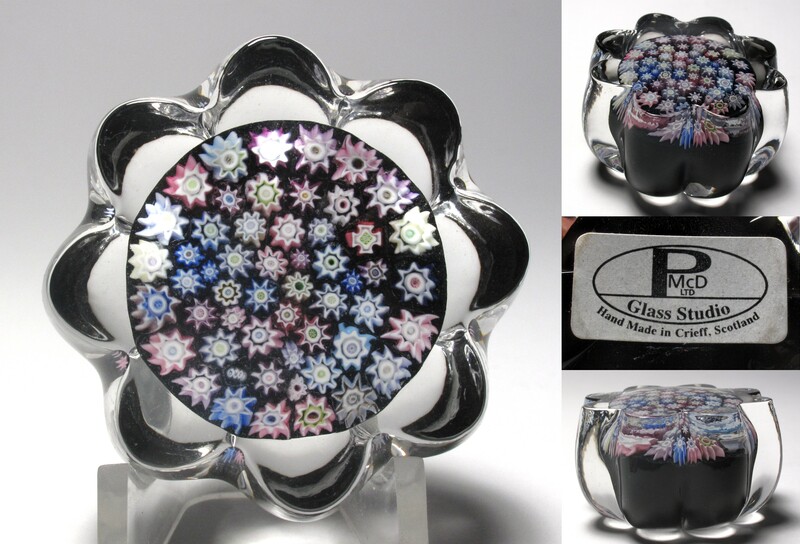 This paperweight features 21 different millefiori canes, thirteen of them complex canes, over an almost opaque dark purple / black ground. 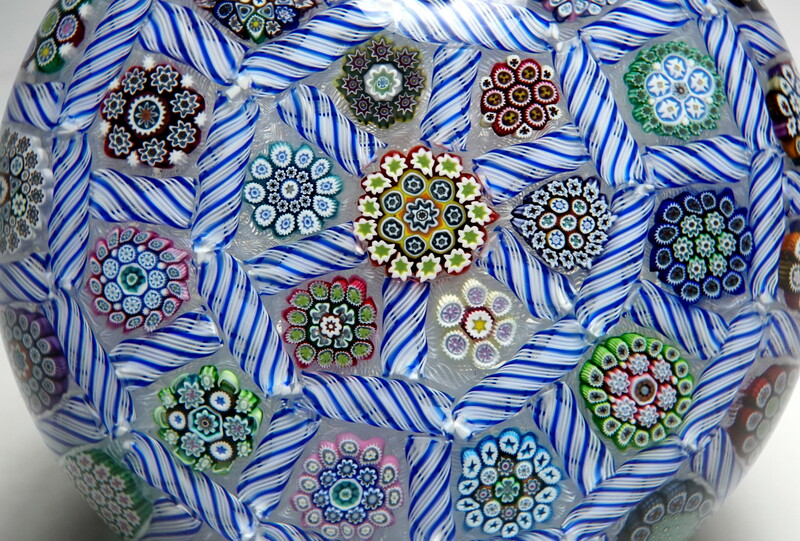 The millefiori canes are arranged in a checkerboard pattern with stringers of light blue glass defining the checkerboard. A great example of this popular design. 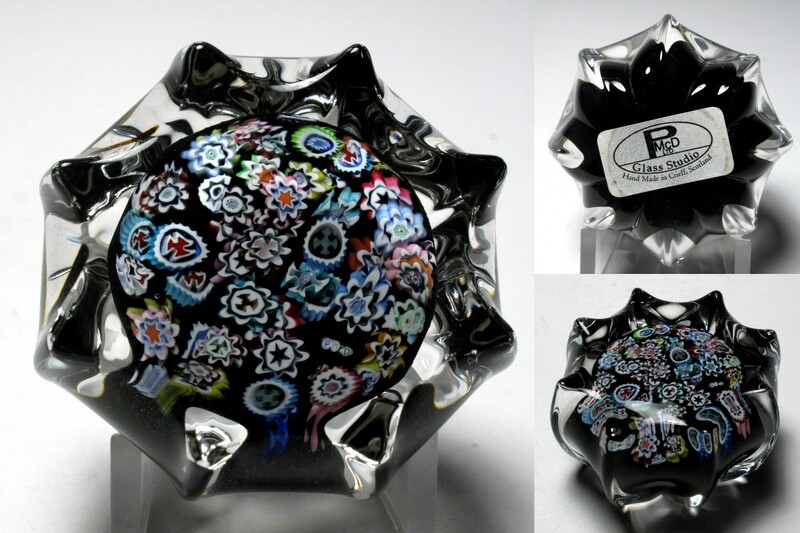 The pictures do not do justice to this paperweight. Ignore the white areas, they are glare from the lights. 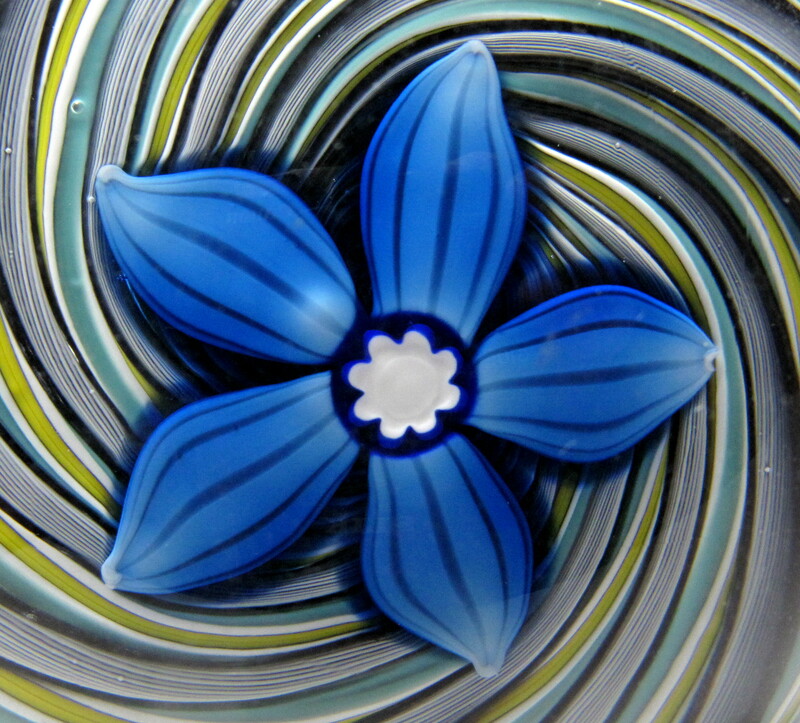 Peter McDougall started his glass making career as an apprentice at Strathearn Glass in Crieff, Scotland back in the 1960s. When Perthshire was formed in 1968, he left Strathearn to move to Perthshire and worked there in many positions, eventually becoming Manager and Chief Glassmaker. 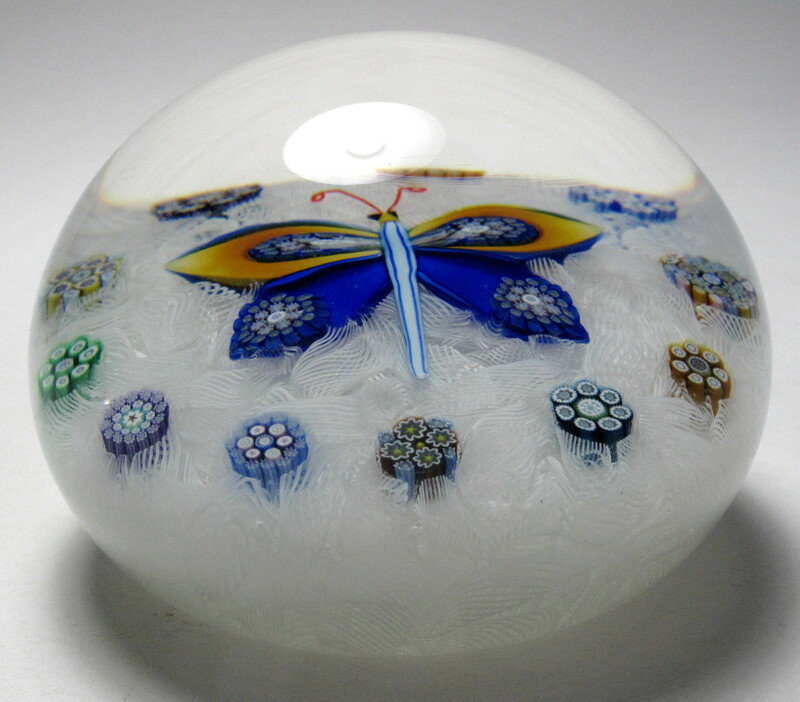 Perthshire Paperweights closed early in 2002 after the death of the owner Neil Drysdale. 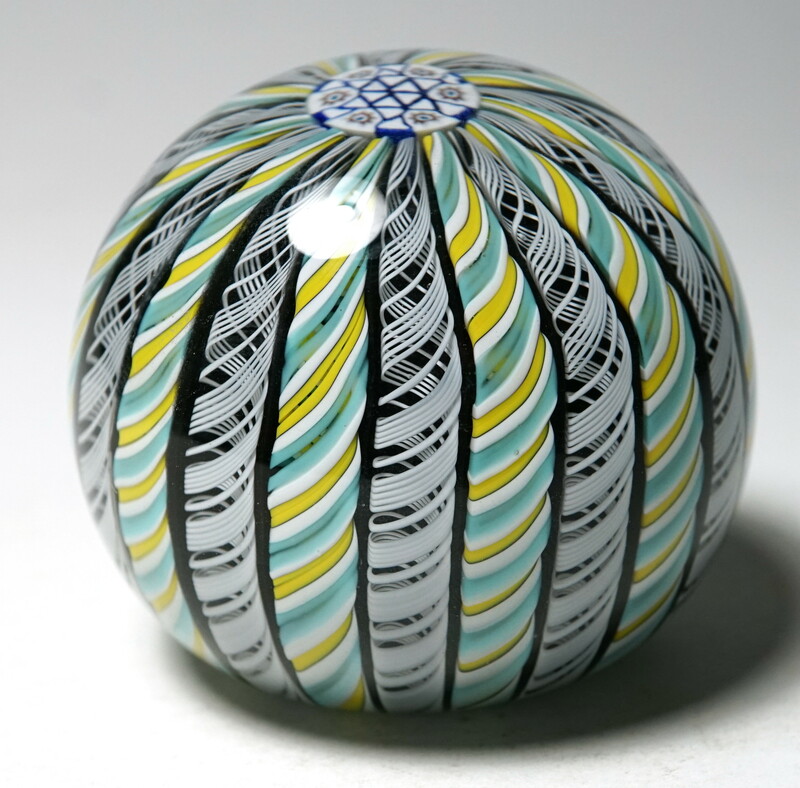 Peter McDougall then made high quality glass paperweights at his own glass studio, PMcD Glass Studio Ltd. in Crieff, Scotland from 2002 until early 2012. 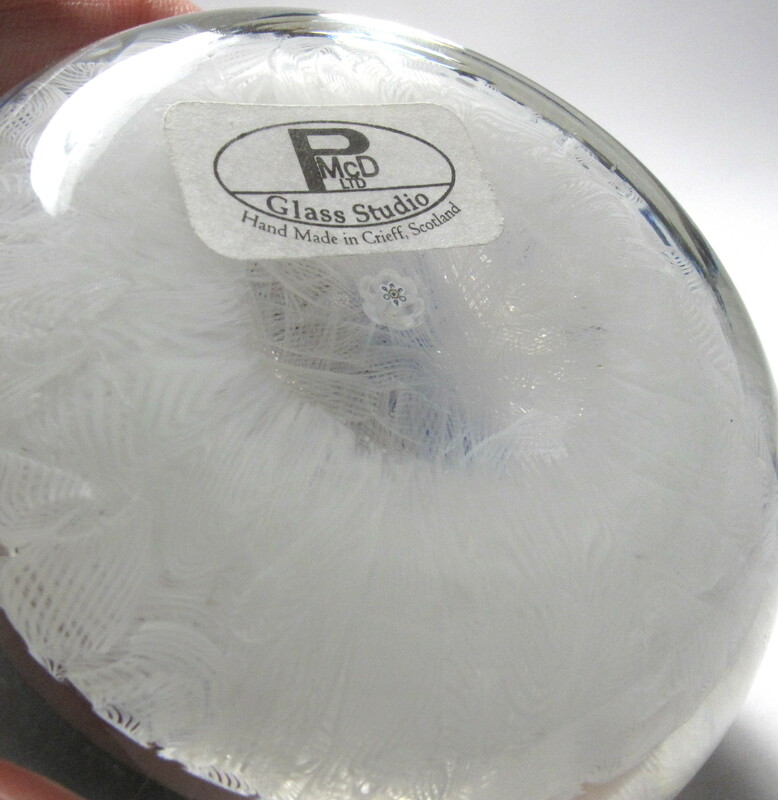 The studio is now closed but Peter plans to continue to make a limited number of paperweights in the future. Small Size: 2 1/8” diameter by 1 1/2” high. Condition: Excellent condition with no scratches, chips or cracks. The label is a little worn. Signature: Signed and dated with a complex PMcD cane on the bottom and it also has a paper label "PMcD Glass Studio LTD, Handmade in Crieff Scotland." 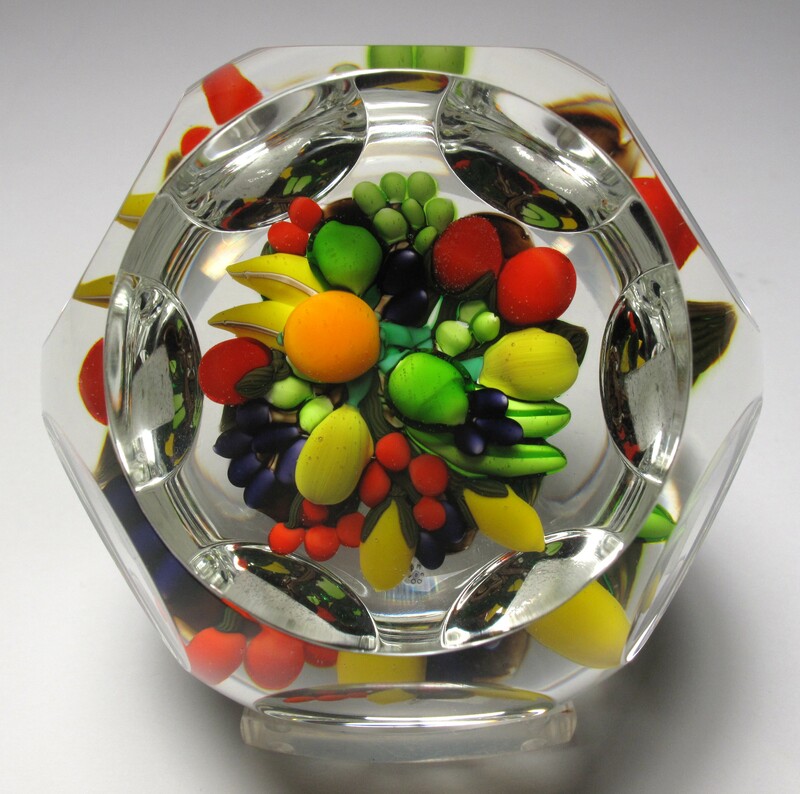 2887 Spectacular Peter McDougall Karen Maxwell Special 2010 Collection Faceted Fruit Bouquet Paperweight. 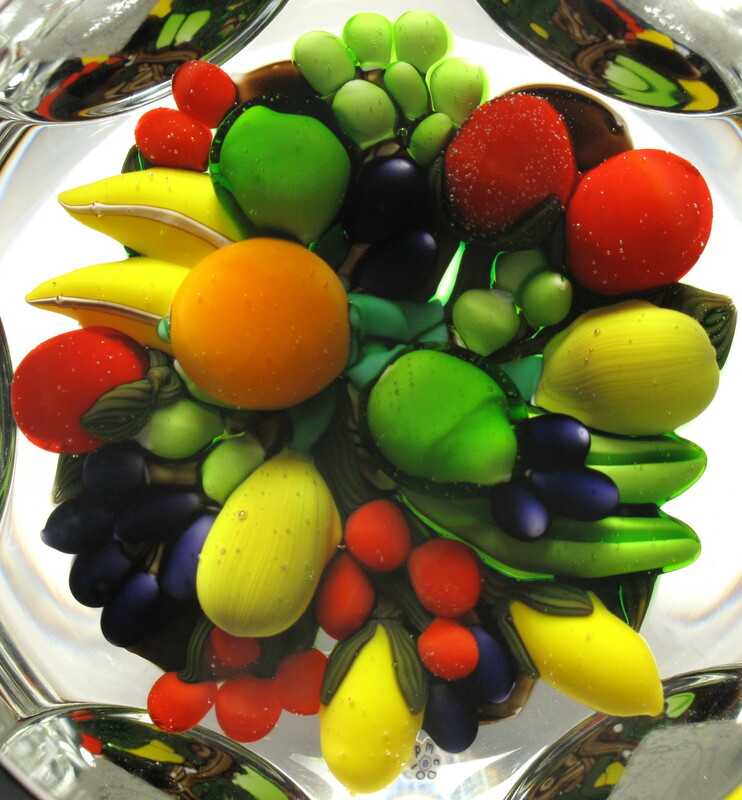 circa 2010.Spectacular bouquet arrangement of all sorts of fruit in a large faceted paperweight. 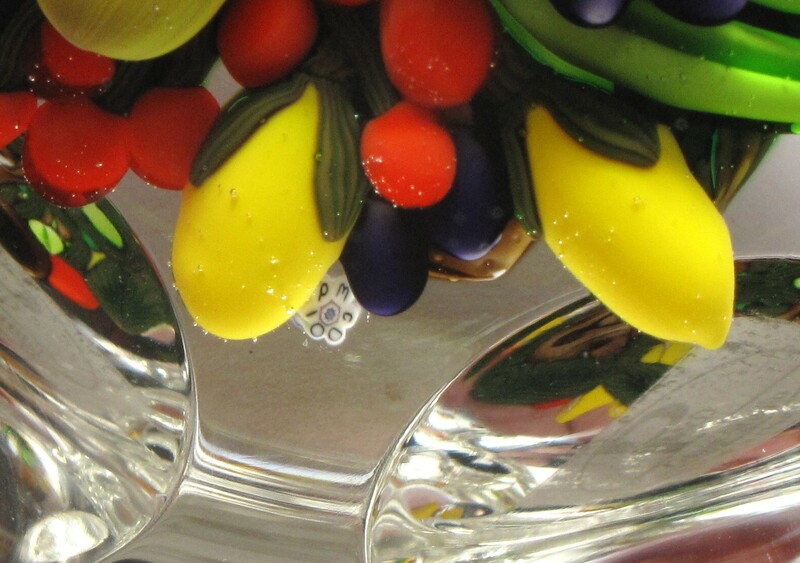 The lampwork fruit arrangement is by Karen Maxwell and encasement by Peter McDougall. The paperweight is signed next to the fruit with Peter's complex signature and date cane "PMcD 10". It is faceted with a large top facet and 12 side facets. 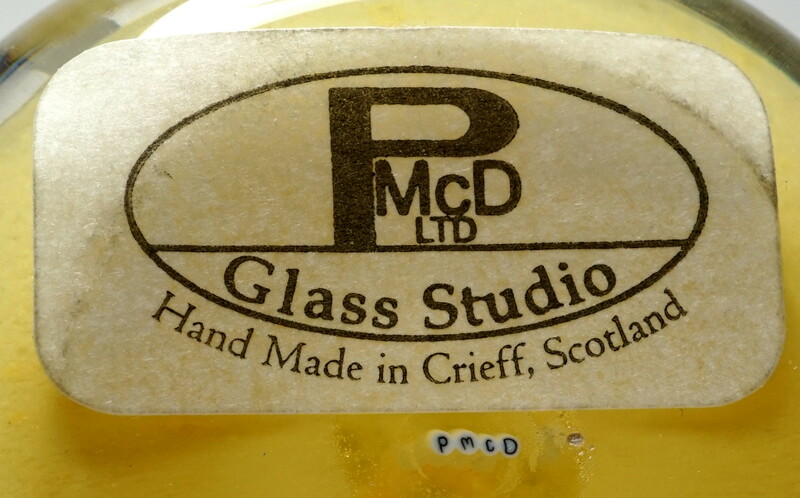 It also has a paper label "PMcD Glass Studio LTD, Handmade in Crieff Scotland." 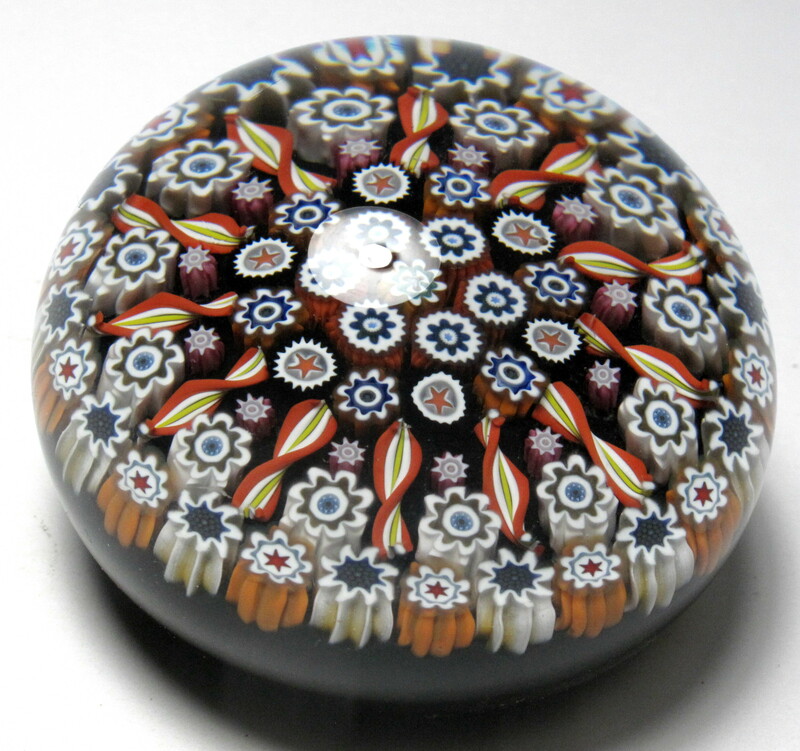 This paperweight was one of the special annual editions made in only in 2010. It was designated Collection 2010 Midyear #2. 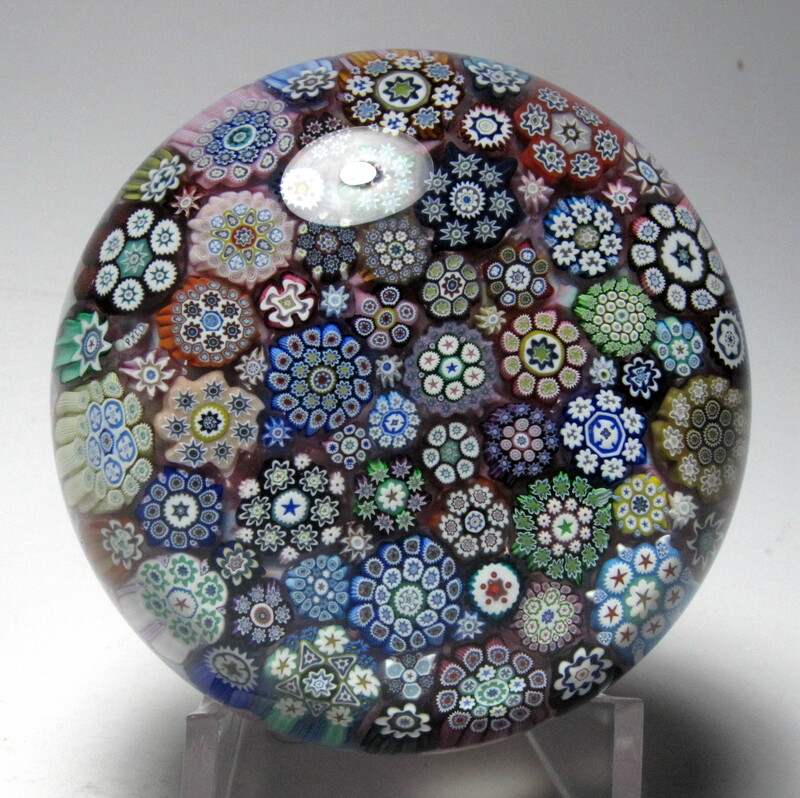 Karen Maxwell did the lampwork for this paperweight. 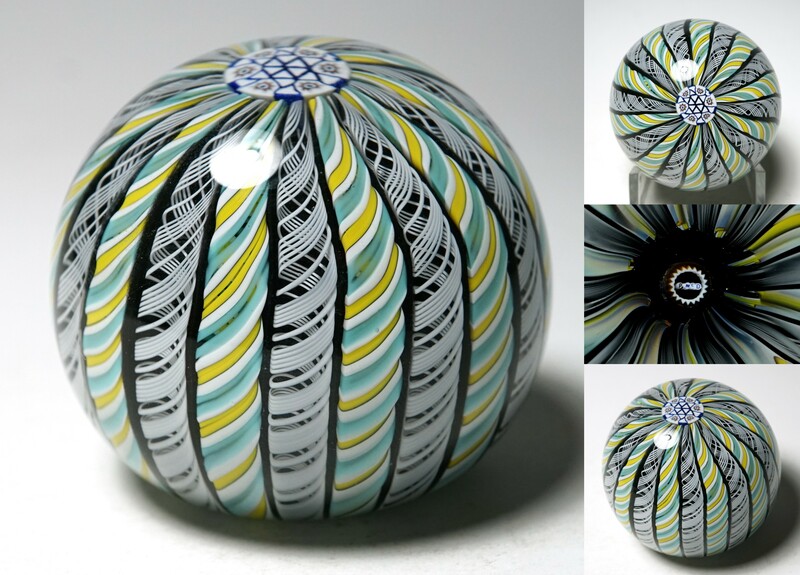 She previously worked at Perthshire Paperweights and is identified as the lampwork artist on several Peter McDougall paperweights. I was unable to learn anything more about her background. Large Size: 2 13/16" diameter by 2 3/16" high. The base is ground concave. It is faceted with a large top facet and 12 side facets. Signature: Signed with a complex "PMcD 10" signature / date cane next to the fruit. 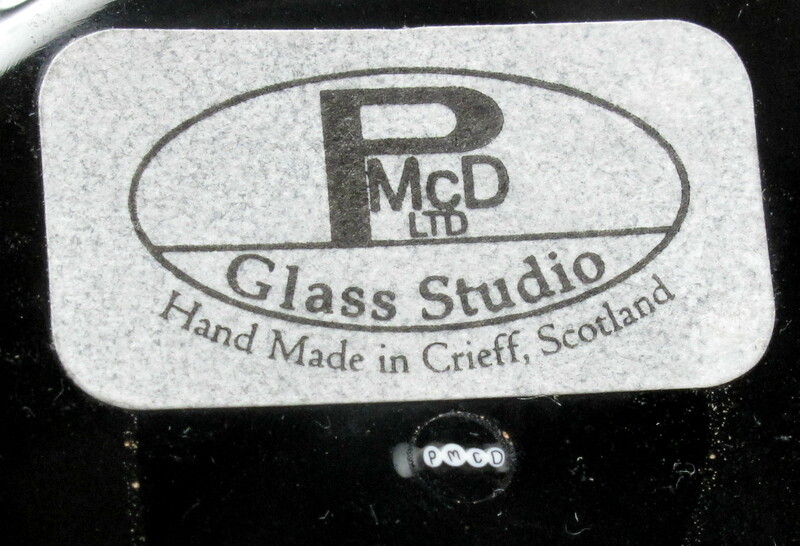 It also has a paper label "PMcD Glass Studio LTD, Handmade in Crieff Scotland." 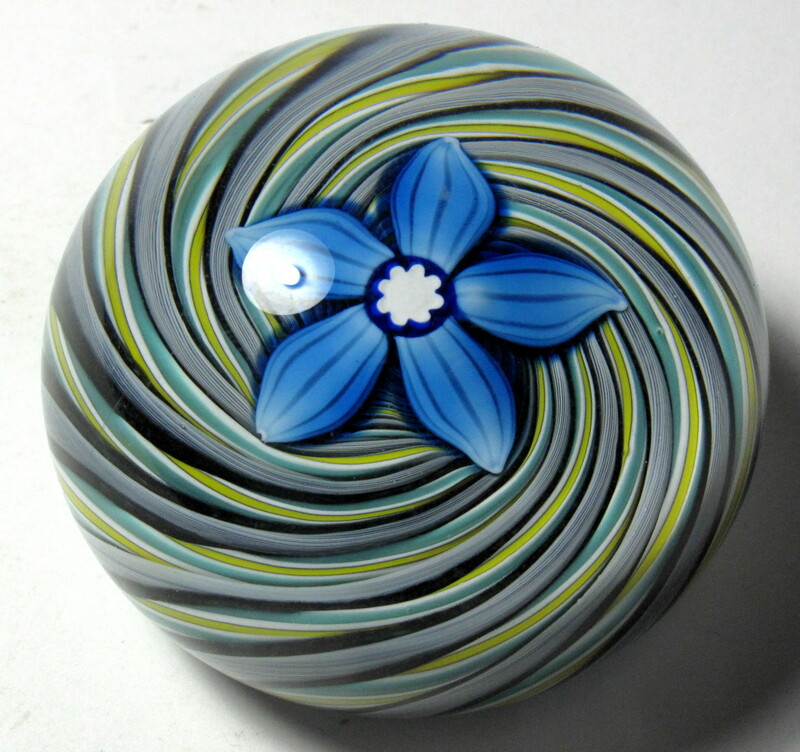 3217 Peter McDougall Small Daisy Millefiori Paperweight. 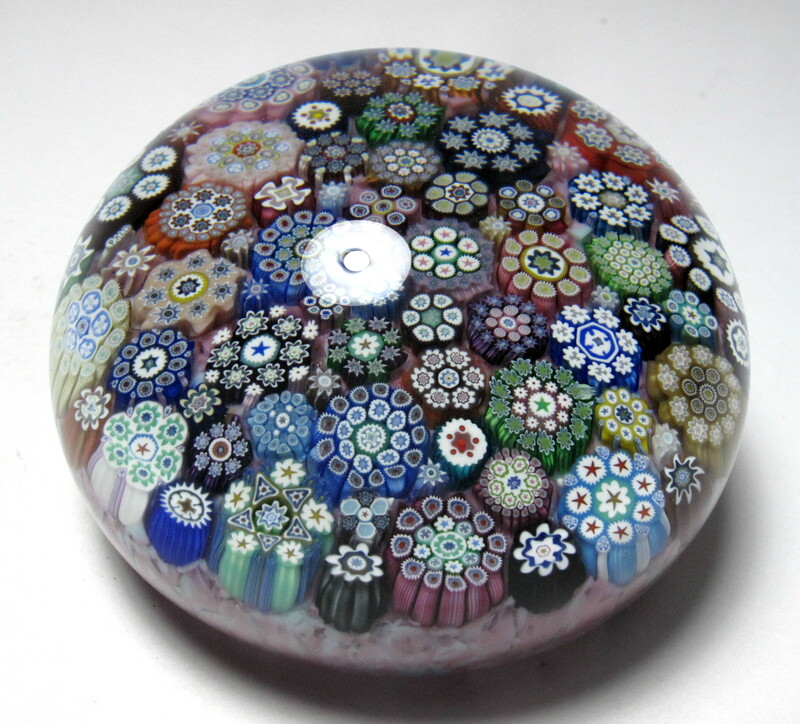 This paperweight consists a closepacked arrangement millefiori arranged in an almost concentric pattern. 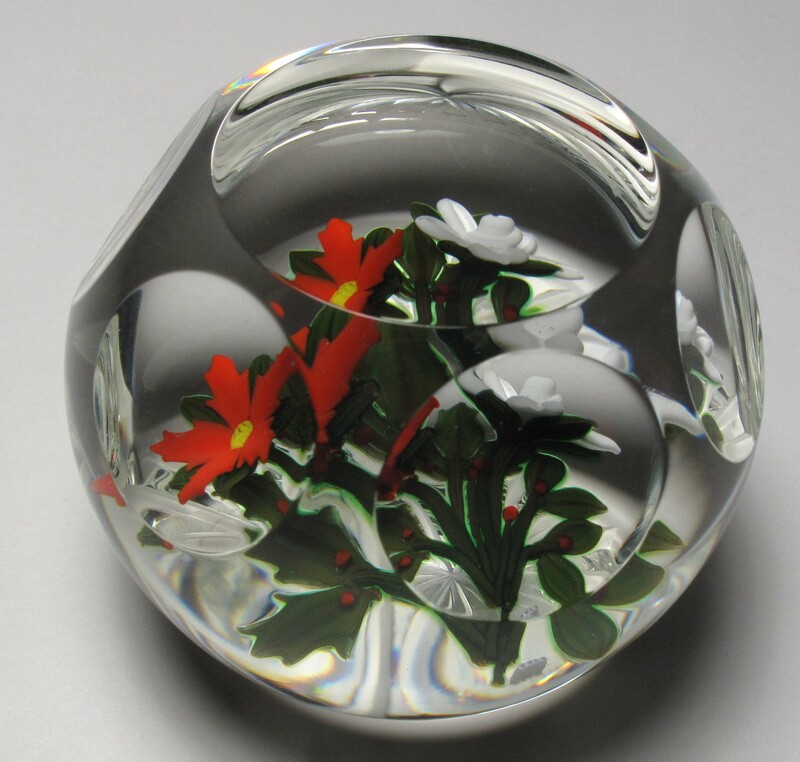 The paperweight has a daisy shape. The ground is an opaque black. It is signed in the design with a complex cane made from four separate letter canes forming the signature PMcD (as shown in the close-up). Unfortunately the cane was placed upside down in this paperweight reversing the letters. 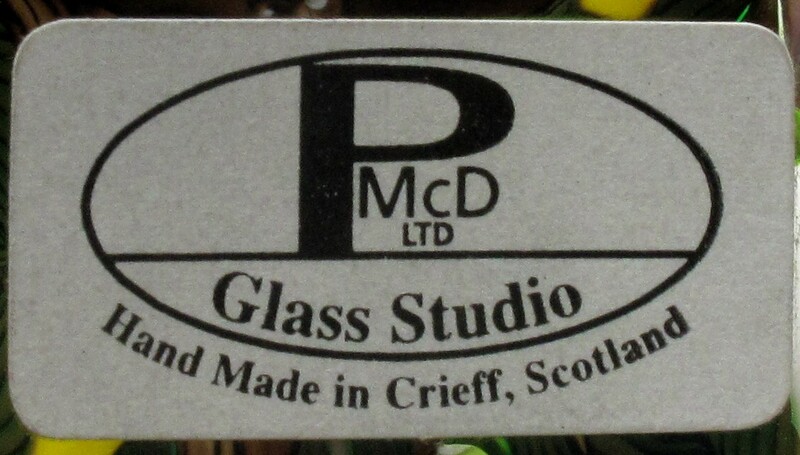 It also has a paper label "PMcD Glass Studio LTD, Hand Made in Crieff Scotland." This is called a pressed weight because a mold is used to form the shape. The top is flattened. 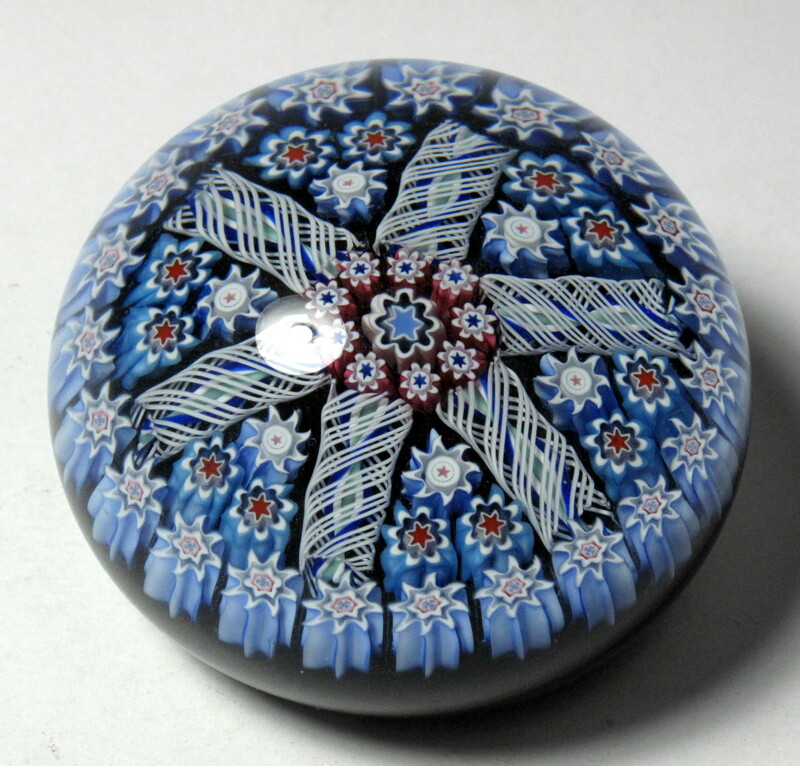 Small Size: 2 1/8" diameter by 1 1/4" high. Signature: Signed with a complex cane in the design and it also has a paper label "PMcD Glass Studio LTD, Hand Made in Crieff Scotland." 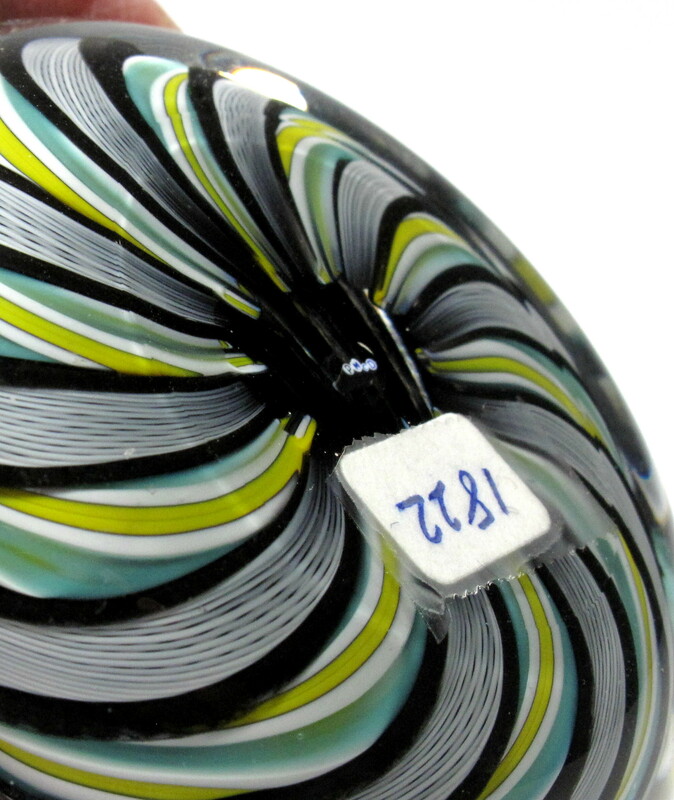 The signature cane was placed upside down in this paperweight reversing the letters. 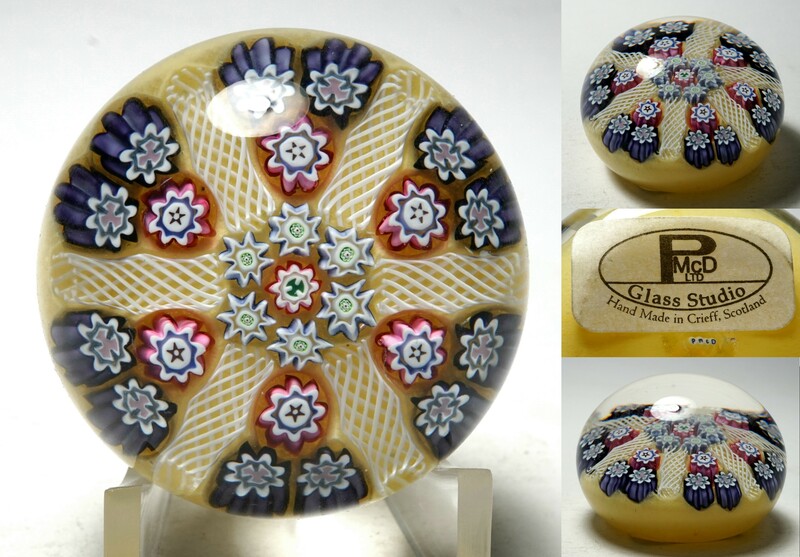 3122 Large Peter McDougall Millefiori Paperweight Pin or Candy Dish With Gold Cross and Garland. 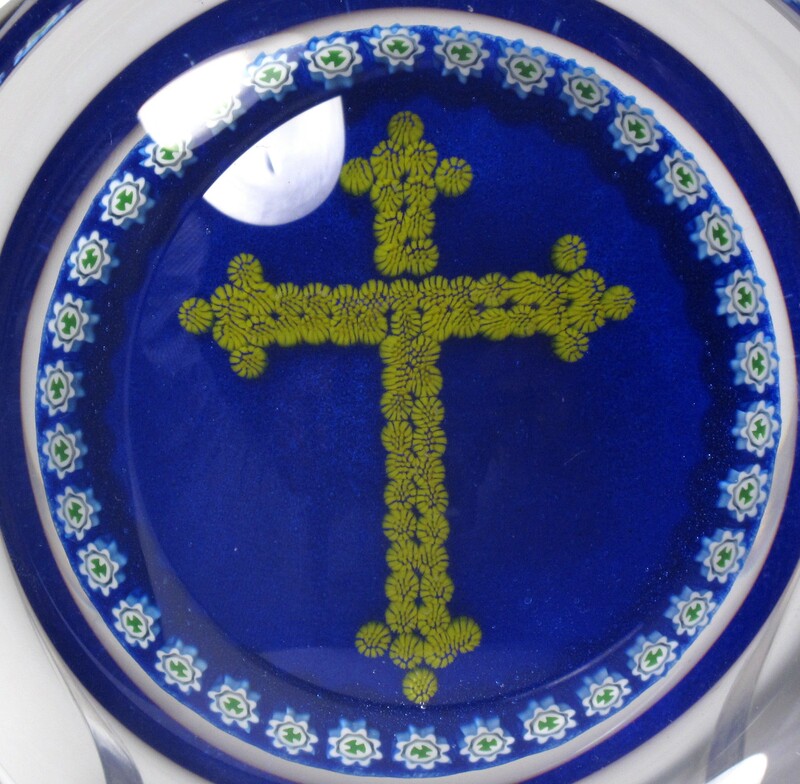 Colorful pin dish or candy dish with a cross of gold complex stardust millefiori canes and an outer garland of simple blue and white canes. 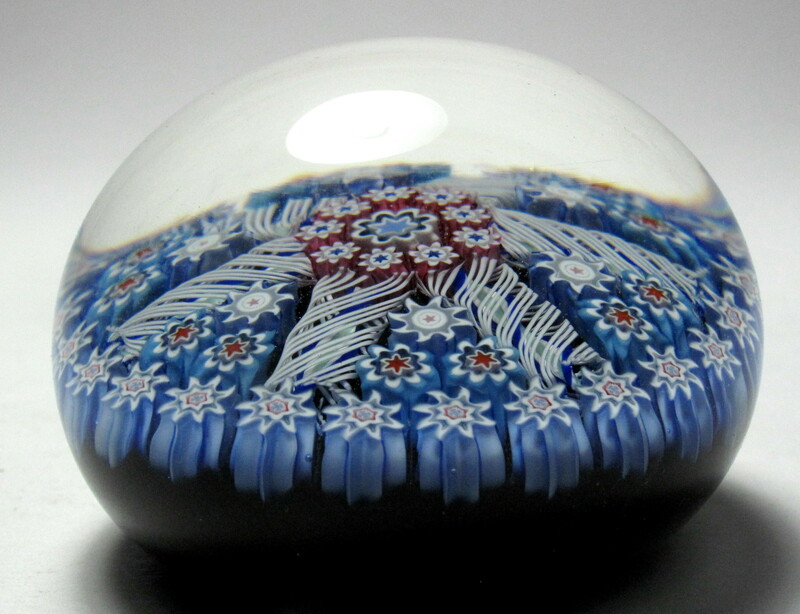 The design is set on a translucent cobalt blue ground. 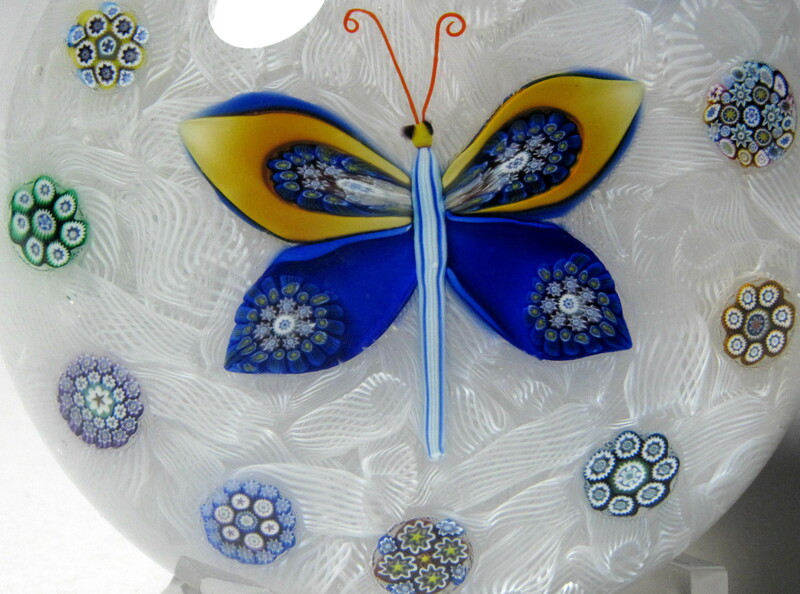 It is signed with a paper label "PMcD Glass Studio LTD, Hand Made in Crieff Scotland." 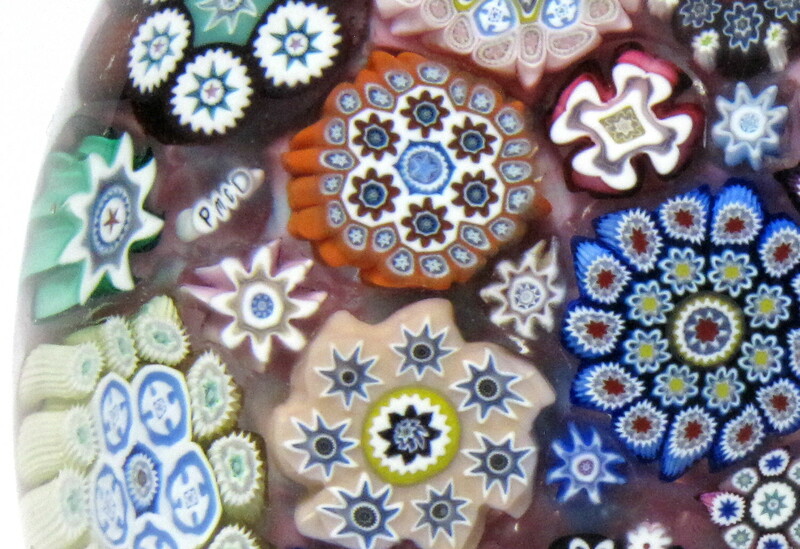 Scottish makers have a history of making candy dishes and other shapes out of paperweights when they realize that the product is flawed in some way. I suspect that they also make these dishes to order. In this case, I can see no flaws. 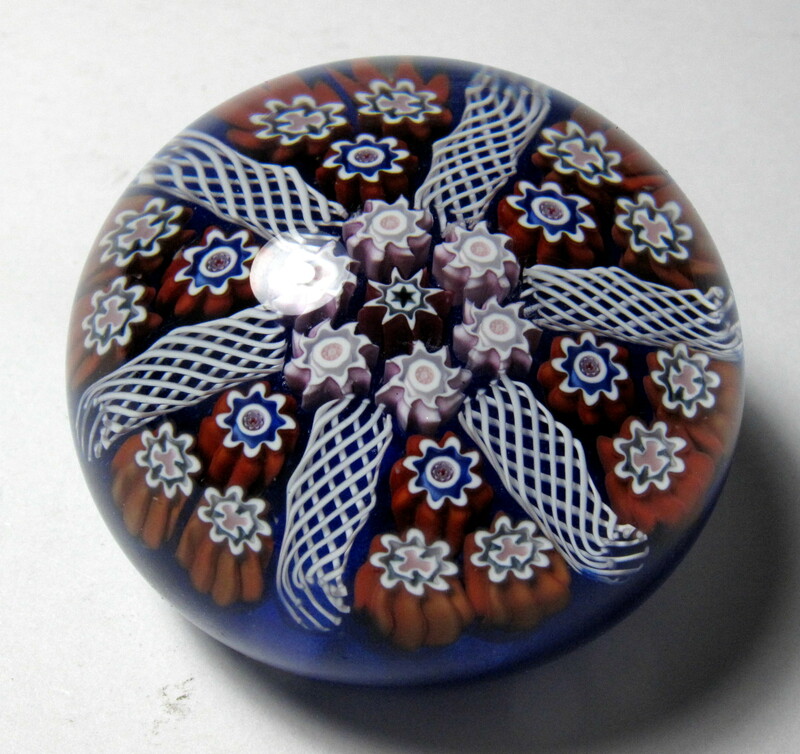 A paperweight of this design was originally made by Perthshire exclusively for L.H. Selman, Ltd., so it is possible Peter continued to make the design for Selman after Perthshire closed. Large Size: 3 3/4" diameter by 1 1/2" high. The base is ground concave. 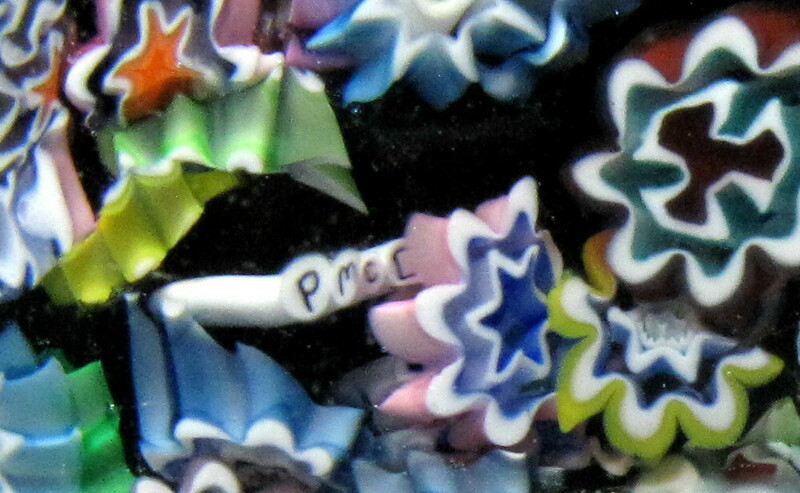 Signature: Signed with a paper label "PMcD Glass Studio LTD, Hand Made in Crieff Scotland." 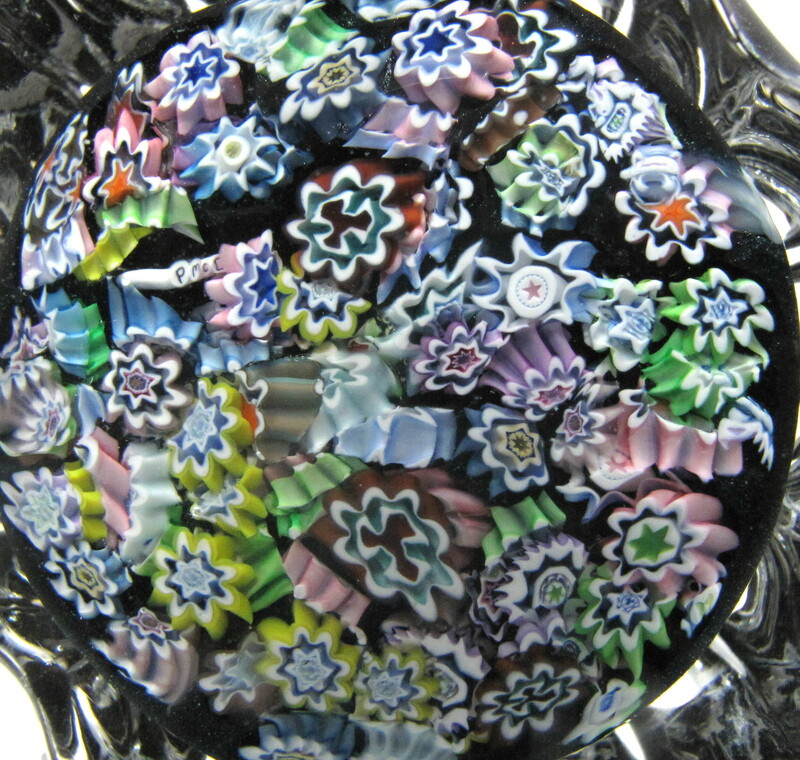 1669 Peter McDougall Medium Crown Paperweight with Multicolored Twists. 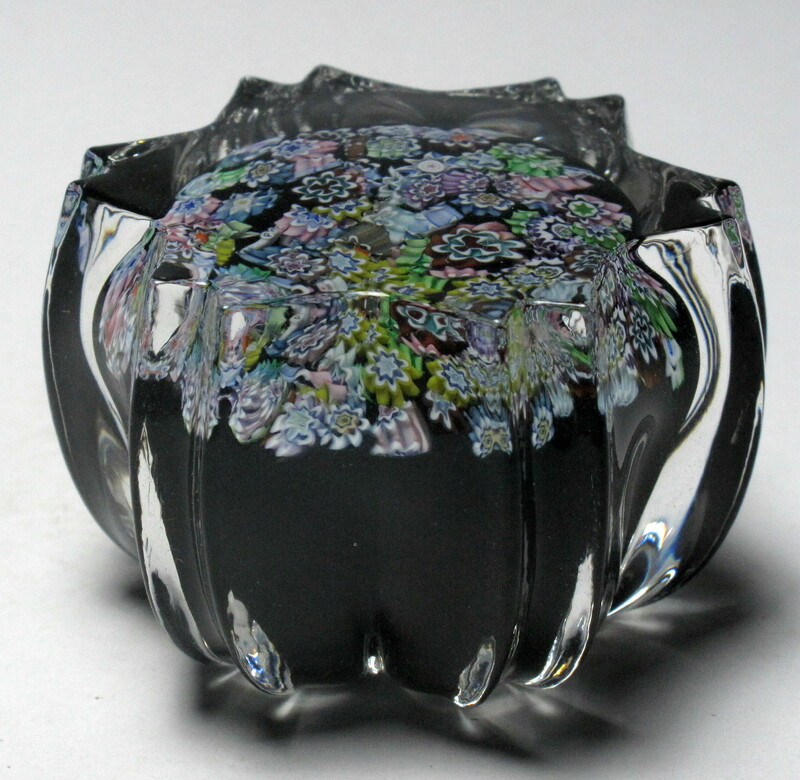 Attractive crown paperweight with a wonderful complex cane on top. The crown is formed from 20 twist canes with alternating colors, 10 white twist canes and 10 multi-colored twists made from yellow, white and green stringers. 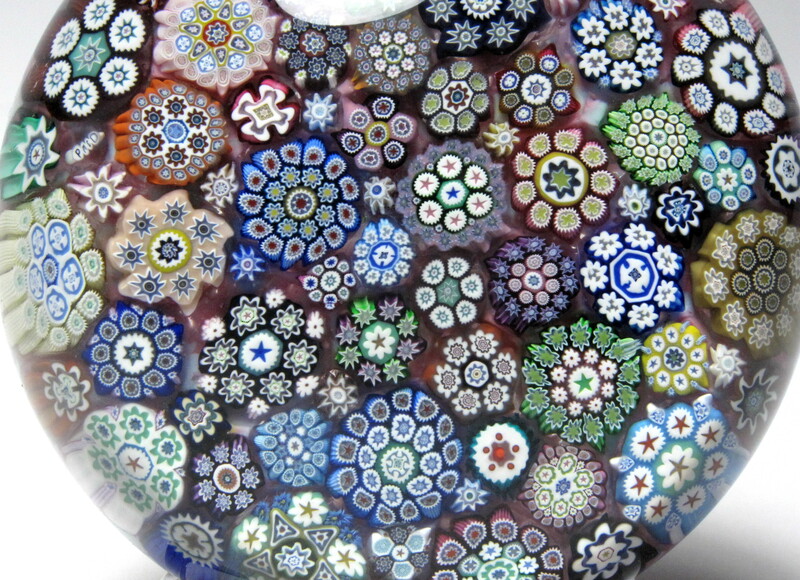 There is a dark ground in the center of this paperweight. It is signed on the base with a complex cane made from four separate letter canes forming the signature PMcD in the center of a cogged cane. There is no paper label on this paperweight. 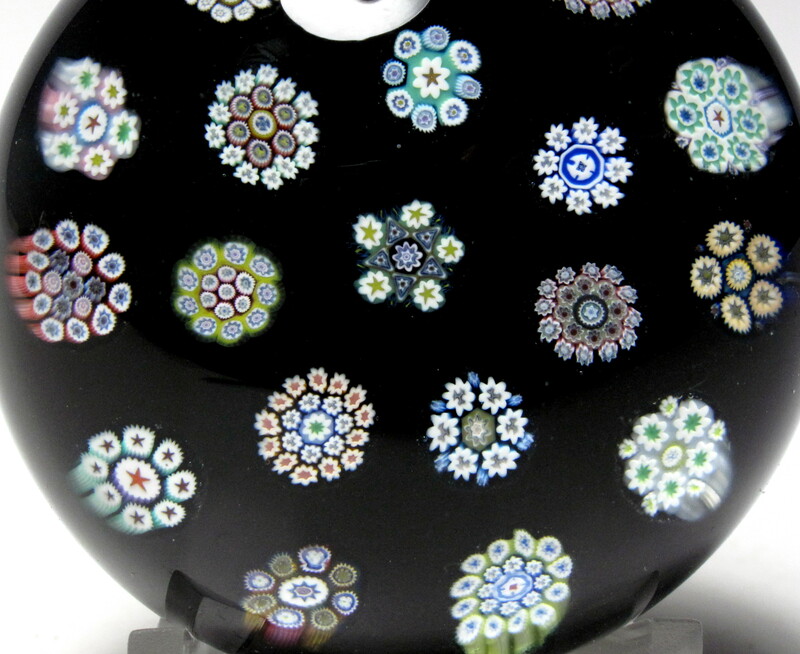 Crown weights are considered by some to be the most exciting of all millefiori designs. They are extremely difficult to make. Peter McDougall did not make many of these medium crowns. Medium Size: Just over 2 5/16" diameter by 2" high. The base is ground concave. Signature: Signed on the base with a complex cane made from four separate letter canes forming the signature PMcD in the center of a cogged cane. There is no paper label on this paperweight. 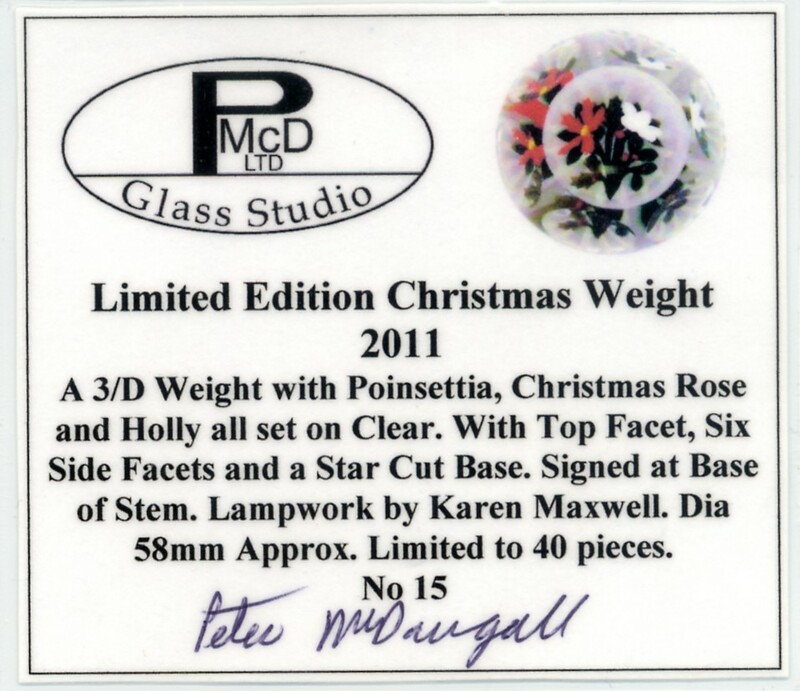 3176 Peter McDougall Karen Maxwell Limited Edition 2011 Christmas Paperweight. circa 2011. 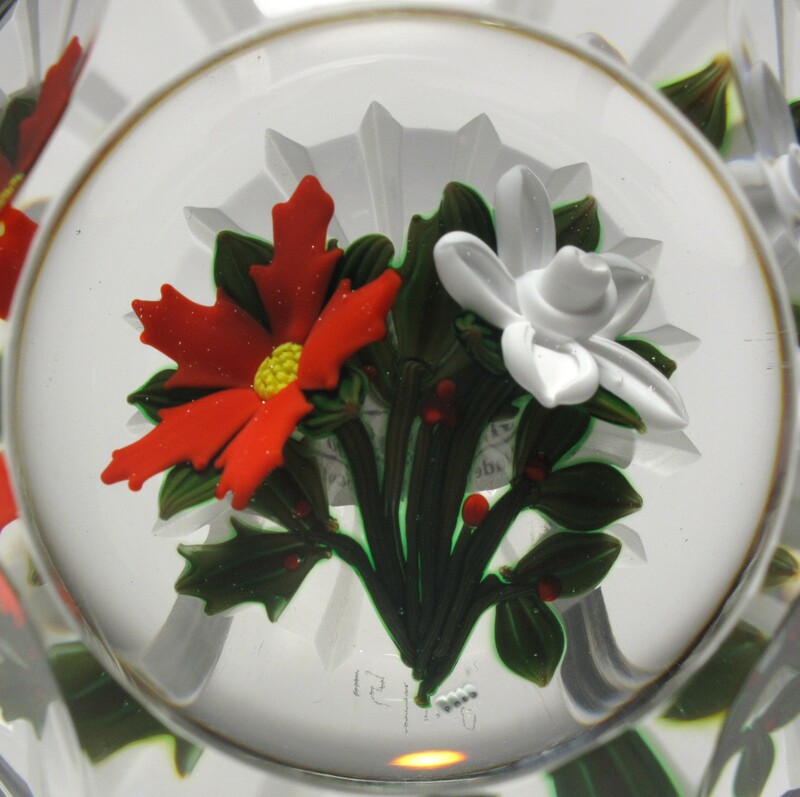 Attractive limited edition Christmas paperweight featuring a three dimensional bouquet of a Poinsettia, Christmas Rose, and Holly with stems, berries, and leaves. 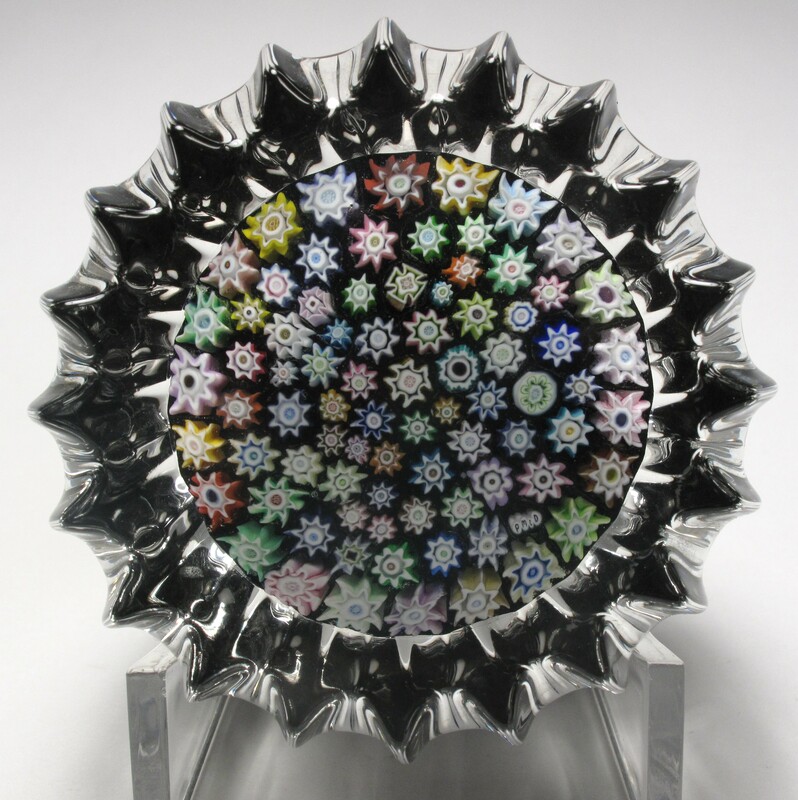 The bouquet was made by Karen Maxwell and is set on a clear ground with a dramatic star cut base. 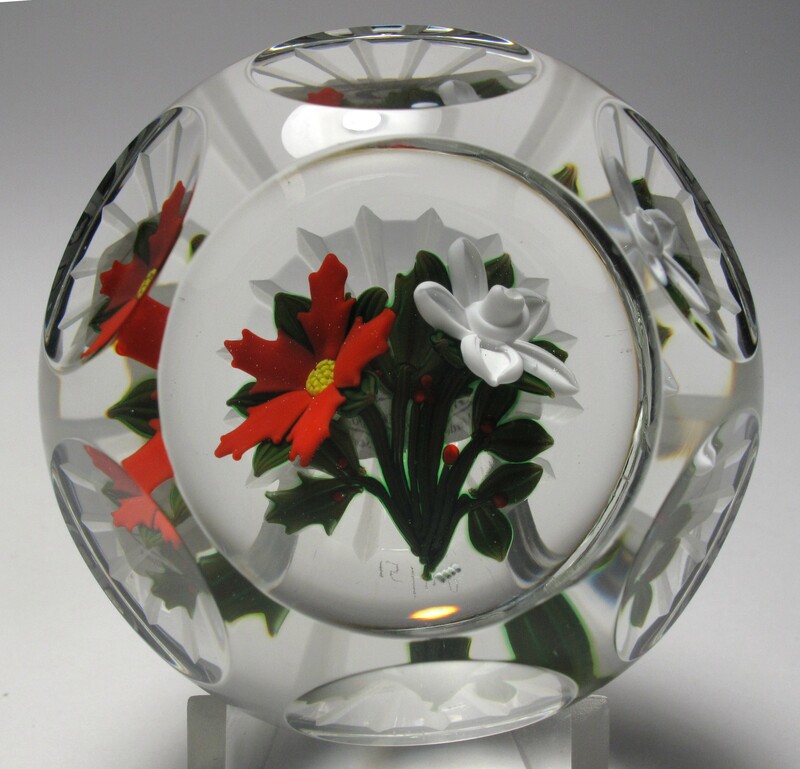 The paperweight is faceted with a top facet and six side facets. It is signed at the base of the bouquet with a complex cane made from four separate letter canes forming the signature PMcD. 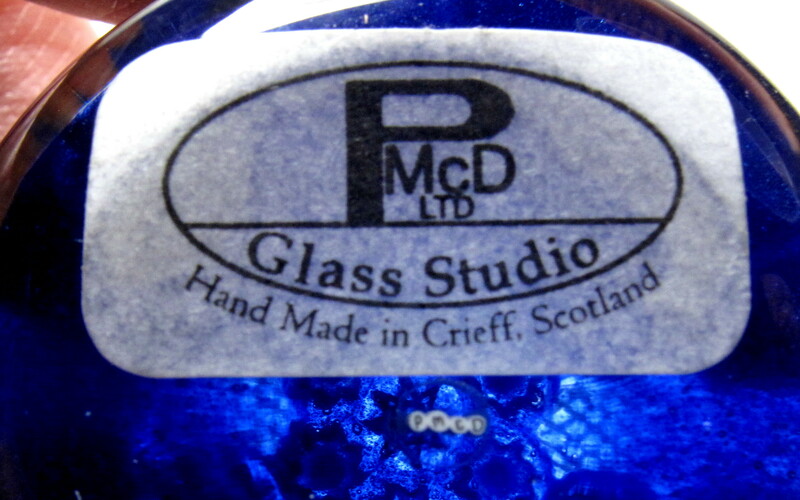 It also has a paper label "PMcD Glass Studio LTD, Hand Made in Crieff Scotland." 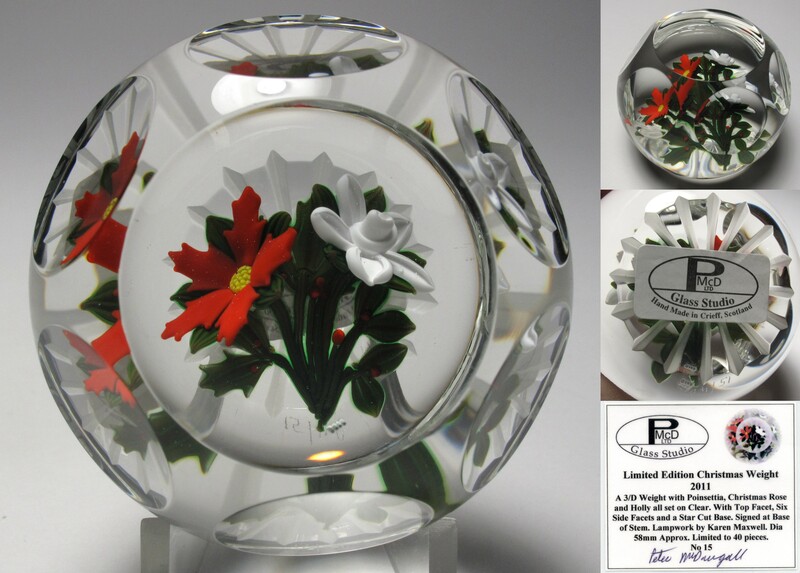 It also comes with its original laminated certificate stating that it is Number 15 out of a limited edition of 40 paperweights. 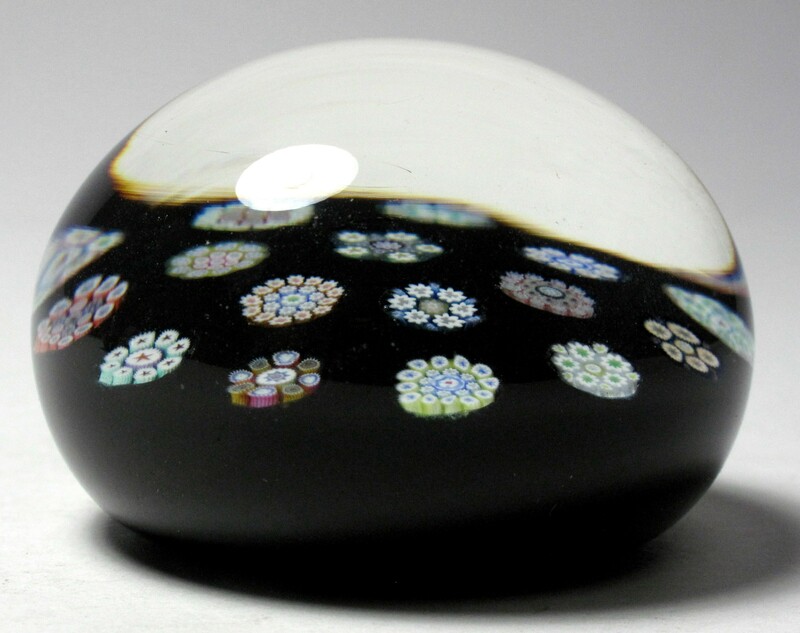 The paperweight is also marked 15/40 on the side near base. 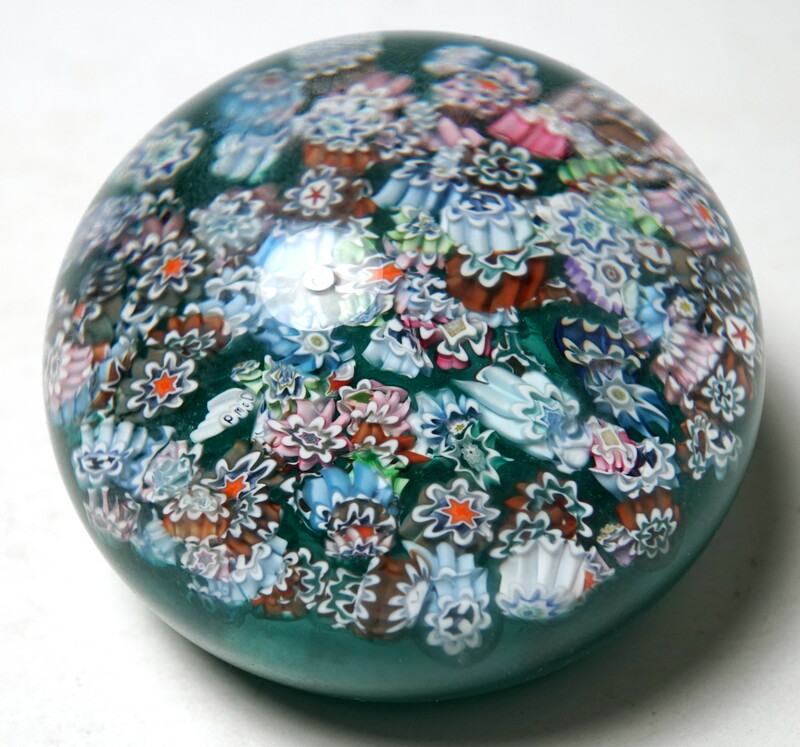 Peter McDougall issued a Christmas paperweight each year. I have most of these in stock. Please contact me if you are looking for a different year. Small Size: 2 1/4" diameter by just over 1 3/4" high. Signature: Signed with a complex "PMcD" cane on the base. 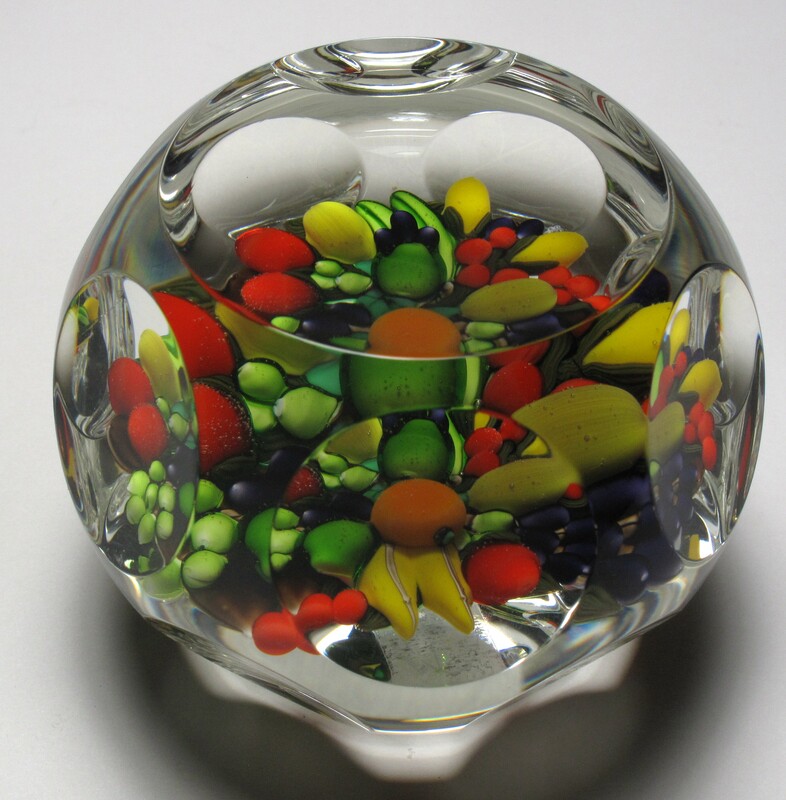 It also has a paper label "PMcD Glass Studio LTD, Hand Made in Crieff Scotland." $450 postage paid in the US. 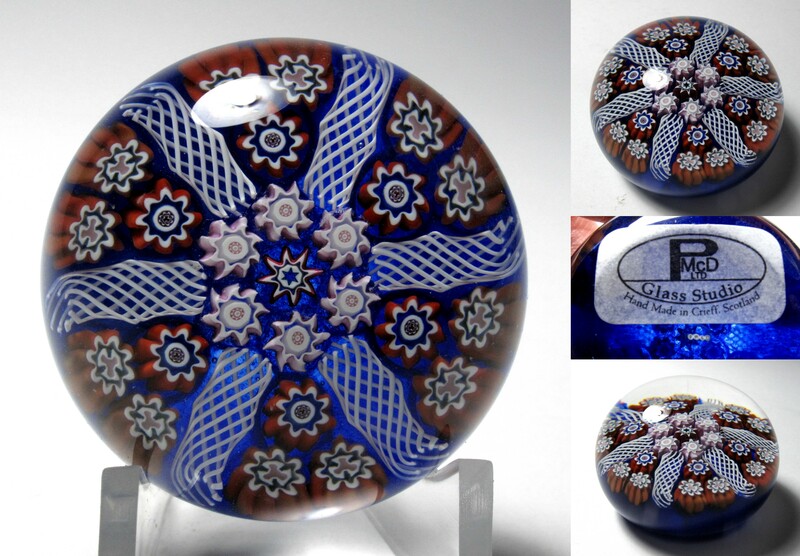 This one is SOLD, but I have another identical paperweight for sale. Please inquire if interested and I will post pictures. 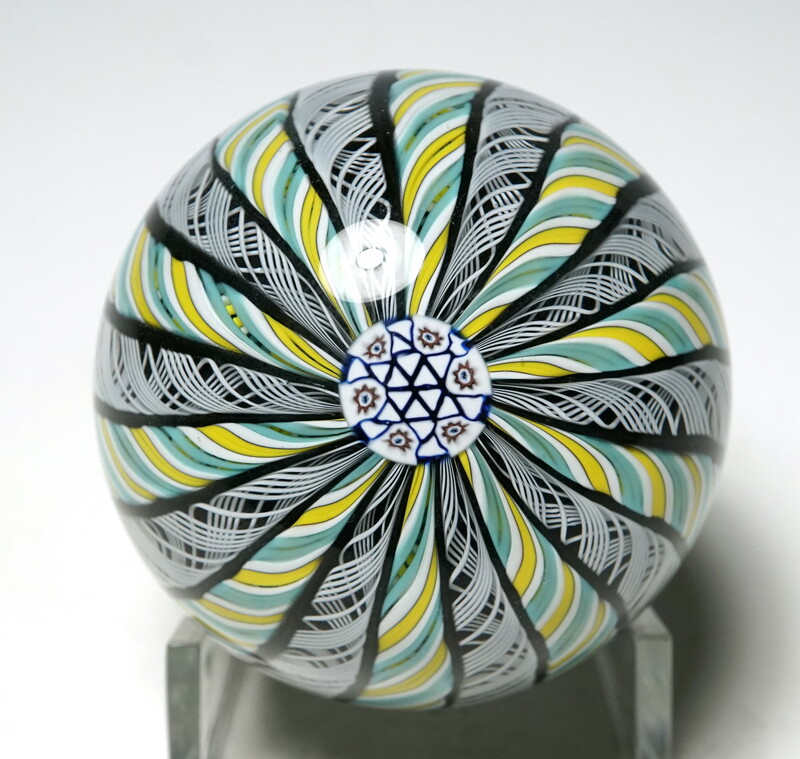 4910 Peter McDougall 2008 Special Edition Large Checker Board on Lace Ground Millefiori Paperweight. circa 2008. 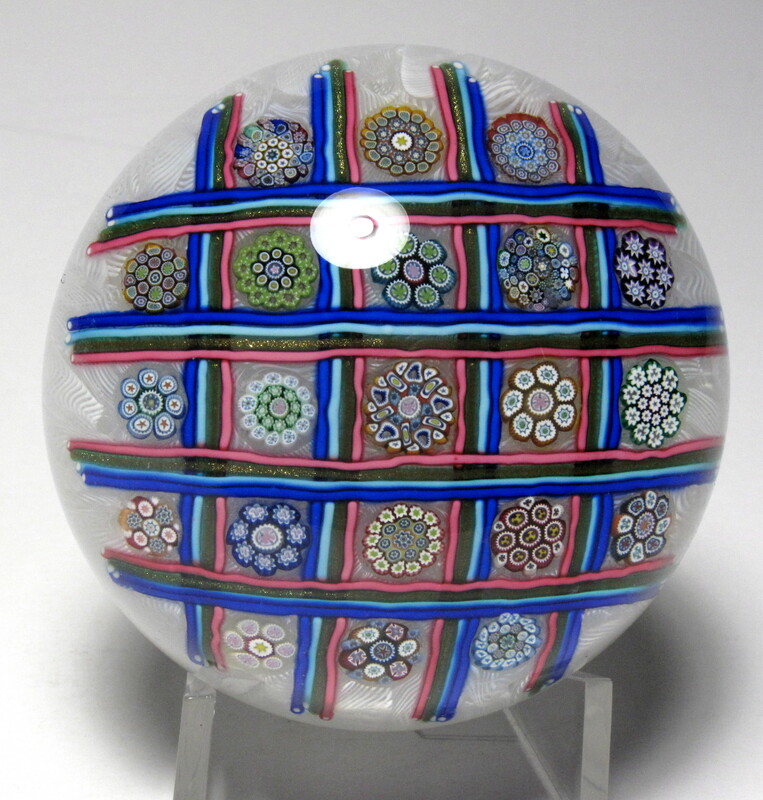 This large paperweight consists a checker board design with 21 different complex millefiori separated by multi-colored triple strand dividers. The design is placed over a lace ground. It is signed on the bottom with a complex cane made from four separate letter canes forming the signature PMcD. 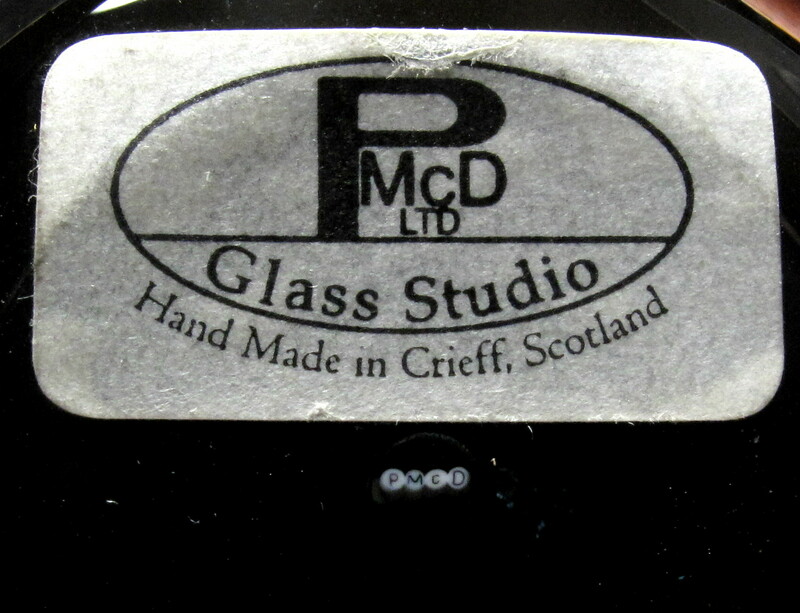 It also has a paper label "PMcD Glass Studio LTD, Handmade in Crieff Scotland." 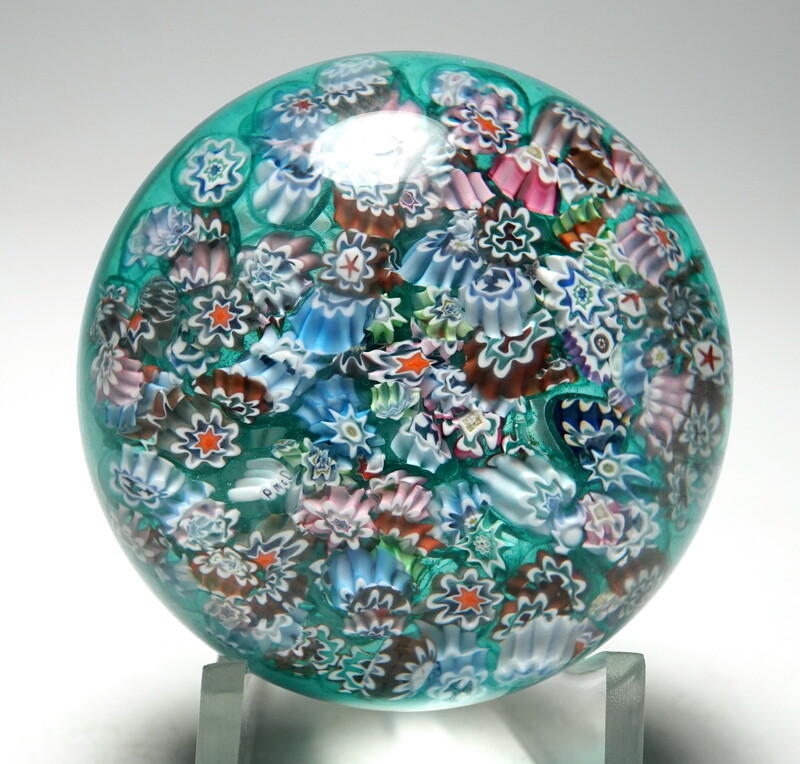 The paperweight was one of the special designs that Peter showed at Wheaton Village in 2008. It was designated #47 in this offering. A rare paperweight from this studio. 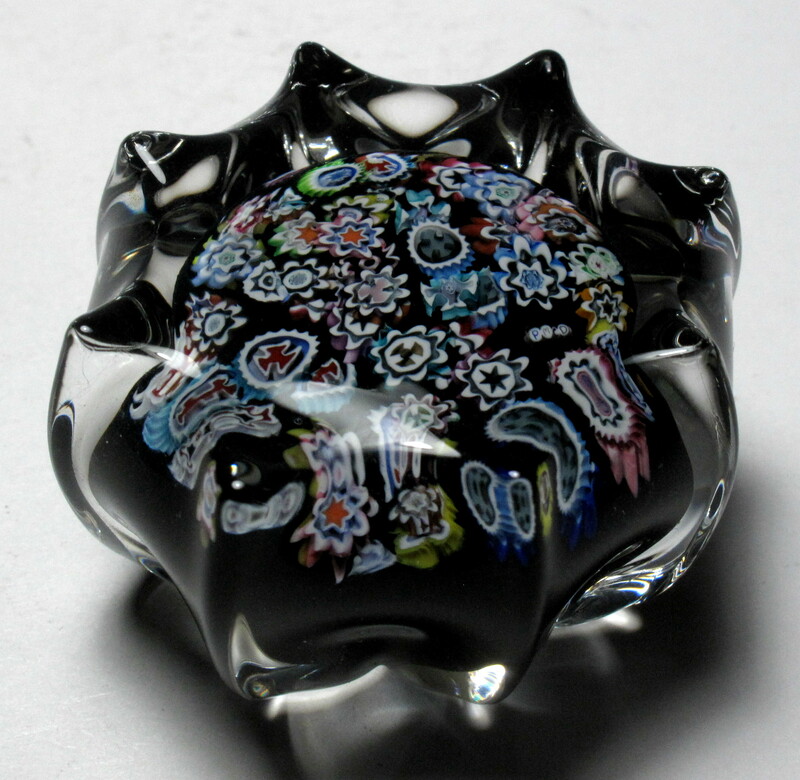 The picture does not do justice to this paperweight. Ignore the white areas, they are reflections and glare from the lights. Large Size: Just over 3" diameter by 2 3/16" high. The bottom is ground concave. Condition: Excellent condition with no scratches, chips or cracks. The paper label is worn. 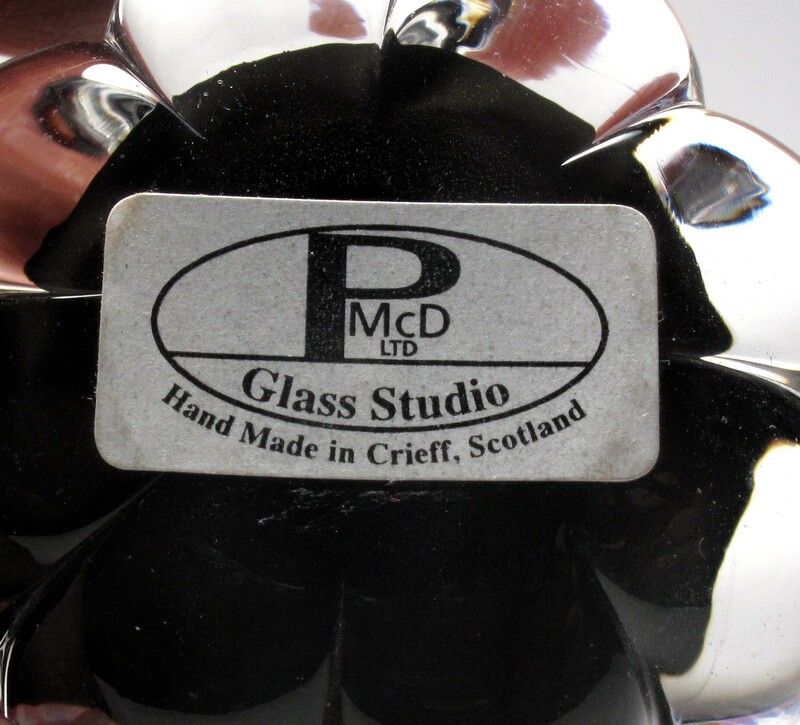 Signature: Signed with a complex cane in the design and it also has a paper label "PMcD Glass Studio LTD, Hand Made in Crieff Scotland." 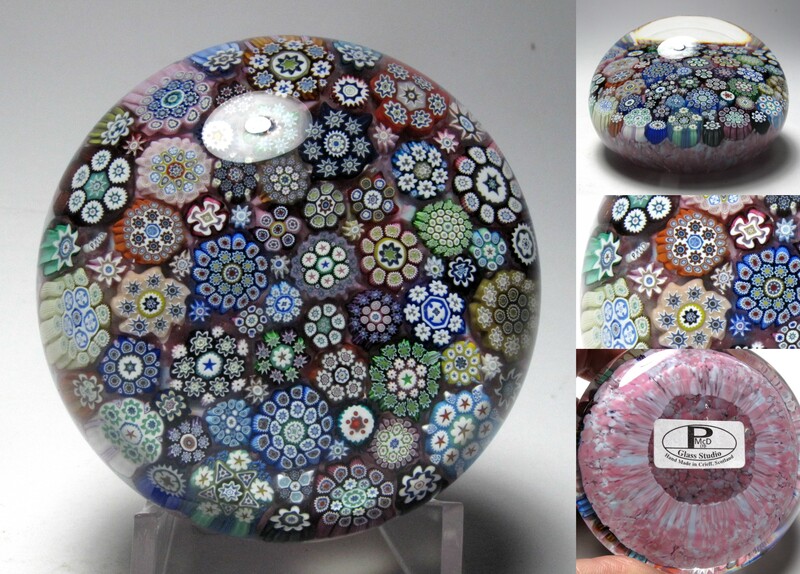 2511 Peter McDougall (PMcD) Medium Paneled Millefiori Paperweight. 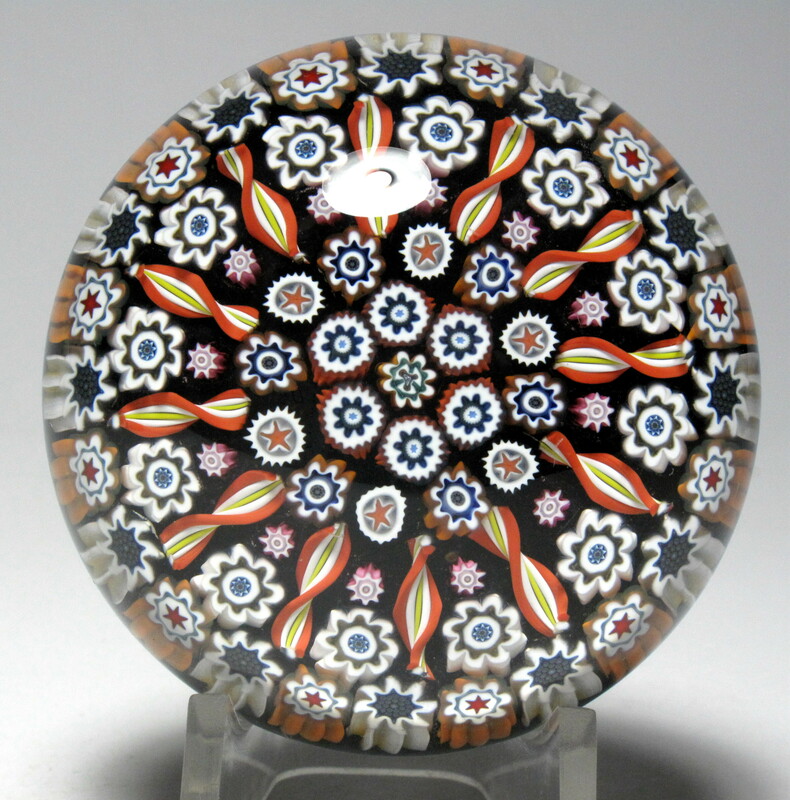 This paperweight consists of a paneled millefiori pattern of warm brown, orange, yellow and other colors on a black ground. There are twelve panels arranged around a central concentric pattern.of two rings of canes. The panel dividers are orange, white and yellow twists. This style has one small cane and one larger cane between each twist plus a ring of alternating canes on the outside. The two inner rings are an outer alternating ring and an inner ring of identical canes. It is signed on the bottom with a complex cane made from four separate letter canes forming the signature "PMcD". 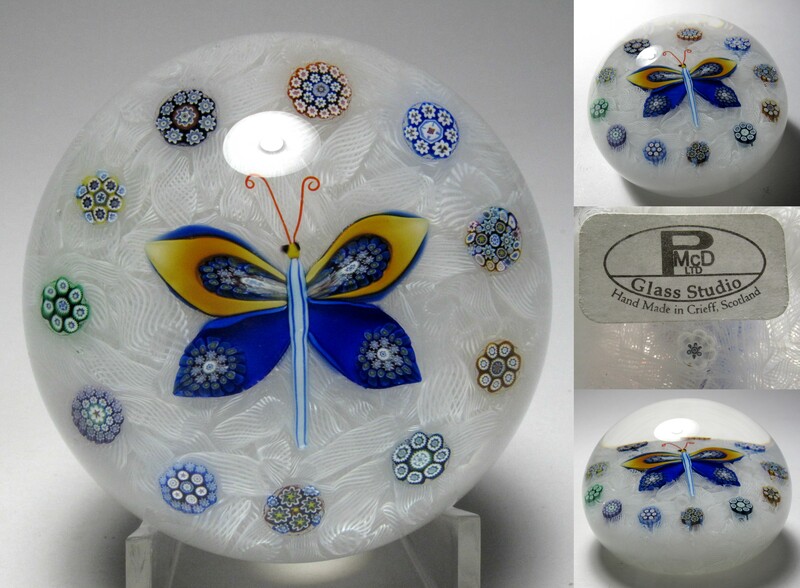 It also has a paper label "PMcD Glass Studio LTD, Hand Made in Crieff Scotland" on the base. 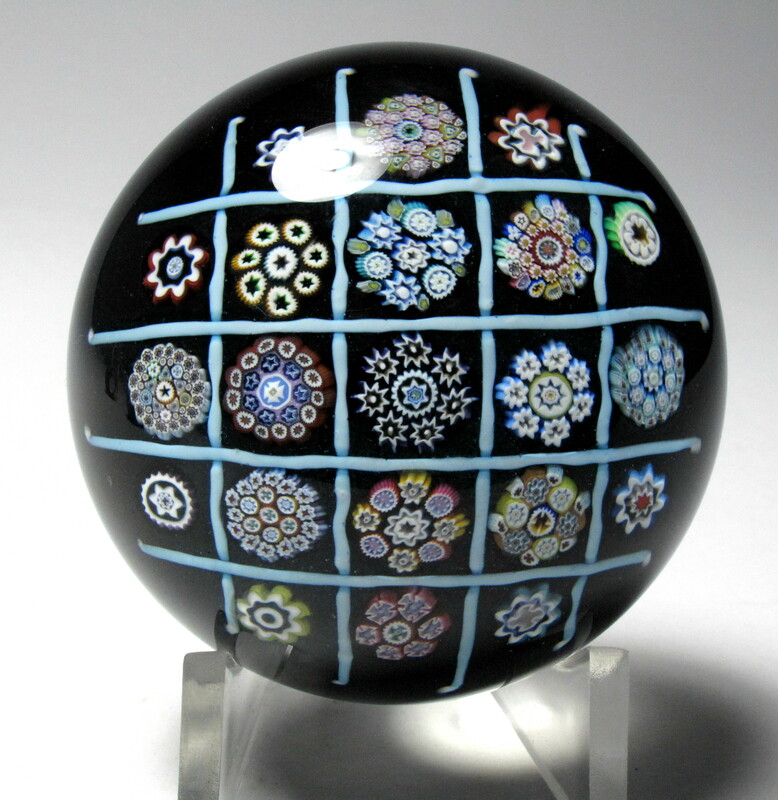 A great paperweight with a complex pattern. Medium Size: 2 1/2" diameter by just under 1 3/4" high. The base is ground concave. 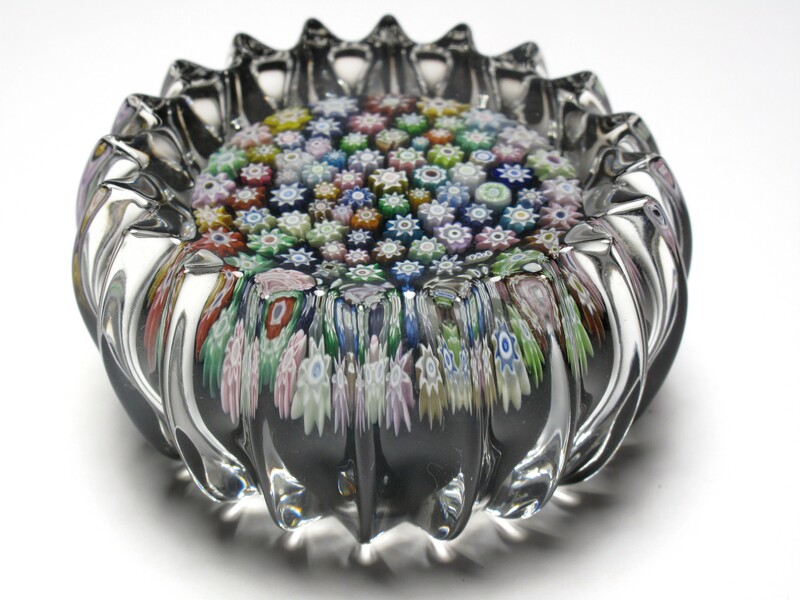 Signature: This paperweight is signed on the base with McDougall's "PMcD" complex signature cane made from four separate letter canes. The signature cane is small and some people may have difficulty reading the signature on these weights. 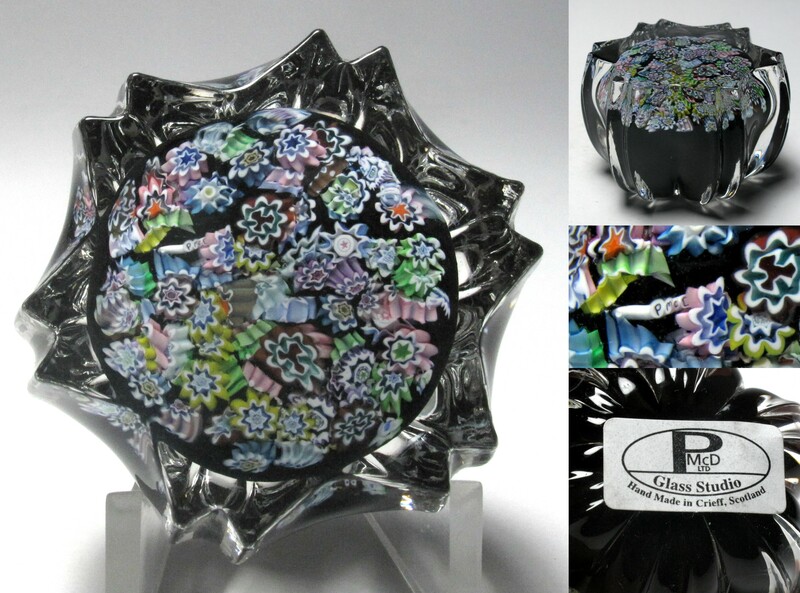 It also has a paper label "PMcD Glass Studio LTD, Hand Made in Crieff Scotland" on the base. 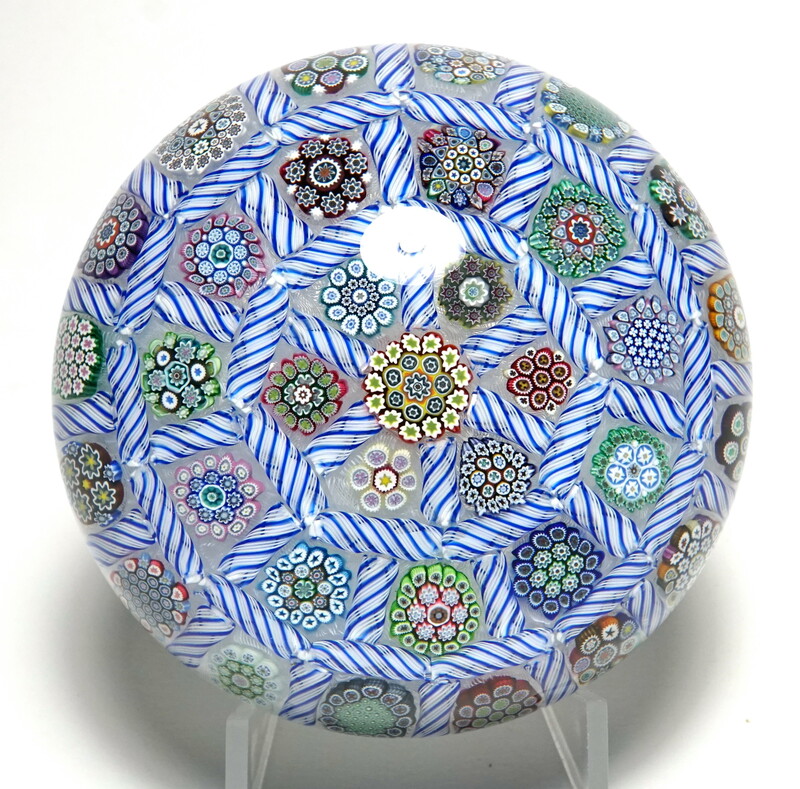 3331 Peter McDougall (PMcD) Small Paneled Millefiori Paperweight. 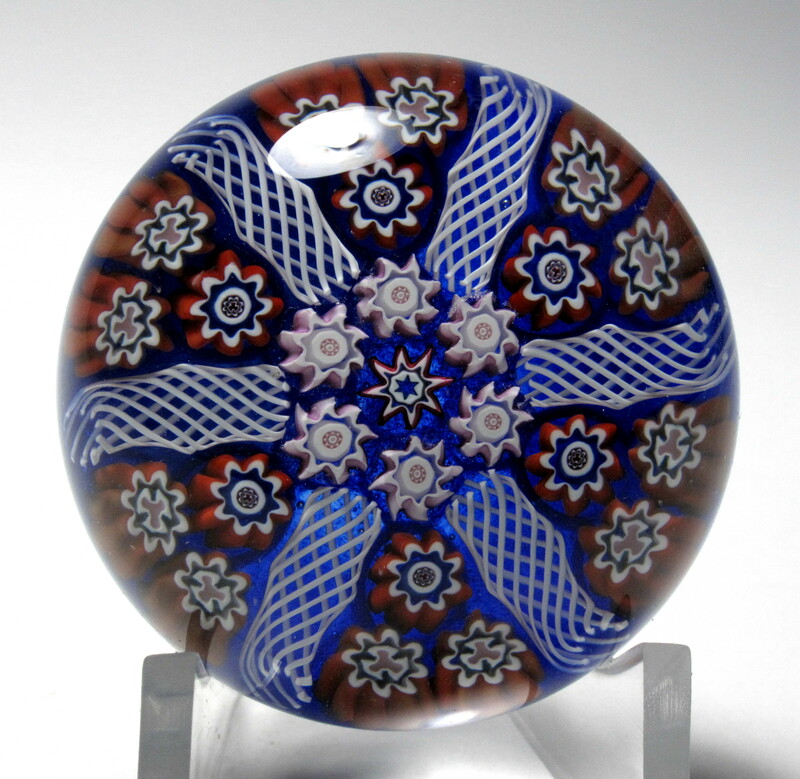 This paperweight consists of a paneled millefiori pattern of blue, red, and white colors on an opaque black ground. 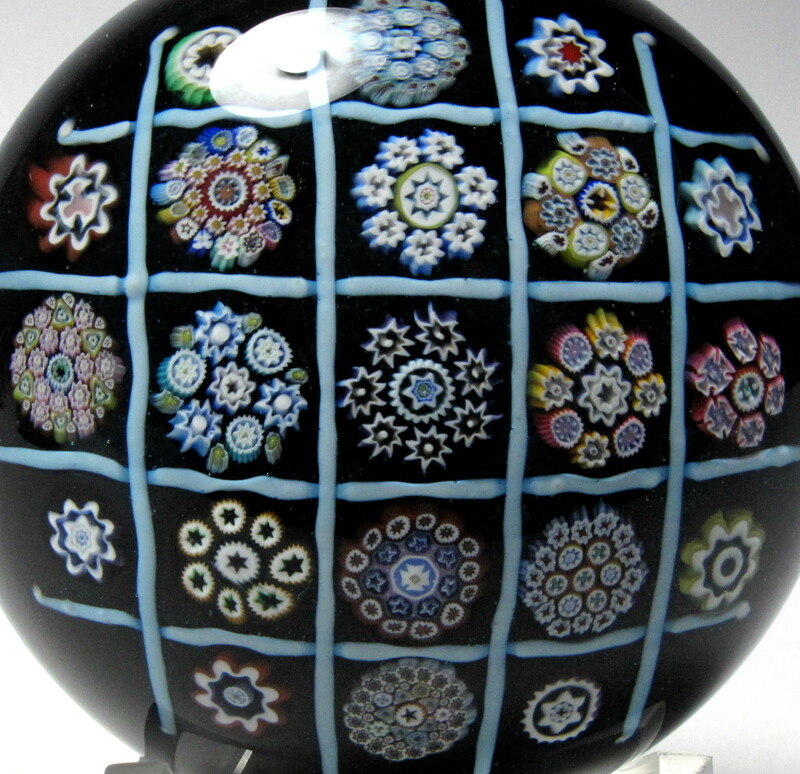 There are six panels arranged around a central complex millefiori cane. 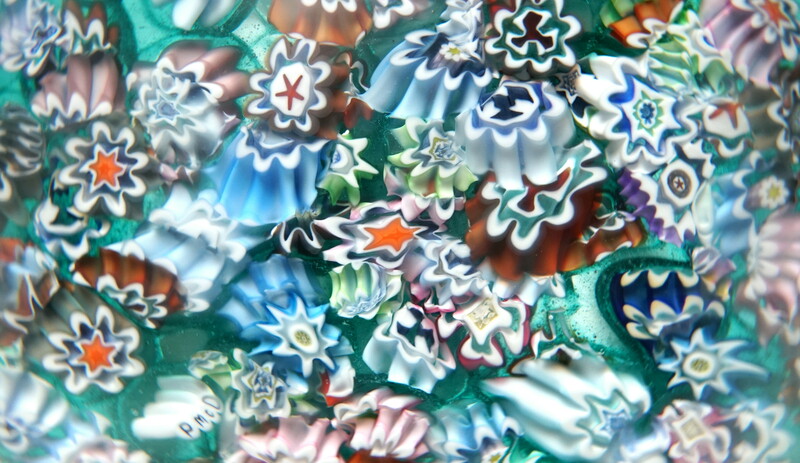 The panel dividers are white complex latticinio twists with a blue, green, and white twist in the center. This style has a 1 + 2 pattern of canes plus a ring of canes on the outside. It is signed on the bottom with a complex cane made from four separate letter canes forming the signature "PMcD". 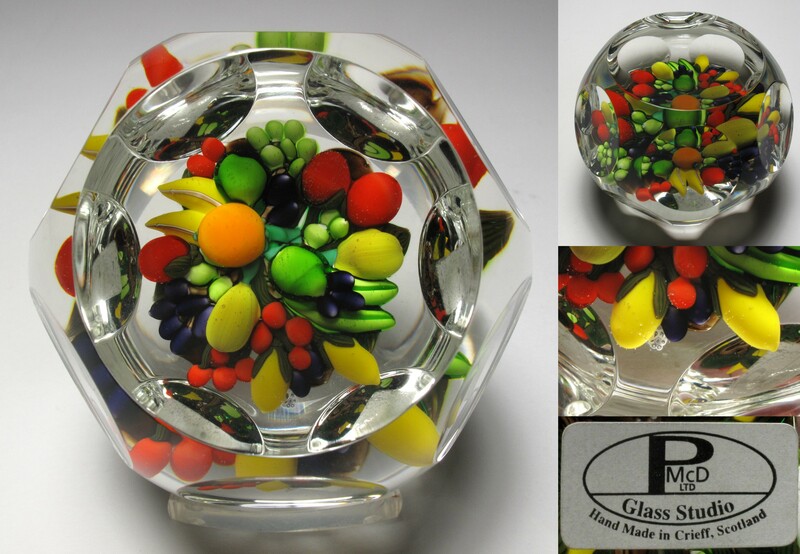 It also has a paper label "PMcD Glass Studio LTD, Hand Made in Crieff Scotland." Great color. Small Size: 2 1/4" diameter by just over 1 9/16" high. The base is ground concave. Signature: It is signed on the bottom with a complex cane made from four separate letter canes forming the signature "PMcD". 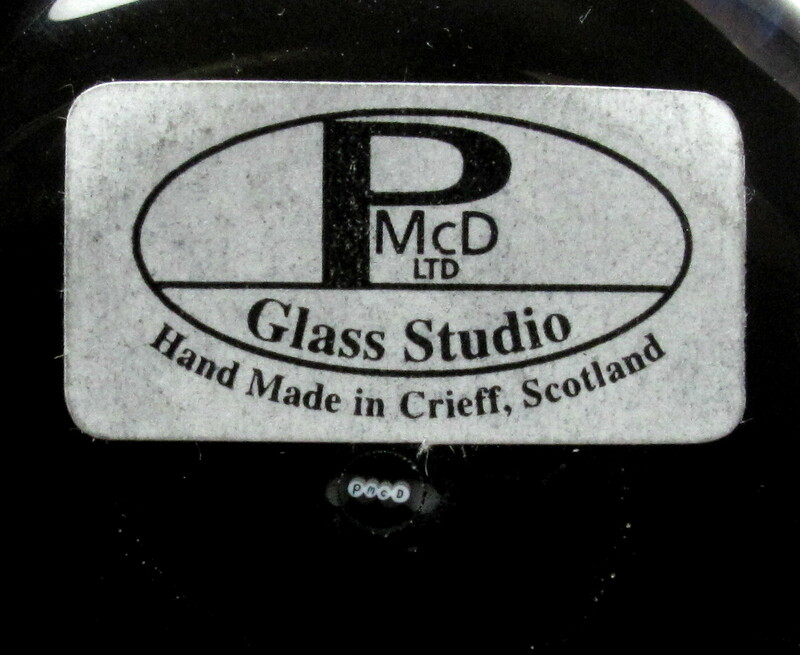 It also has a paper label "PMcD Glass Studio LTD, Hand Made in Crieff Scotland." 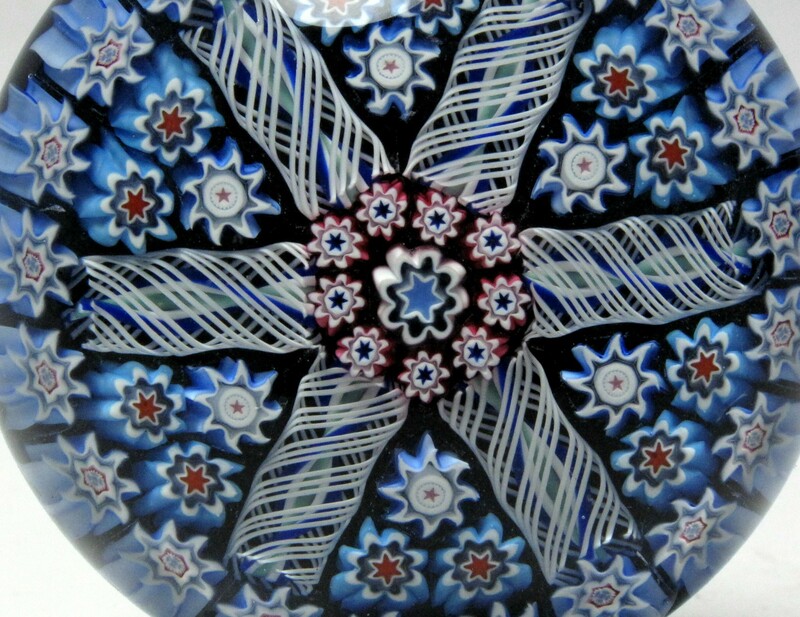 3209 Peter McDougall (PMcD) Miniature Six Pointed Star Scramble Millefiori Paperweight. 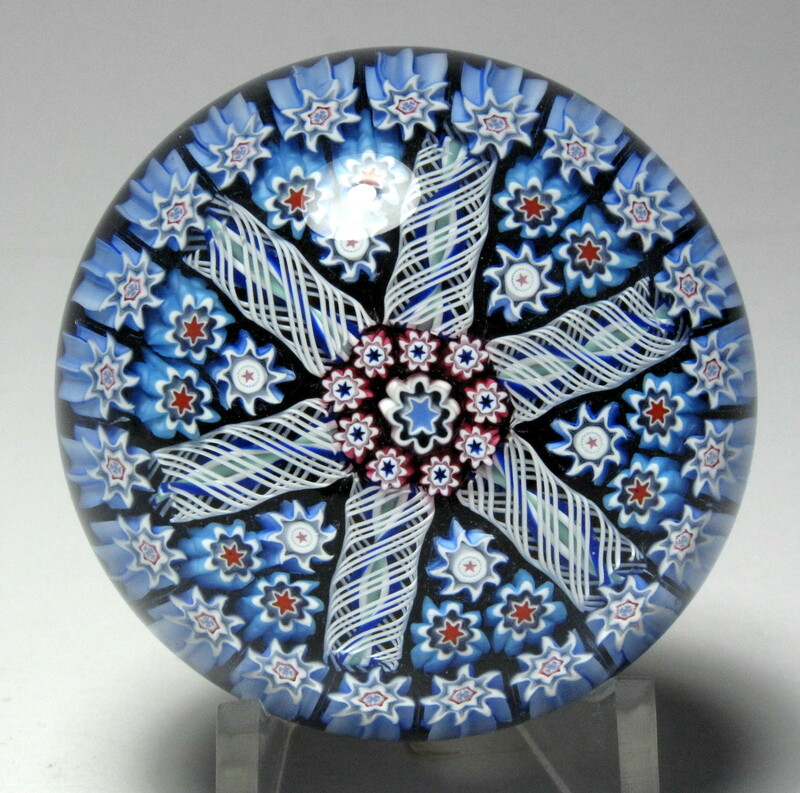 This miniature paperweight features a scramble or end of the day design and is finished as a six pointed star. Each point of the star is a double point. The ground is black. 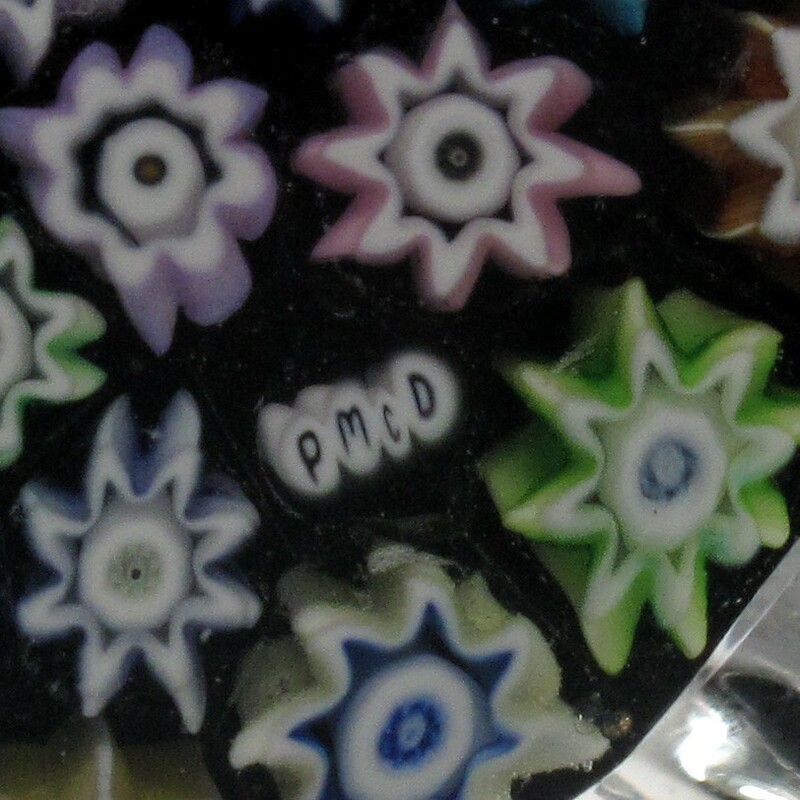 It is signed in the design with a complex cane made from four separate letter canes forming the signature PMcD (as shown in the close-up). 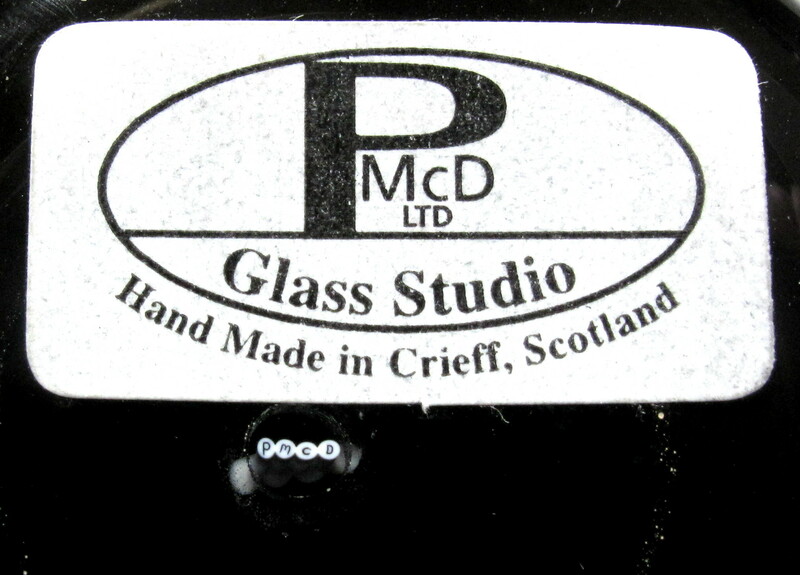 It also has a paper label "PMcD Glass Studio LTD, Hand Made in Crieff Scotland." 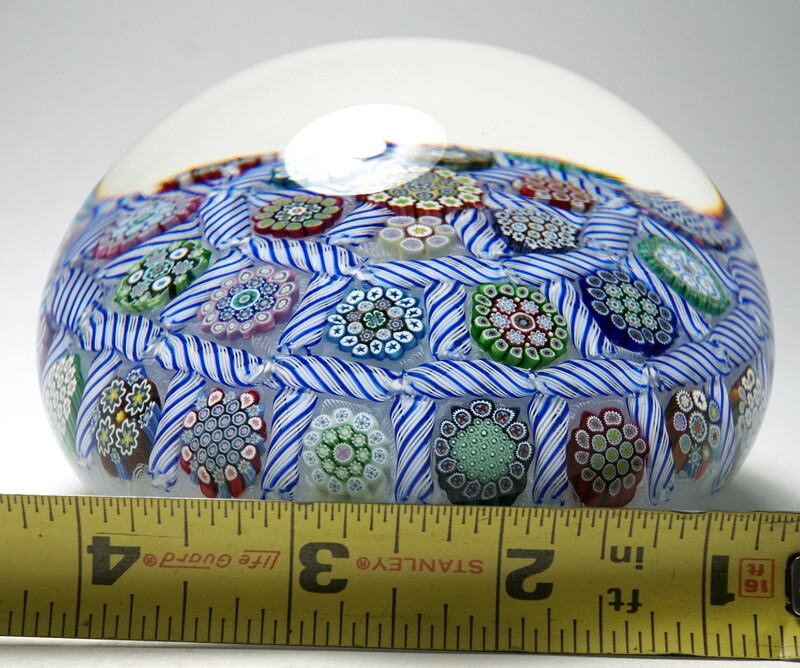 Miniature Size: 1 15/16" diameter by 1 1/4" high. 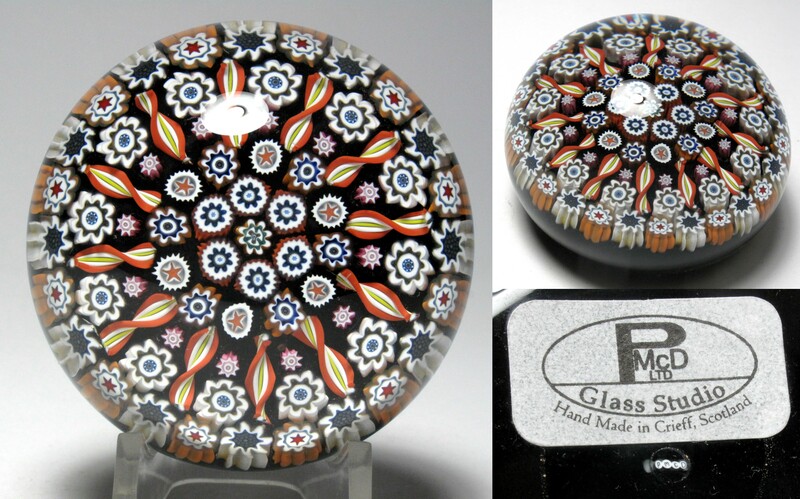 2518 Peter McDougall (PMcD) Miniature Paneled Millefiori Paperweight. 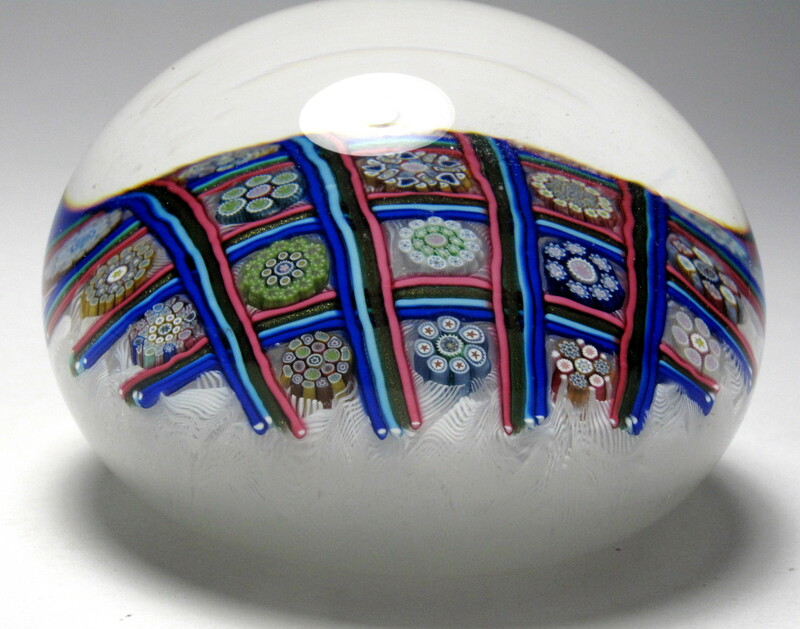 This miniature paperweight consists of a paneled millefiori pattern of amber, red, and pink colors on a translucent blue ground. 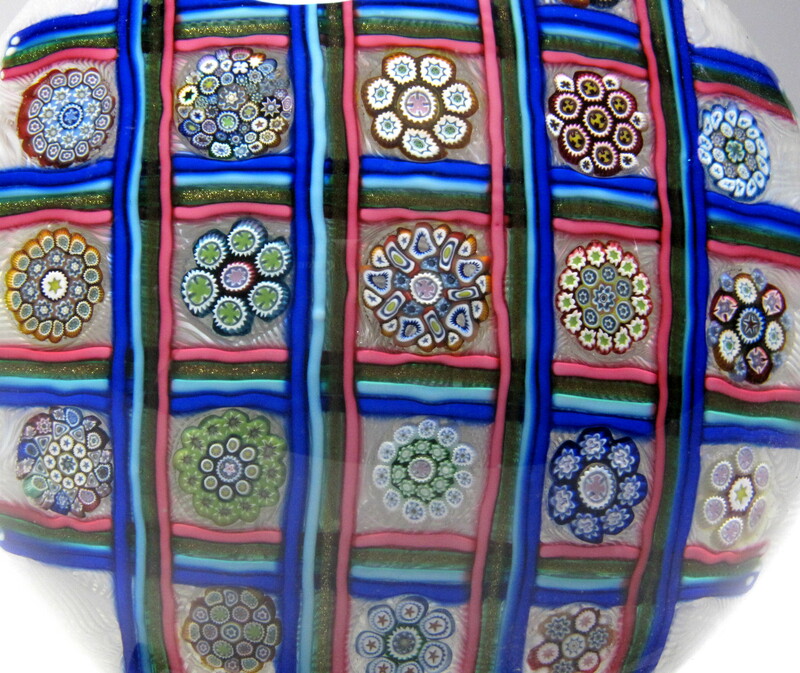 There are six panels arranged around a central millefiori cane. The panel dividers are white complex latticinio twists. This style has a 1 + 2 pattern of canes plus a ring of canes around the center cane. It is signed on the bottom with a complex cane made from four separate letter canes forming the signature "PMcD". 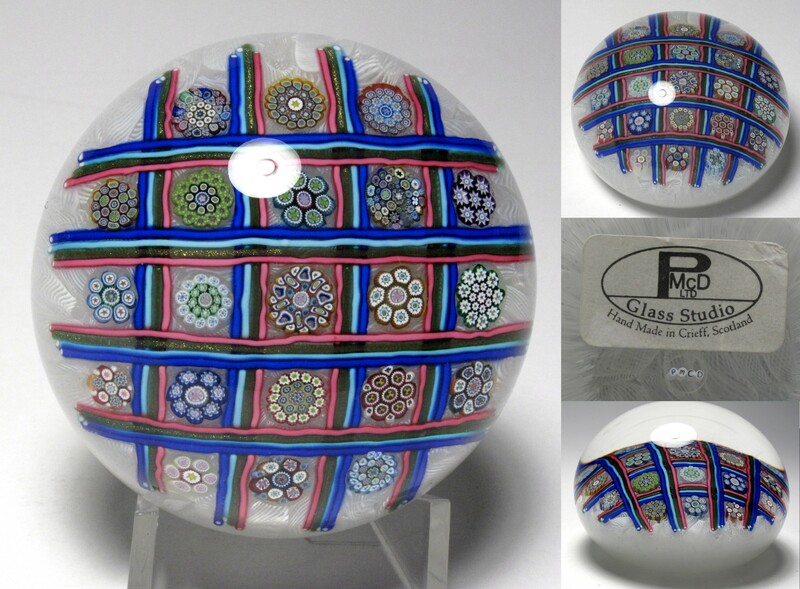 It also has a paper label "PMcD Glass Studio LTD, Hand Made in Crieff Scotland." Great color and precise execution. Miniature Size: Just under 1 13/16” diameter by 1 5/16” high. The base is ground concave. 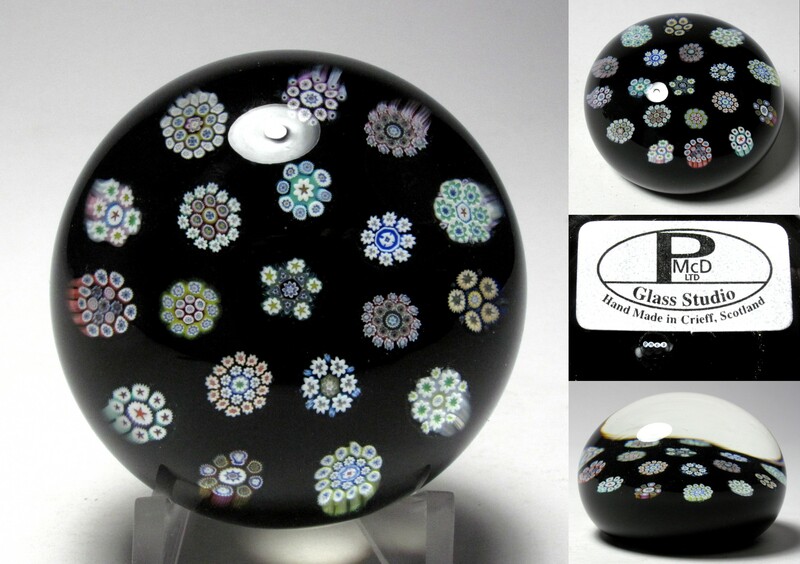 3198 Spectacular Peter McDougall (PMcD) Large Closepack Millefiori Paperweight. circa 2011. 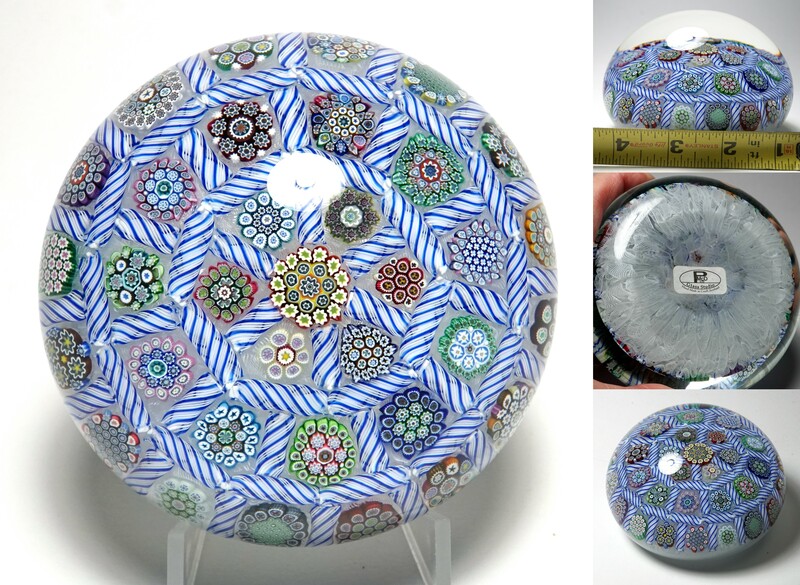 Wonderful large paperweight with a closepack design featuring many large complex millefiori canes over a pink and light blue frit ground. It is signed in the design with a complex cane made from four separate letter canes forming the signature PMcD. 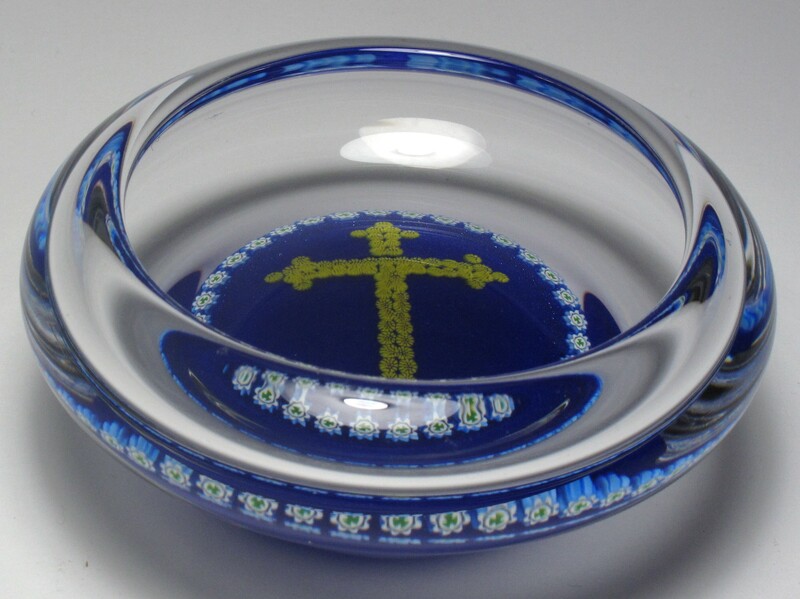 It also has a paper label "PMcD Glass Studio LTD, Hand Made in Crieff Scotland" on the base. 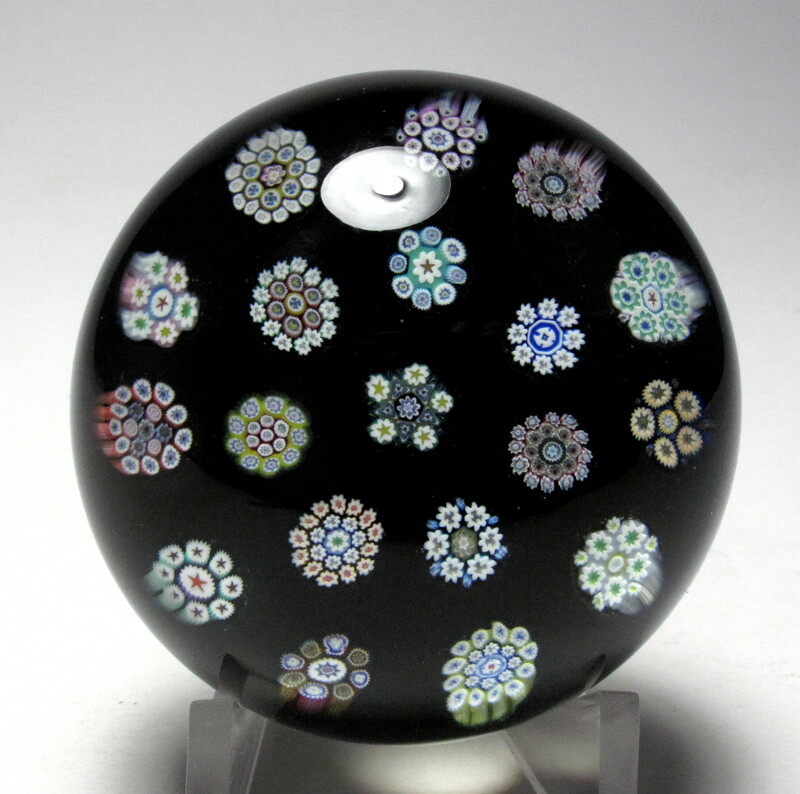 One of Peter McDougall's best millefiori designs. This style was also made in small and medium size weights. The picture does not do justice to this paperweight. Ignore the white areas, they are reflections and glare from the lights. Large Size: Just under 3" diameter by 1 15/16" high. The bottom is ground concave. Signature: Signed with a complex cane in the design and it also has a paper label "PMcD Glass Studio LTD, Hand Made in Crieff Scotland" on the base. 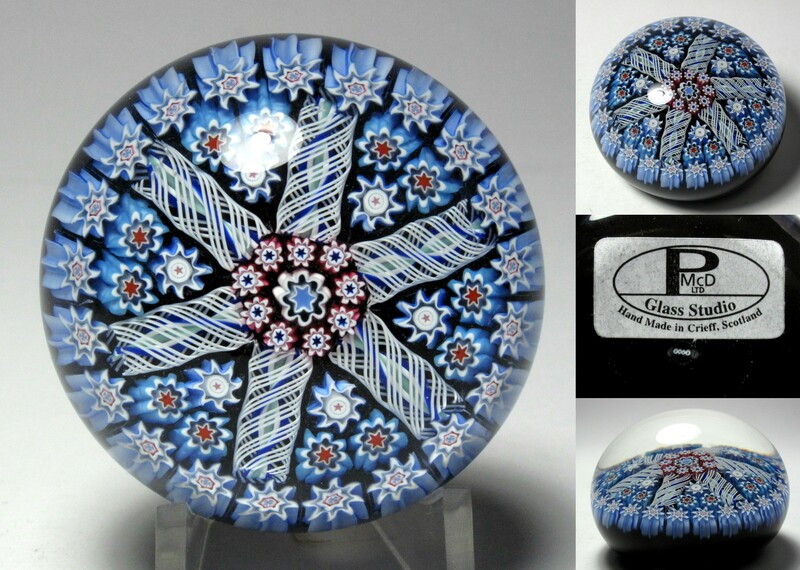 3966 Rare Peter McDougall (PMcD) Miniature Eight Pointed Star Scramble Millefiori Paperweight. 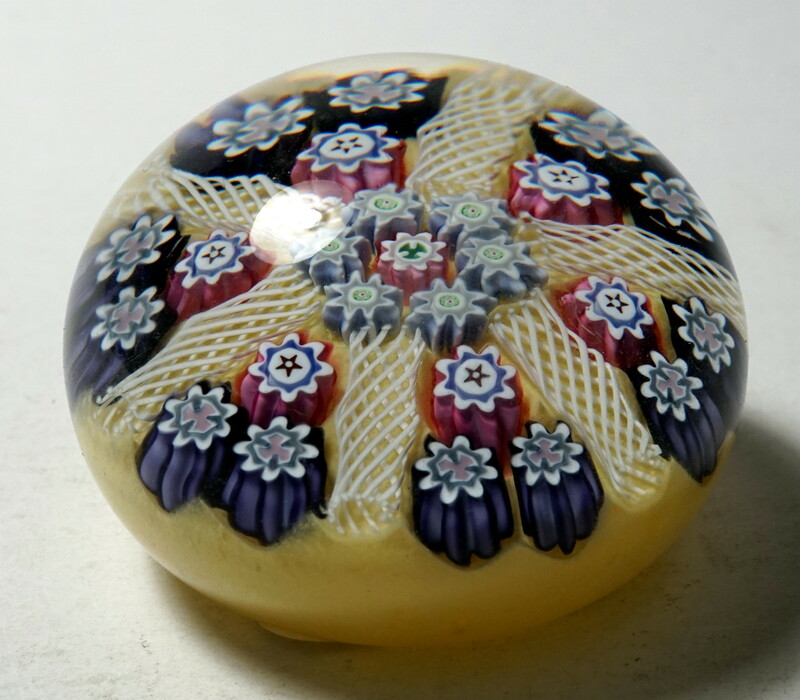 This miniature paperweight features a scramble or end of the day design and is finished as a eight pointed star. The ground is black. 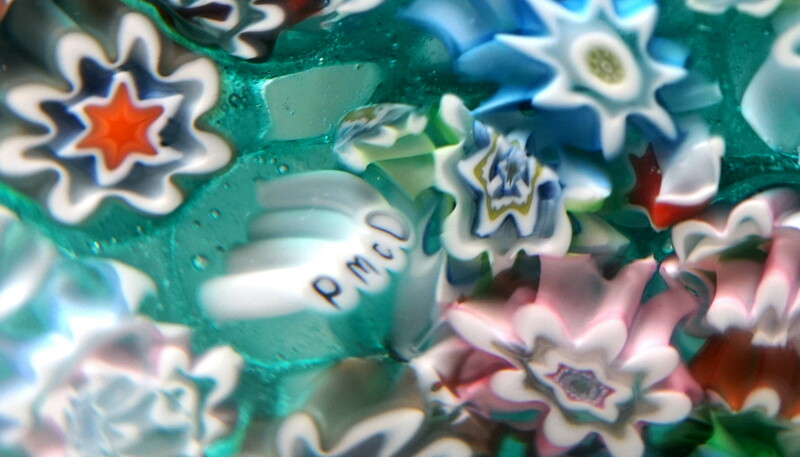 It is signed in the design with a complex cane made from four separate letter canes forming the signature PMcD (as shown in the close-up). 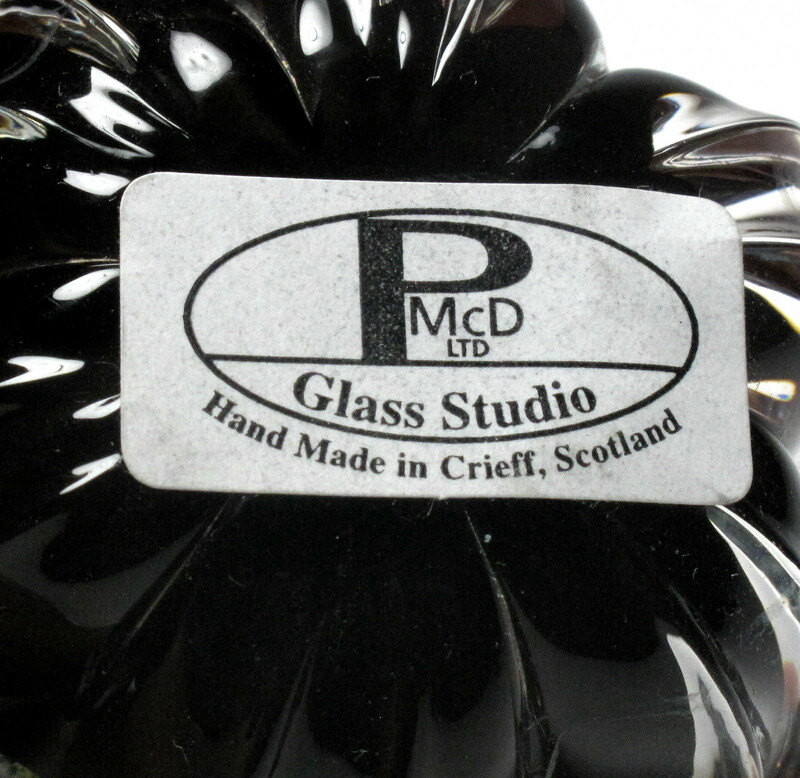 It also has a paper label "PMcD Glass Studio LTD, Hand Made in Crieff Scotland." I am calling this a rare example because it was not part of Peter McDougall's standard offering. 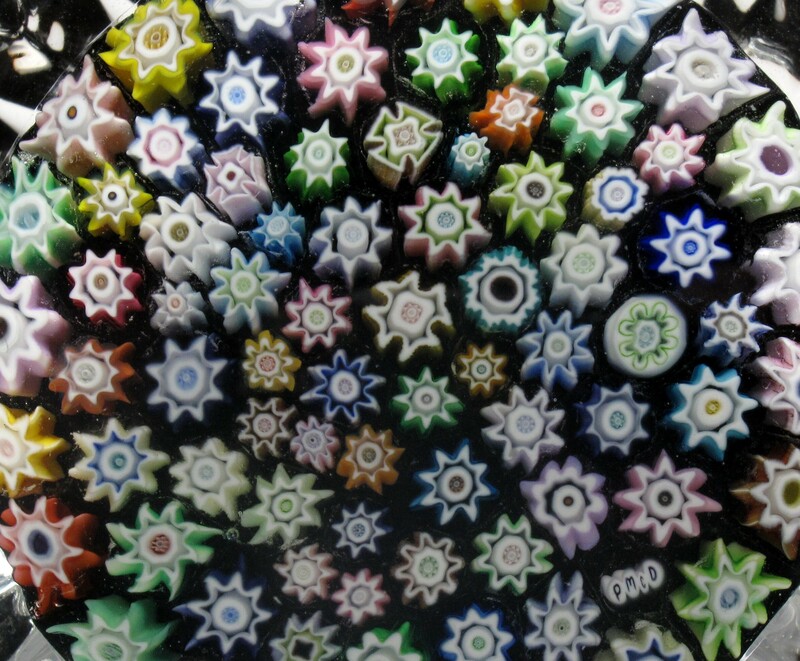 He had a six pointed star that was similar and a small scramble finished as a round paperweight, but I could not find this eight pointed star in his offerings. Miniature Size: Just over 2" diameter by 1 3/16" high. 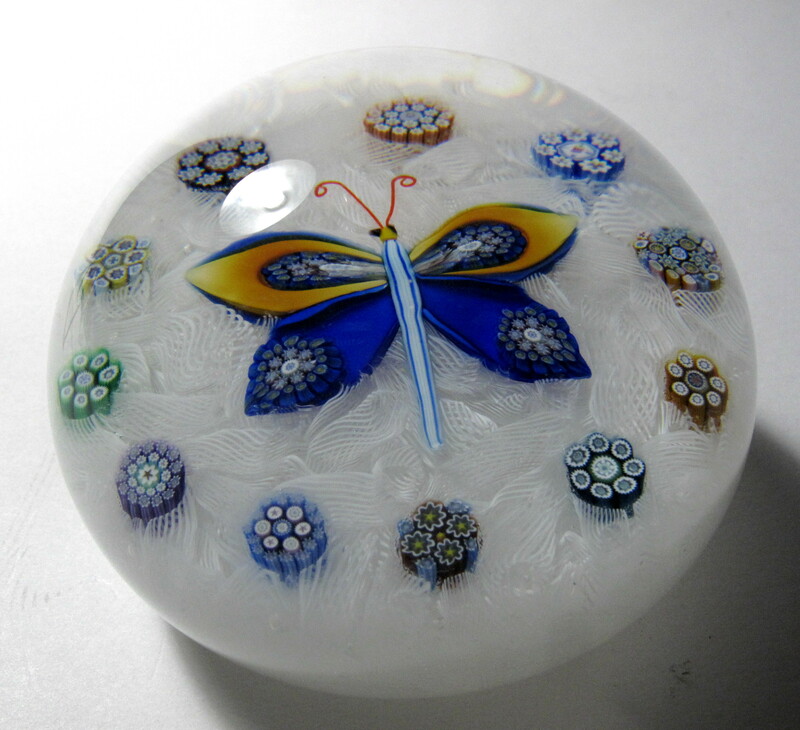 2715 Spectacular Peter McDougall Special 2009 Midyear Collection Butterfly on Lace Paperweight. dated 2009. 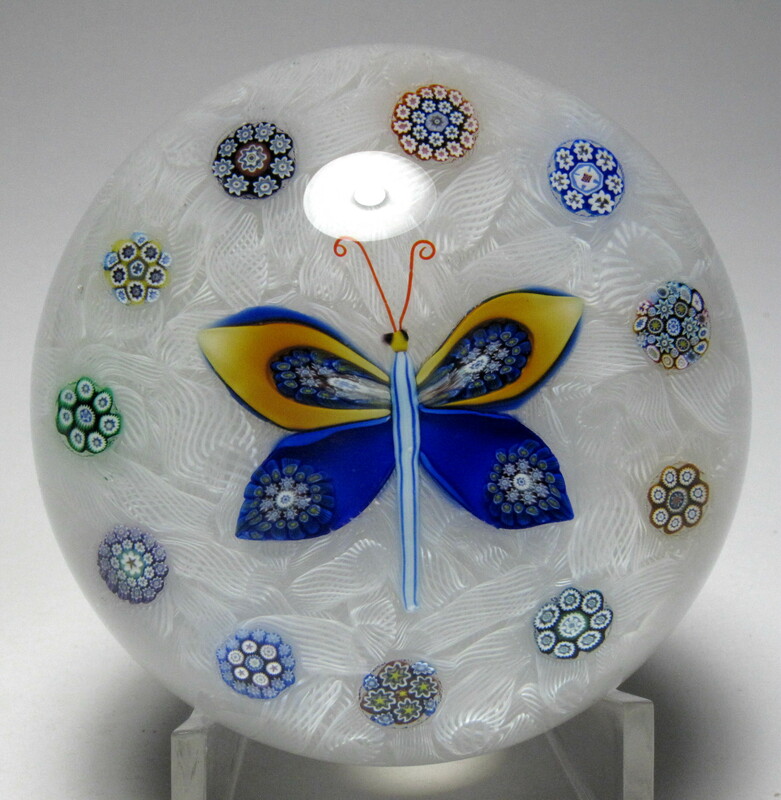 This paperweight features a lampwork butterfly with stretched millefiori wings surrounded by a garland of eleven complex millefiori canes. The design is set on a lace ground. 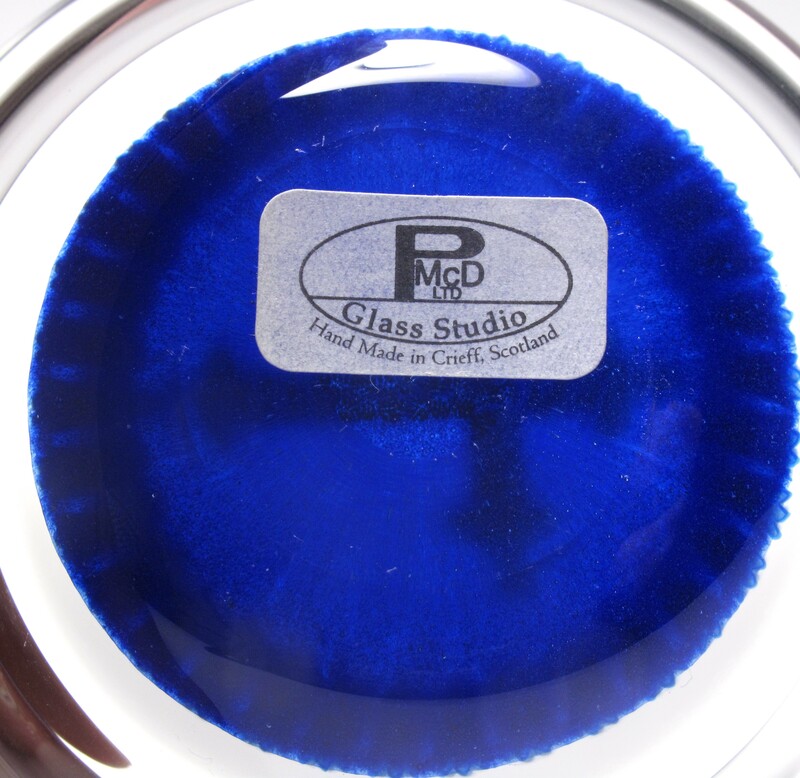 It is signed on the base with Peter's complex signature and date cane "PMcD 09" and also has a paper label "PMcD Glass Studio LTD, Handmade in Crieff Scotland." A nice well balanced design with great color. 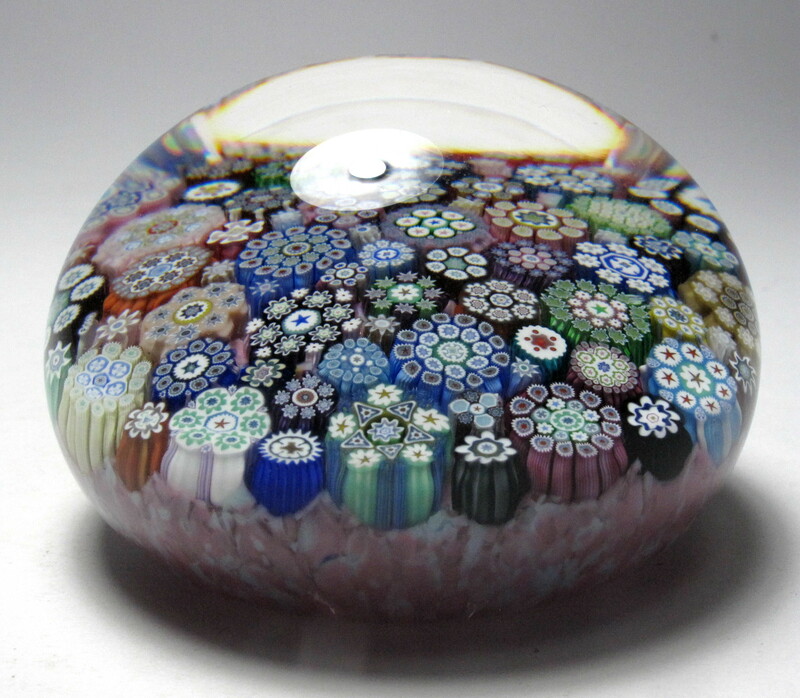 This paperweight was one of the special annual editions made in only in 2009. It was designated Collection 2009 Midyear #6. Large Size: Just over 2 7/8" diameter by 2" high. The base is ground concave. Signature: Signed on the base with a complex "PMcD 09" signature / date cane and it also has a paper label "PMcD Glass Studio LTD, Handmade in Crieff Scotland." 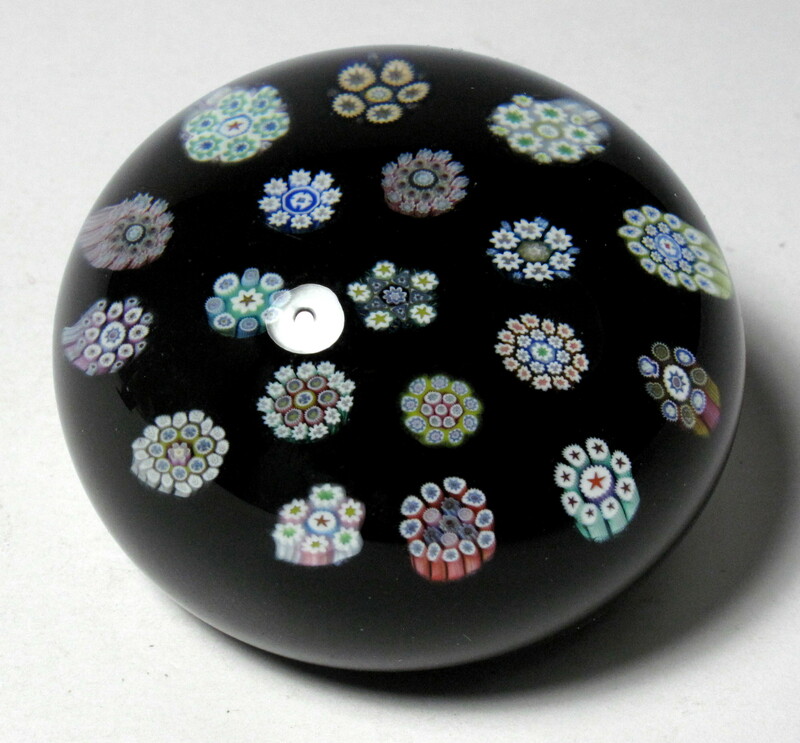 3344 Peter McDougall Small Spaced Complex Millefiori Paperweight. 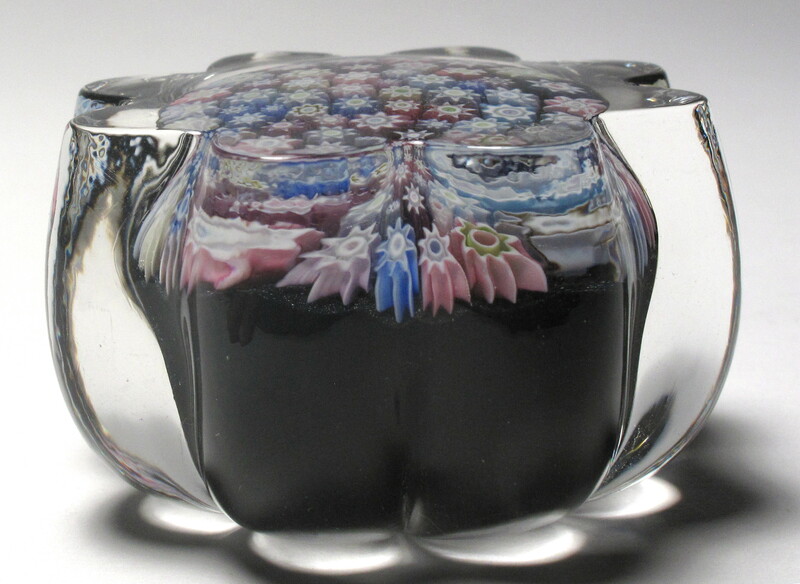 Design from Peter McDougall consisting of 19 different complex millefiori canes over an almost opaque black ground. 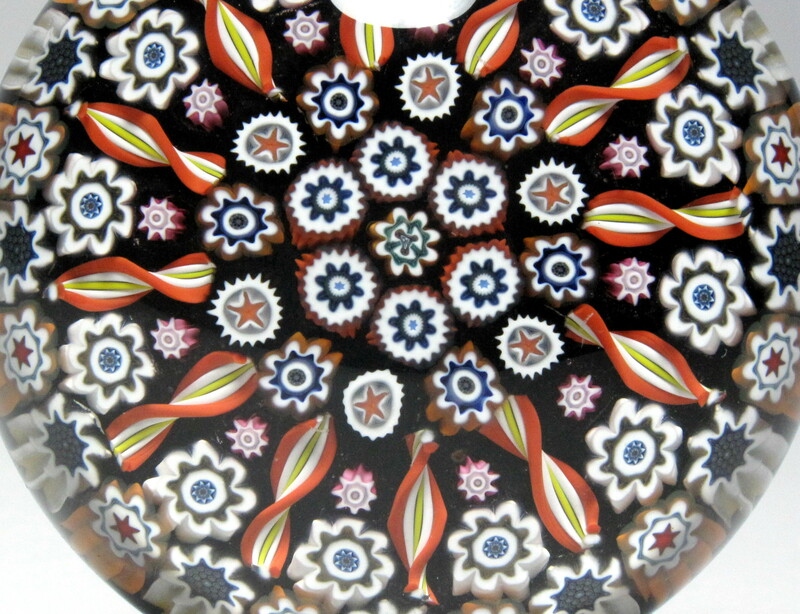 The pattern can be called a concentric, but most collectors would refer to this as a spaced millefiori design. A crisp design with perfect execution. 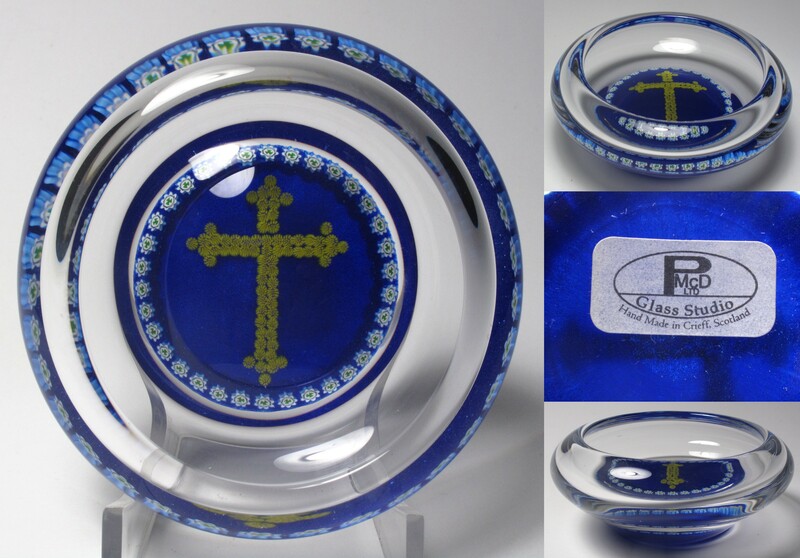 It is signed on the bottom with a complex cane made from four separate letter canes forming the signature PMcD and also has a paper label "PMcD Glass Studio LTD, Handmade in Crieff Scotland." Size: Just over 2 1/8” diameter by just under 1 1/2” high. Signature: Signed with a complex cane on the bottom and it also has a paper label "PMcD Glass Studio LTD, Handmade in Crieff Scotland." 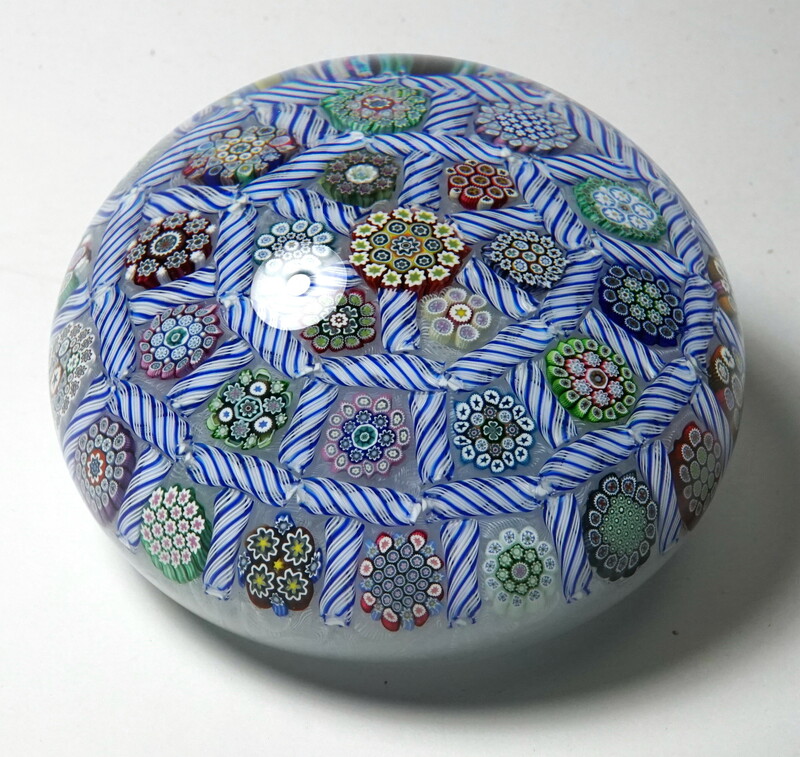 3194 Small Small Peter McDougall (PMcD) Scramble or End of Day Millefiori Paperweight. 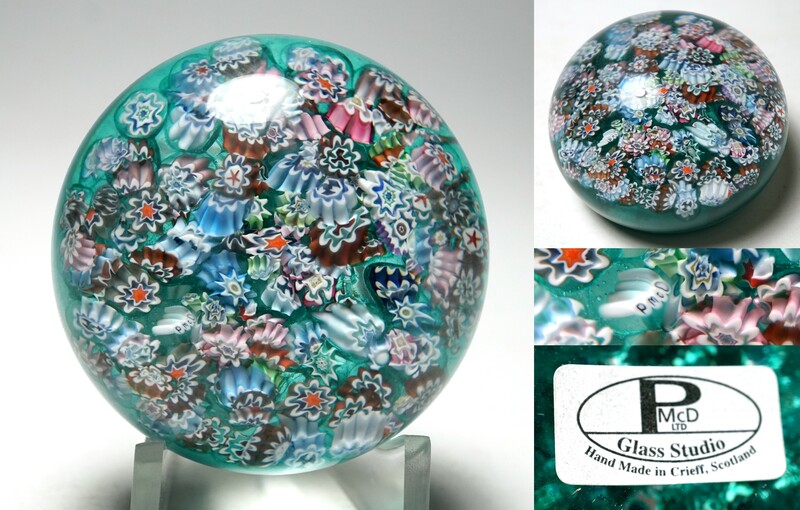 This charming paperweight consists of an end of day design over a translucent turquoise ground. It is one of Peter McDougall's earliest designs. It is signed in the design with a complex cane made from four separate letter canes forming the signature PMcD. 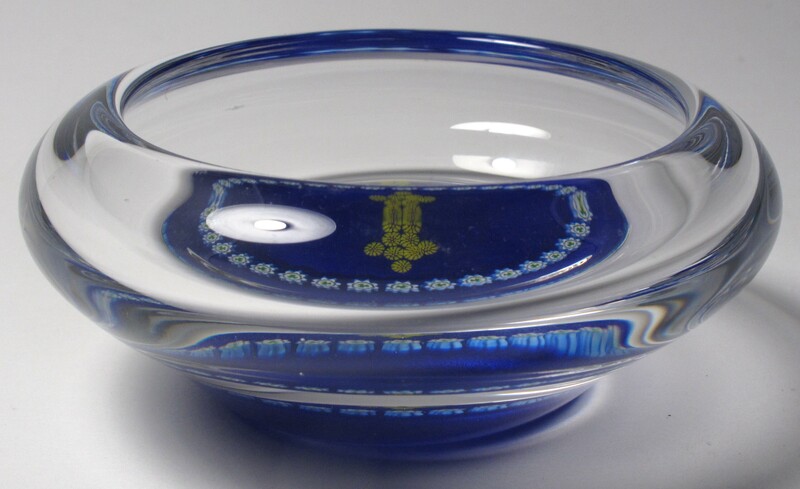 It also has a paper label "PMcD Glass Studio LTD, Handmade in Crieff Scotland" on the base. Note: The picture does not do justice to this paperweight. Ignore the white areas, they are glare from the lights. Size: Just under 2 1/8" diameter by just under 1 1/2" high. Signature: Signed in the design with a PMcD signature cane. 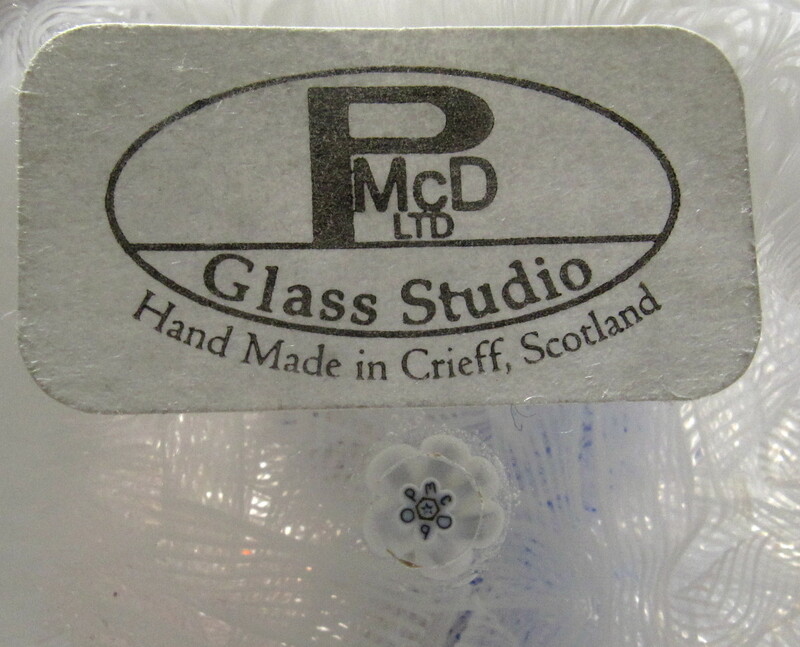 It also has a paper label "PMcD Glass Studio LTD, Handmade in Crieff Scotland."